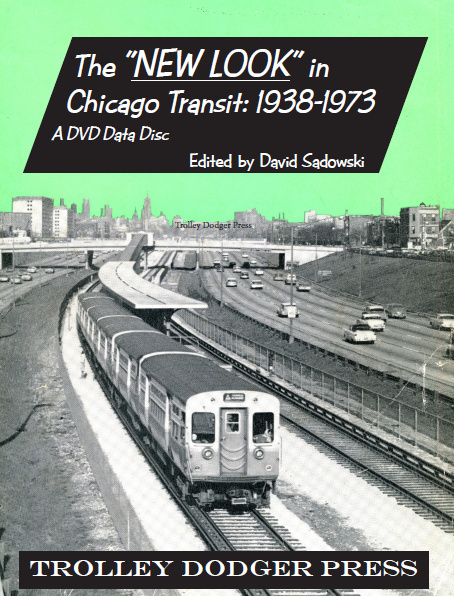 In the first of two posts, as we close out 2015, we are featuring highlights from our recent E-book collection, The “New Look” in Chicago Transit: 1938-1973. 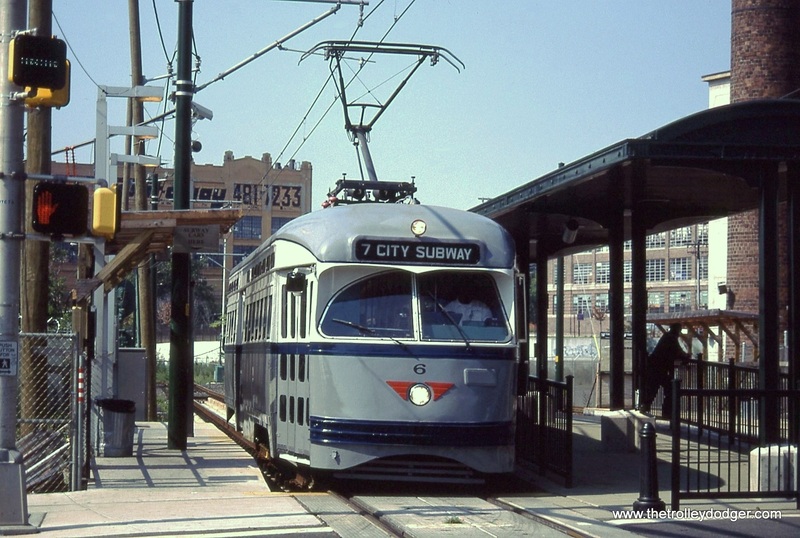 Today’s highlights are from the CTA Transit News and mainly cover the period 1958-61. Watch this space for another helping in a few days. This is our 107th post, and we are gradually creating a body of work and an online resource for the benefit of all railfans, everywhere. To date, we have received over 106,000 page views from 30,500 individuals. South Blvd/Sheridan 1973 out 1990’s inherited from Evanston Bus Co.
From 1951 to 1958, the CTA Dearborn-Milwaukee subway ended at a stub-end terminal at the LaSalle Street station. The original plans were for an underground loop just east of the old Main Post Office, but that was given up in order to save money. In January 1951, a fire threatened CTA’s little-used North Water Street stub terminal, which managed to survive until 1963. 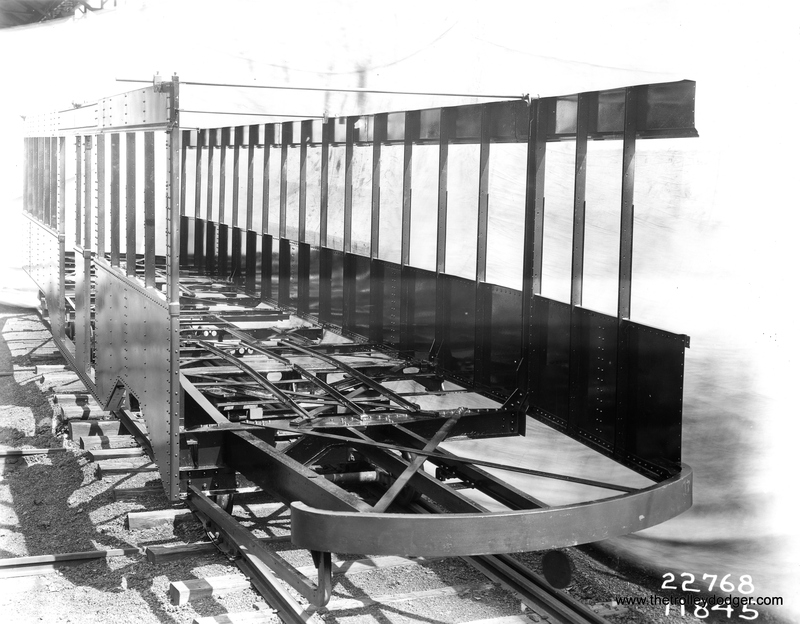 The CTA Transit News included many rare photos of Congress rapid transit line construction. 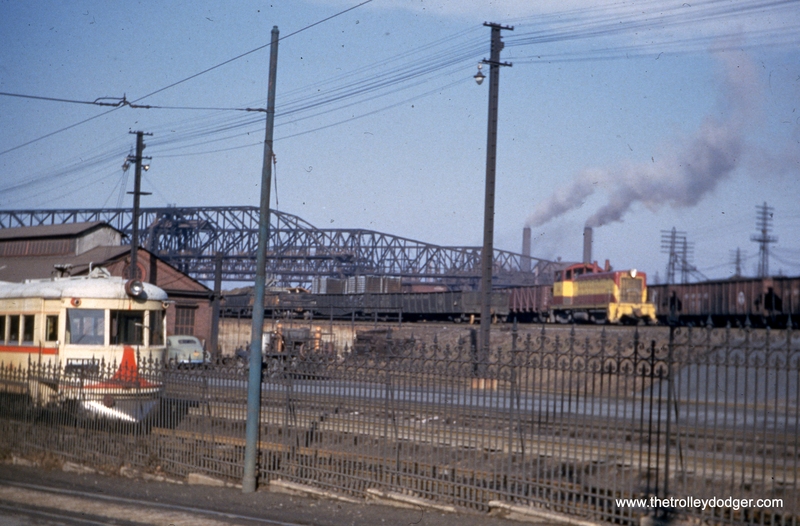 This picture was taken around January 1958 at the DesPlaines terminal and looks to the northeast. While most of the Congress line went into service in June 1958, the portion west of the Lotus tunnel was not finished until 1961. 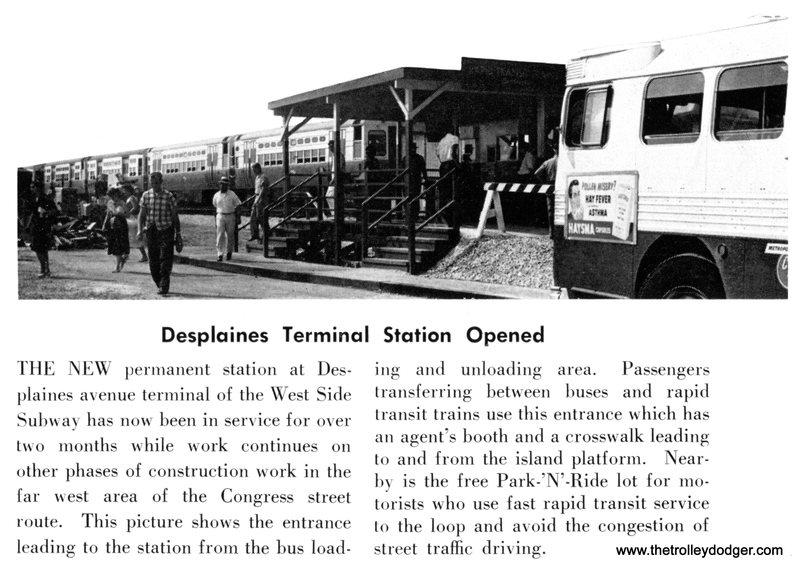 Work in the terminal area continued into 1962. 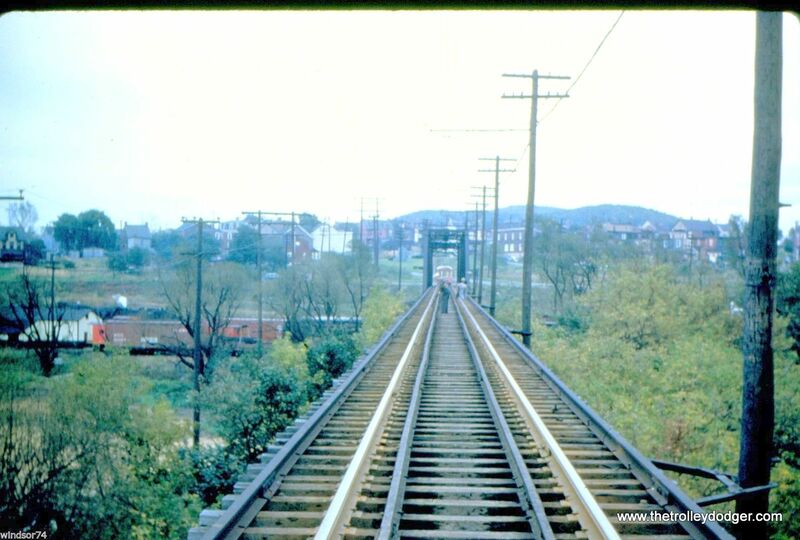 The ramp connecting Congress with Douglas was still being built in February 1958, four months before service began. 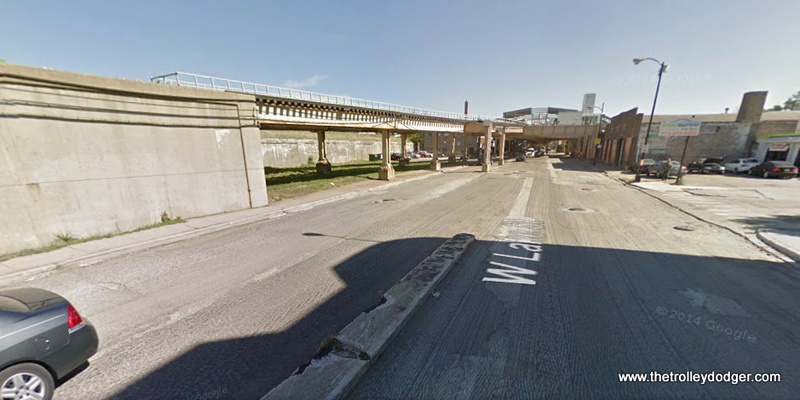 If a similar ramp could have been built to the west of Marshfield, interurban trains of the Chicago, Aurora & Elgin would have been able to access the Loop via the Paulina Connector and the Lake Street “L”, just as the Pink Line (successor to the Douglas Park “L”) does today. 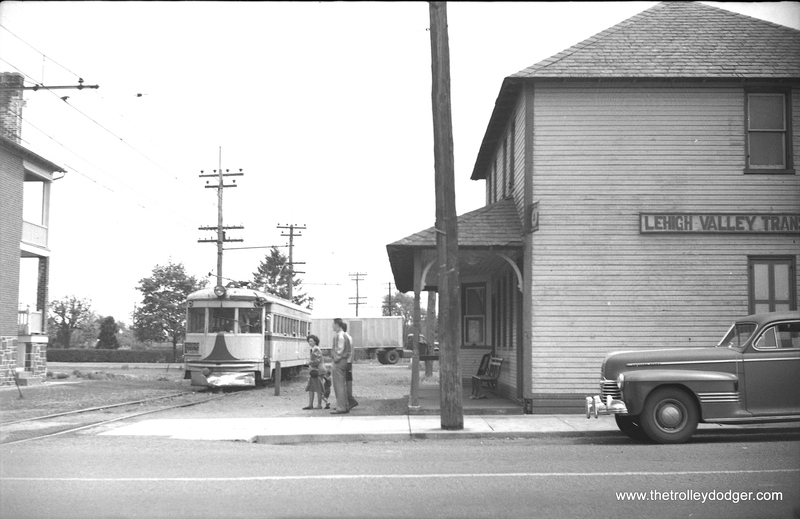 Until 1969, the Englewood branch of the south side “L” ended at Loomis, not a convenient place for bus transfers going north and south. CTA made some improvements, but the ultimate solution was a short extension of the line to nearby Ashland Avenue. This photo is from about February 1958. In May 1958, service continued uninterrupted during major projects. Among many other things, the CTA improved safety and reduced labor costs by replacing manually operated gates with automatic ones, as shown in this April 1958 photo. There was some resistance to automatic gates, since some people thought that manually operated ones were safer. 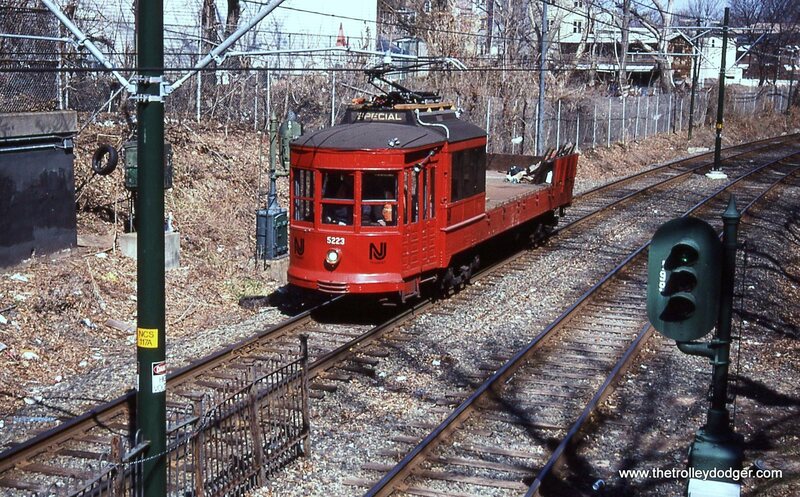 Signal systems, which were primitive on the older “L” lines, were also gradually improved. Automatic block signals were installed in the new subways and the Congress expressway median line. 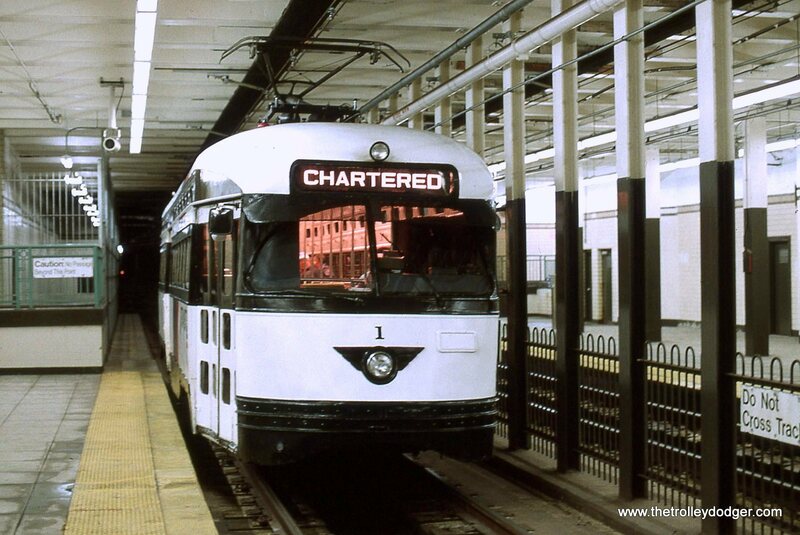 The CTA added “Metropolitan Transit” to its logo early in 1958, to emphasize how their role extended outside the Chicago city limits. 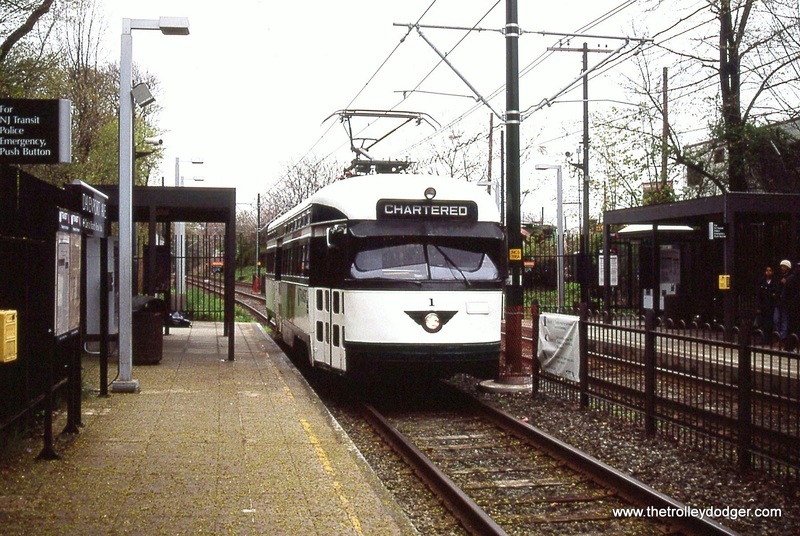 It was during this time that two of the three area interurbans were failing, and CTA unsuccessfully lobbied the Illinois legislature for financial aid that might have made it possible to incorporate larger parts of them into the CTA system. As it turned out, both the Chicago, Aurora & Elgin and Chicago, North Shore & Milwaukee railroads went out of business and were liquidated. Only a few miles of each line survives in the present rapid transit network. 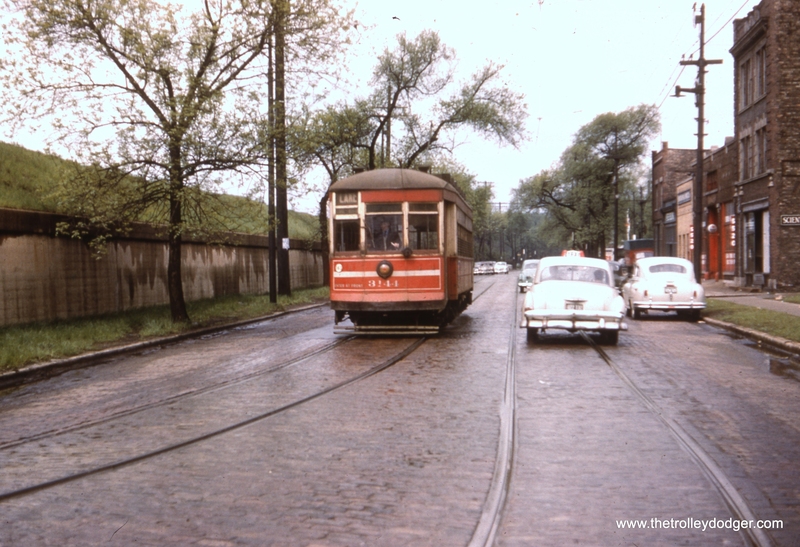 By the time this picture was taken in May 1958, the four-track Metropolitan “L”, shown here near Aberdeen Street, had been shaved back to two, since part of the “L” footprint was needed for the expressway. Behind the two-car train of 6000s there is a ramp leading down to the temporary Van Buren trackage of about 2 ½ miles heading west. 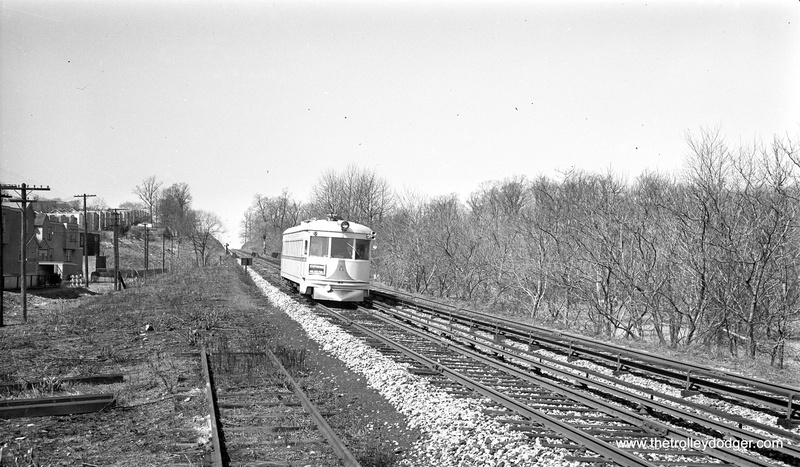 The new Congress median rapid transit line shortly before being put into service. By Spring 1958, work was nearly complete on the ramp connecting the Douglas and Congress lines. 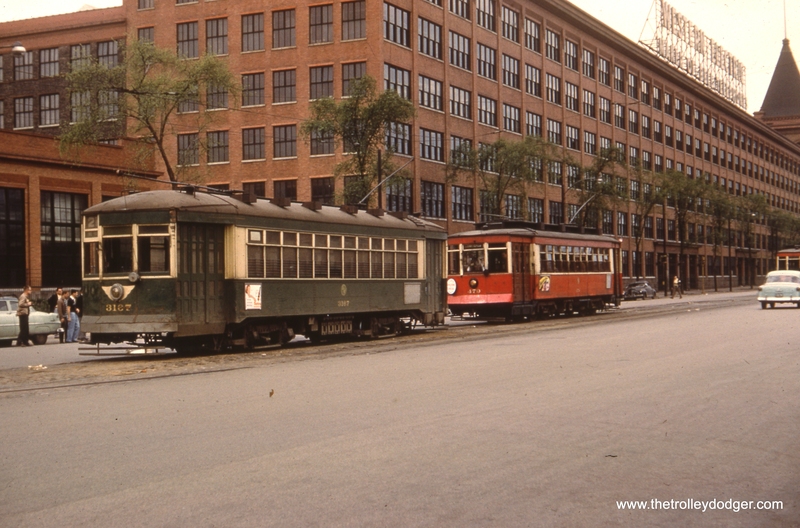 The temporary “L” service in Van Buren Street, which operated from September 1953 to June 1958, shown here at Loomis prior to the demolition of the cavernous Throop street shops at right. The first section of the old Garfield Park “L” to be removed after the opening of the Congress line. The opening of the Congress line was a matter of considerable civic pride for Chicago, the CTA, and Mayor Richard J. Daley. 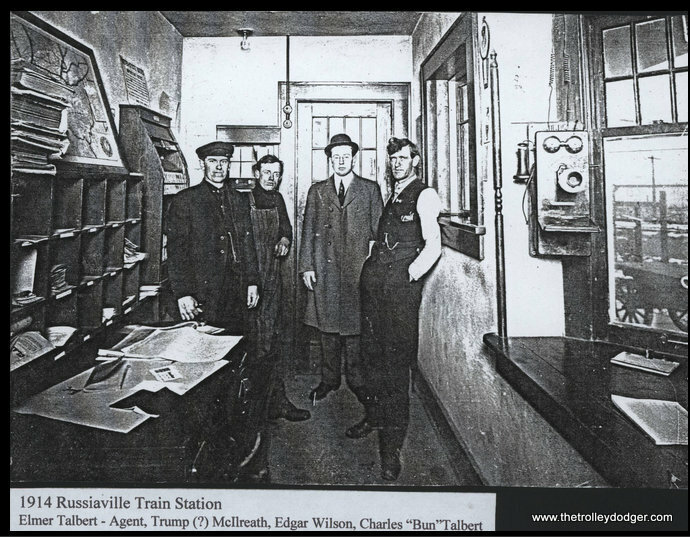 Bob Heinlein, shown here at right during his CTA days, has been a well-known railfan for many years. He’s a great guy. The Congress line, in the median of an expressway, inspired two additional rapid transit extensions in other local highways a decade later. However, such operations are not without problems caused by truck and auto accidents, road salt, noise, wind, poor drainage, or snow. 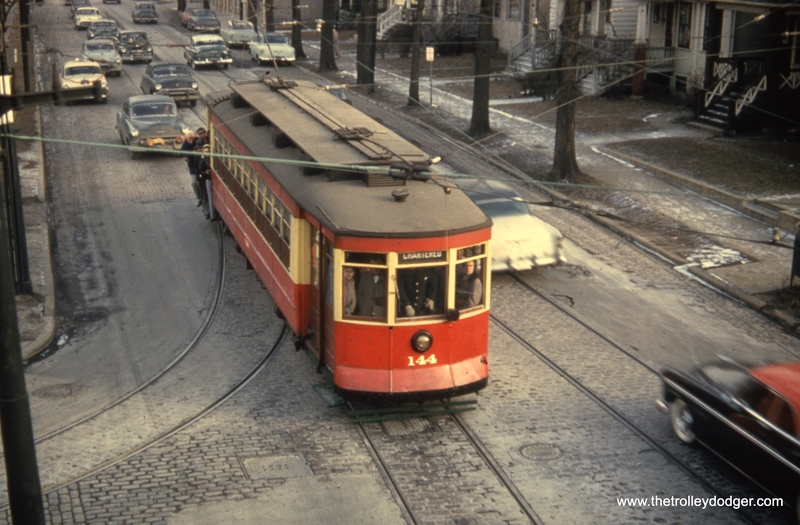 This picture was taken in May 1958 on what was indeed the final operation of a red Pullman (#144) on Chicago streetcar tracks. 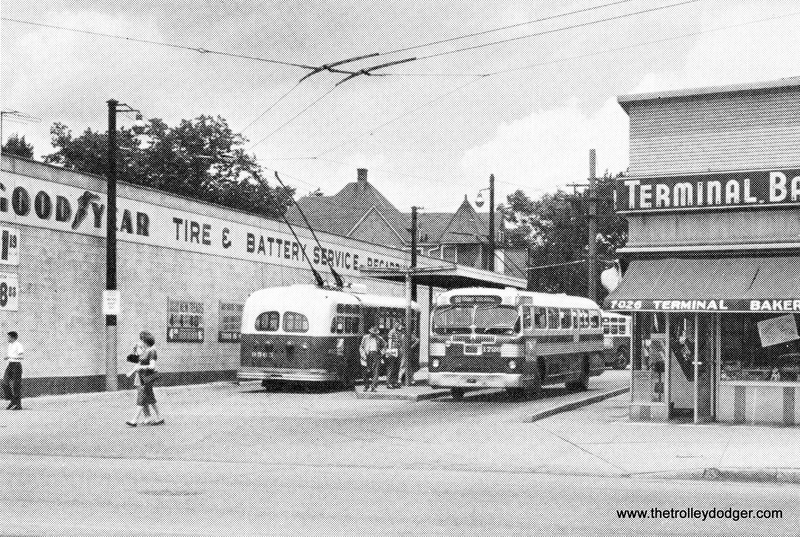 CTA opened a new bus turnaround loop at Irving Park and Neenah in July 1958. This was one of more than 100 such off-street loops. This particular loop is no longer in use and was sold to developers. It is now part of a driveway. 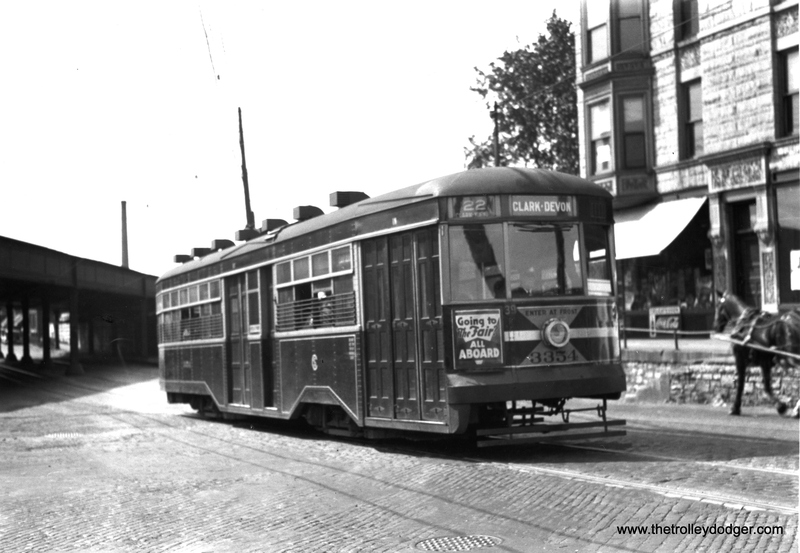 It was originally used by the #80 Irving Park and #86 Narragansett routes. Over time, this loop became superfluous as the 86 was extended farther north and some of the short-turns were eliminated on 80. July 1958. These sections of “L” were very close to the expressway. 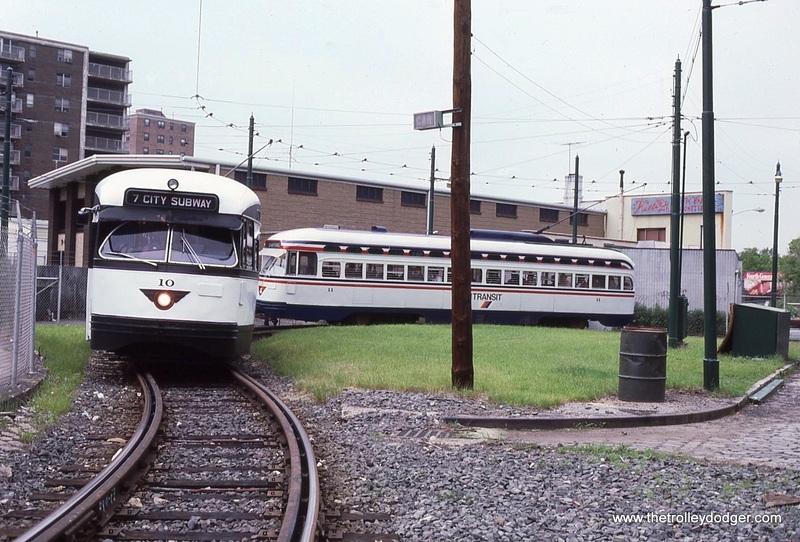 Between 1959 and 1961, CTA embarked on a major construction project to fill a gap in the side “L”, where four tracks went down to two and then four again. Many of CTA’s more than 100 off-street loops were beautifully landscaped, a tradition going back to the 1930s and the Chicago Surface Lines. Unfortunately, over the years many of these manicured green spaces have been replaced by asphalt. The loop at Western and Berwyn today. Those trees in the middle have grown a lot larger in the 56 years since the earlier photo was taken. CSL 6297 at Vincennes and 78th. From the numbers on this photo, I’d say it shows one of the CSL Sedan frames at the J. G. Brill factory in 1929. The interior of CSL 6294 as new, in a 1929 photo at the J. G. Brill plant. Brill built 33 of the 100 “Sedans,” aka Peter Witts. 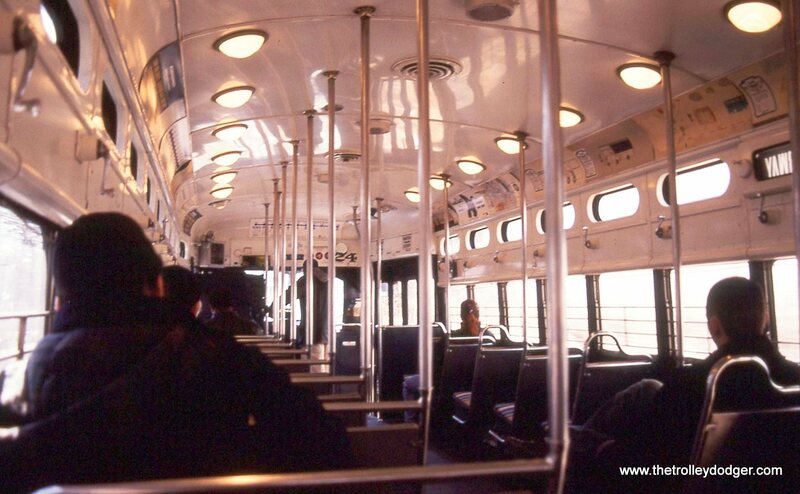 Presumably another interior photo of 6294. These cars had leather seats. 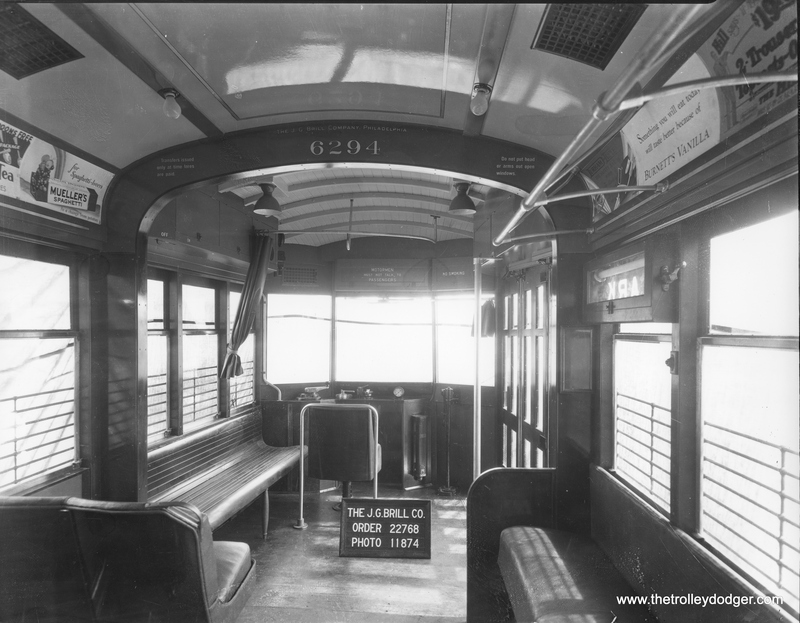 The “bucket” seats remind me a bit of those on Indiana Railroad lightweight high-speed interurban car 65, built two years after this car. 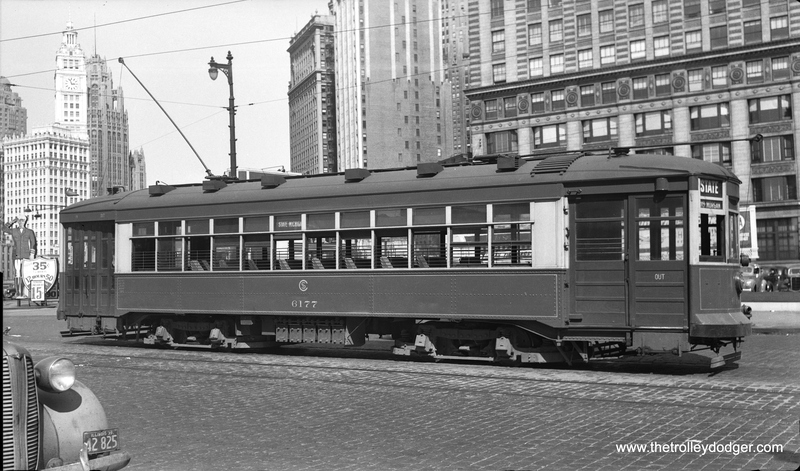 As delivered, the 33 Sedans made for Chicago by J. G. Brill came with 76E2 trucks. However, that was job #22768, which does not match the number in this photo. The Brill list of work orders I consulted does not have a job #22770 on it. 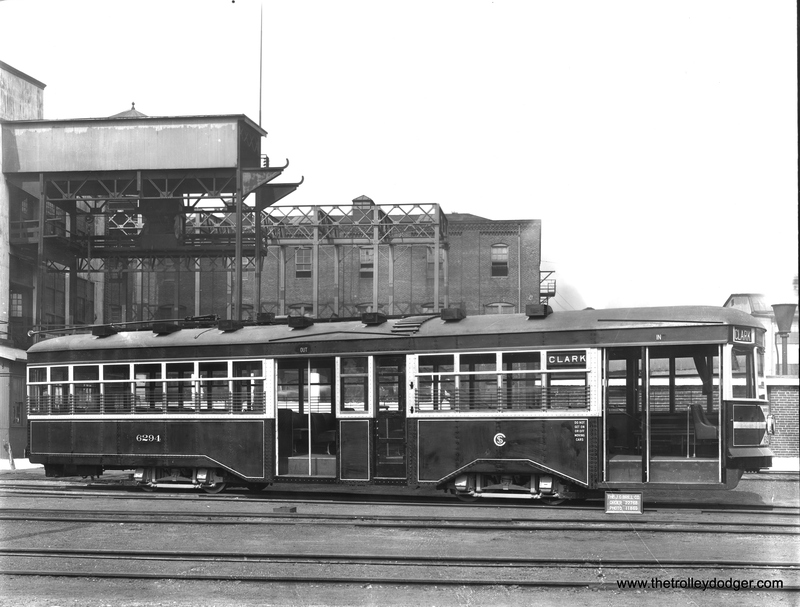 CSL 6294, built for the Chicago City Railway, at the Brill plant in 1929. 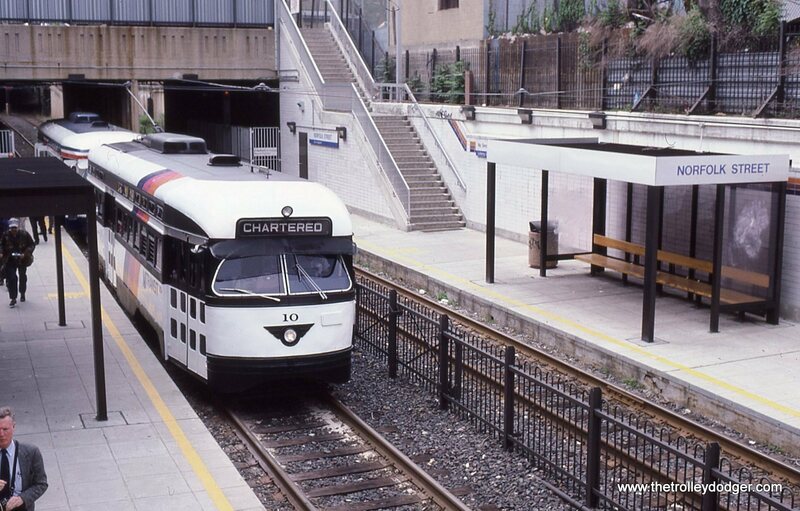 Surface Lines was an “umbrella” that presented a unified transit operator to the public, but it was actually made up of constituent companies. 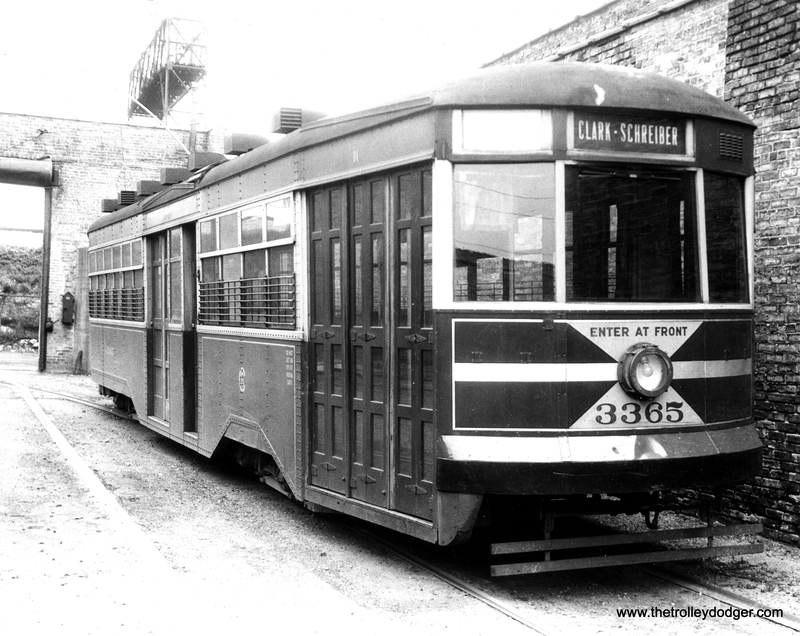 Of the 33 Brill Sedans, 20 were purchased by Chicago Railways and 13 by the Chicago City Railway. 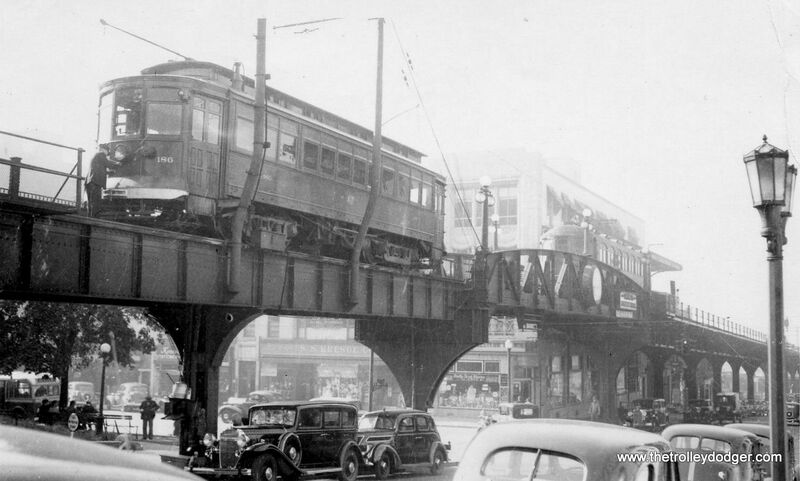 This balkanized arrangement continued until the Chicago Transit Authority took over in 1947. Wentworth and 65th today. As you can see, this matches the view in the previous picture. 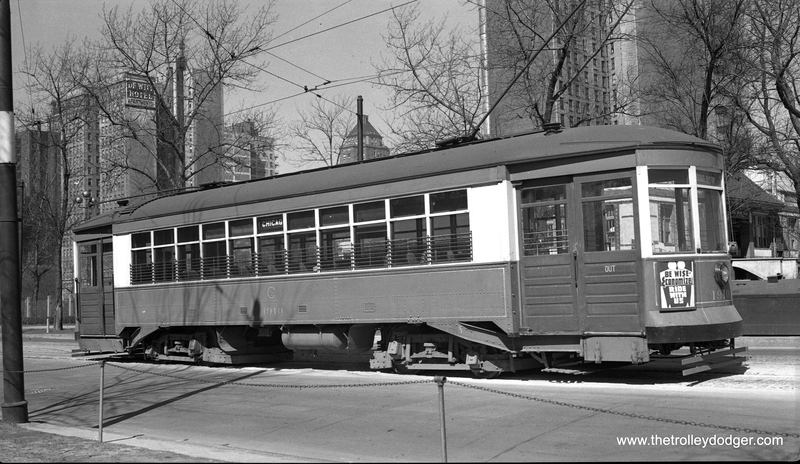 Toronto had 350 Peter Witt cars and 225 similar trailers. The motor cars had even numbers and the trailers had odd numbers. 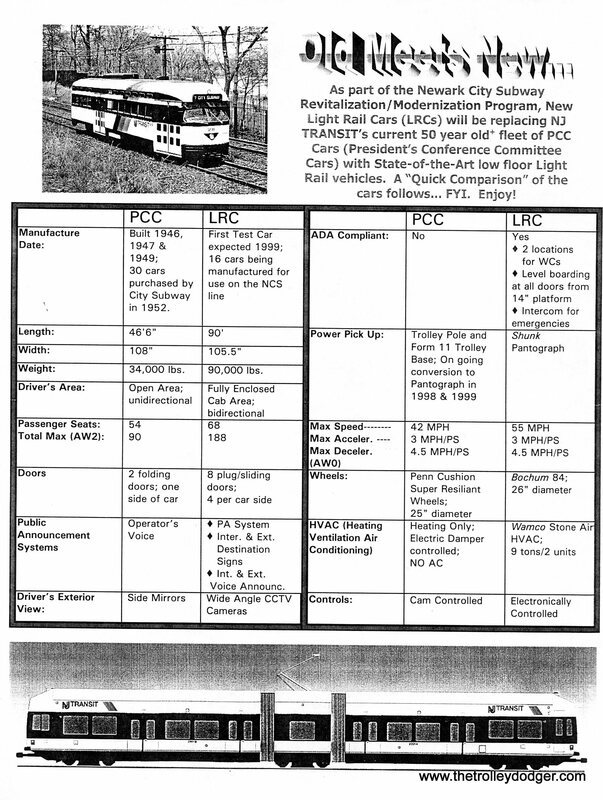 Attached is a Ray F Corley TTC document on the Peter Witt design. PCC 14 outbound at Orange St. Station on March 28, 2001. Today’s article is by guest contributor Kenneth Gear. You’ve heard his name before, since Ken has generously loaned us many Railroad Record Club and other similar records from his collection, so that we could transfer them to audio CDs. Thanks to Ken, we are well on our way towards our goal of making the entire RRC collection available once again. 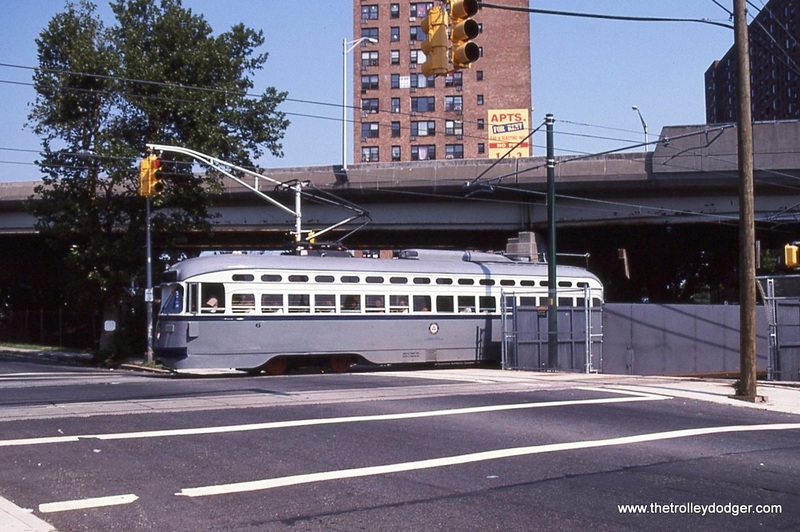 But Ken is also an excellent photographer, with a particular fondness for the PCC cars that ran from 1954 to 2001 in the Newark City Subway. I only rode the line once, in 1991, and you can see a picture I took here. 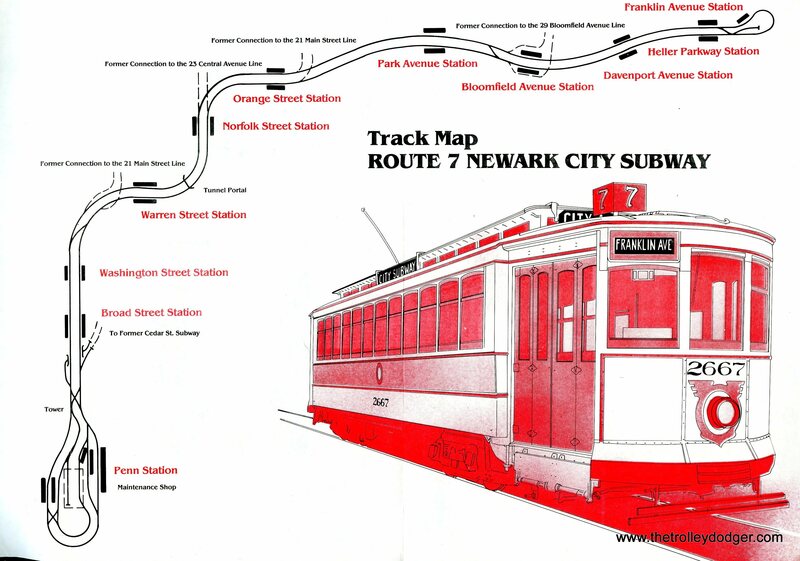 Last year, along with Ray DeGroote, I gave a program about the Newark and Rochester subways, which you can read about here. You will also find an unofficial list there detailing where Newark’s PCCs ended up after they were retired. 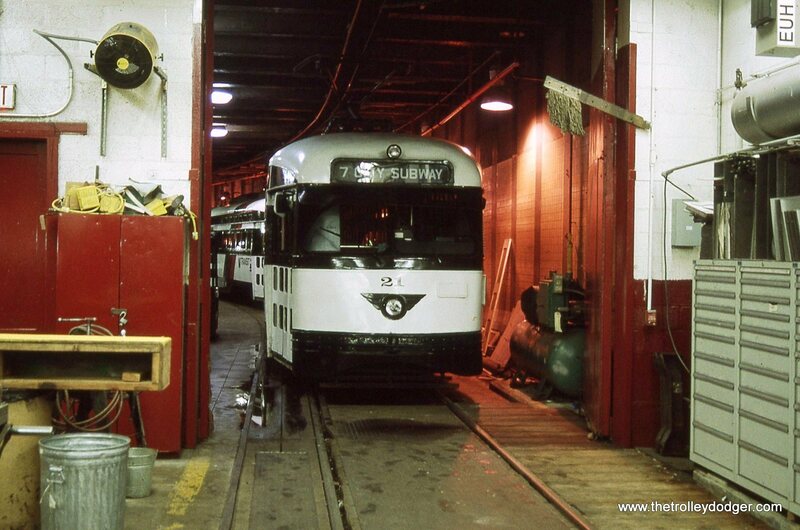 Newark car 4 (ex-Twin Cities Rapid Transit 323) is now at the Illinois Railway Museum. All the Newark PCC photos in today’s post are by Kenneth Gear. This is our 105th post, and we are gradually creating a body of work and an online resource for the benefit of all railfans, everywhere. To date, we have received 103,000 page views from nearly 30,000 individuals. PS- As we approach our one-year anniversary next month, the deadline for renewing our premium WordPress account comes due in less than 30 days. This includes out domain name www.thetrolleydodger.com, much of the storage space we use for the thousands of files posted here, and keep this an ads-free experience for our readers. Your contributions towards this goal are greatly appreciated, in any amount. 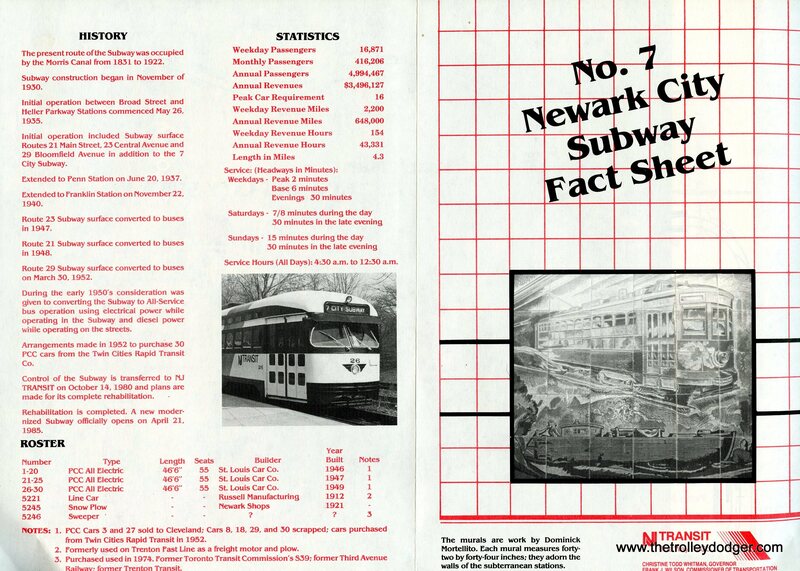 Most of my trips on the Newark City Subway (excepting fan trips) were not railfan photography outings. I rode for the fun of riding a PCC car on an interesting route. I might ride on the spur of the moment because my Amtrak or NJ Transit train wasn’t due for an a while. 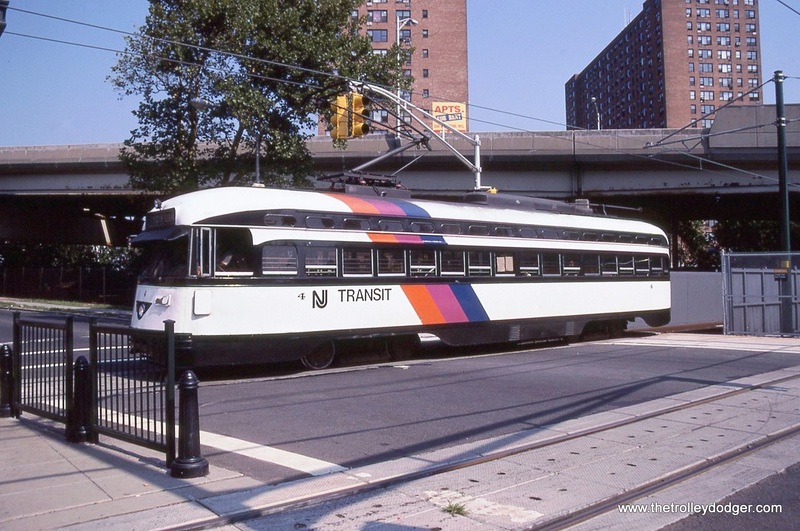 Sometimes when I had a free day I took a NJT Raritan Valley Line train from Dunellen to Newark Penn, bought a coffee, and rode to Franklin Avenue and back. I did on occasion make a photography day out of a trip on the subway. In my opinion there were only a hand full of good photography locations on the entire 4.3 mile length of the line. I tended to shoot these same locations over and over but I wish I would have taken photos at more stations. I went where I knew I’d get good photos and be reasonably safe. The locations were Norfolk Street, the only station I photographed at that was below street level in the old Morris Canal bed. 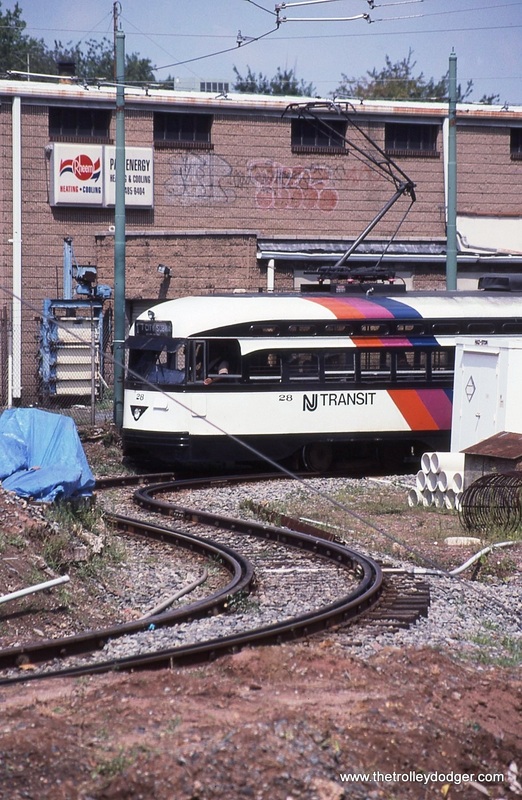 Still visible was sections of the ramp that carried the Route 23 Central Avenue line up to street level. 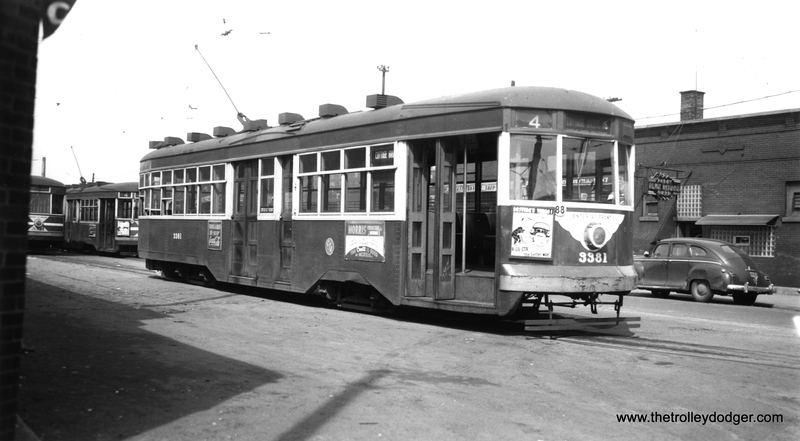 Buses replaced trolleys in 1947. Orange Street was the location I went to the most. It is at street level with plenty of room to move around and even take broadside views of the PCCs as they crossed Orange Street, the only grade crossing on the subway. 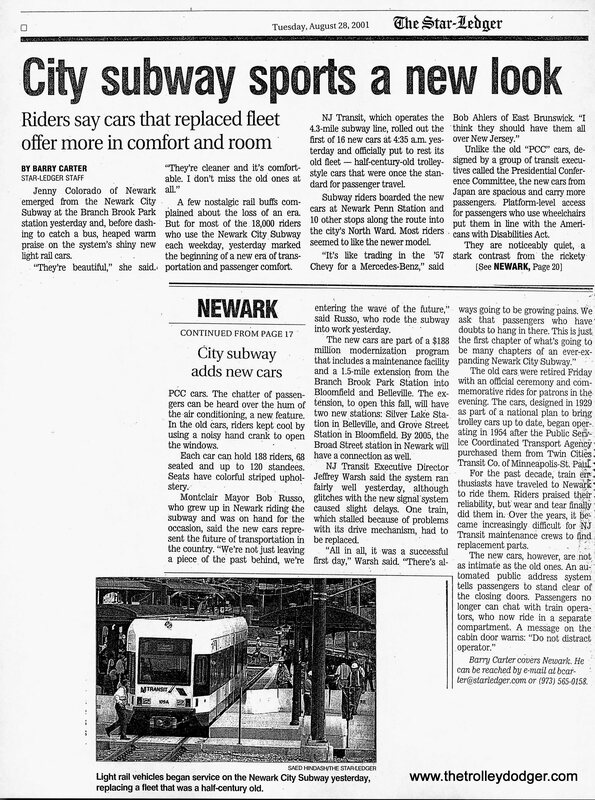 According to the April 1999 issue of RAILPACE both Orange Street and Norfolk Street are “the stops which could pose the greatest safety concerns as the surrounding areas at these locations are blighted”. 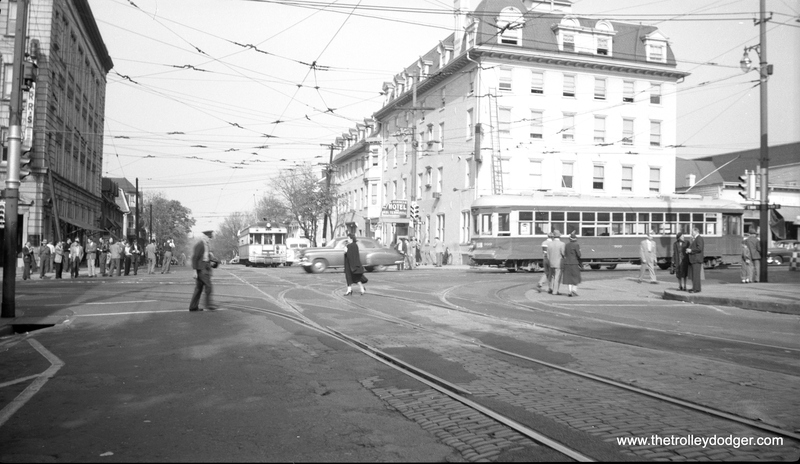 I never felt threatened at either place, in fact my interactions with locals were always pleasant and usually we chatted about the trolleys and how they will be missed. My second most photographed location is Davenport Avenue . I always enjoyed spending time here. It is in a nicely kept neighborhood at the entrance of Branch Brook Park. Elevated photos could be taken from a pedestrian walkway and there was a conveniently located set of vintage signals that, like the PCCs they governed, were on borrowed time. 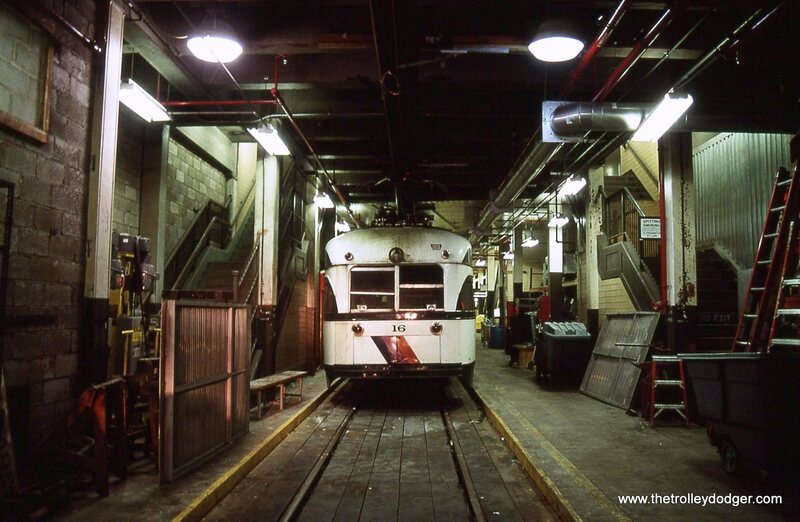 Here in March of 2001 I photographed motor flat # 5223, the only time I saw this car out on the line. This work car was made from Public Service composite car # 2683 in 1954. The car was originally built in 1917! The only other railroad equipment of that age I saw in regular service were the steeple cab locomotives on the Iowa Traction. These electrics seem to be able to stand the test of time! My other photo spot was the end of the line at Franklin Avenue Station. Here was located that wonderful loop track. I really enjoyed the sight and sounds of the PCCs rounding that impossibly tight curve, screeching and clawing their way from being outbound to being inbound. 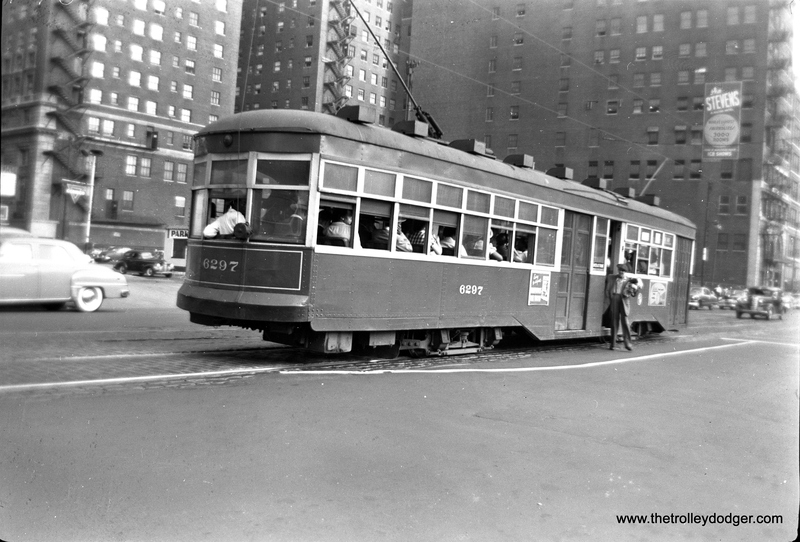 The loop was built around 1940 because the PCCs being single ended, needed a means of changing direction. 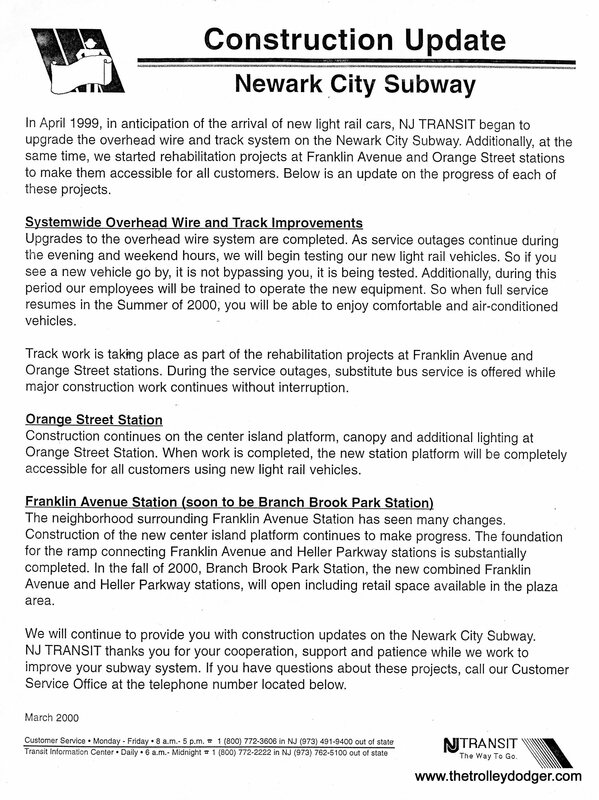 The loop is now gone, Franklin Avenue Station is now called Branch Brook Park Station and , of coarse, the PCCs are long gone. 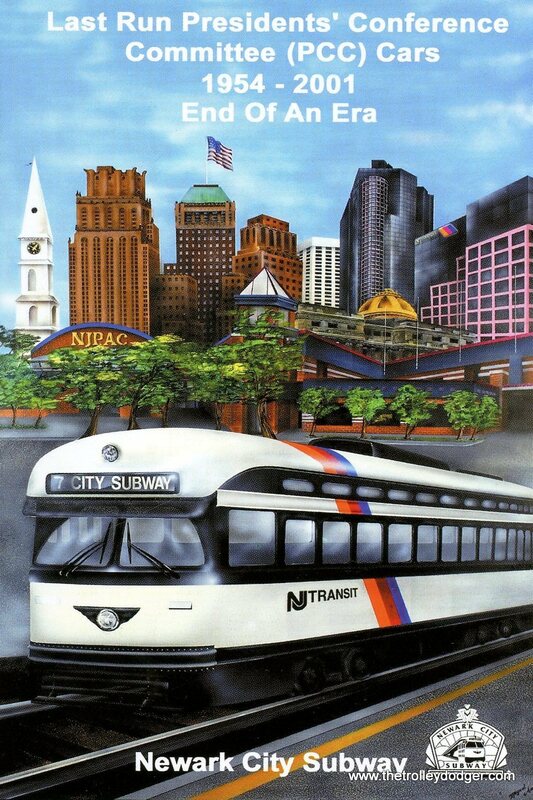 On August 24th 2001 I rode the Newark City Subway for the last time. 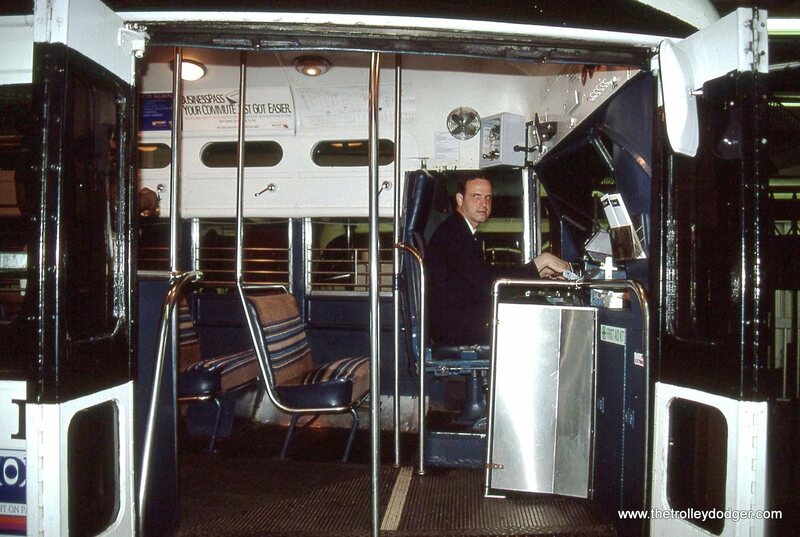 That was the last day of PCC car service. The cars had been running since 1954, but it sure seemed to me that they still had a lot more life left in them. 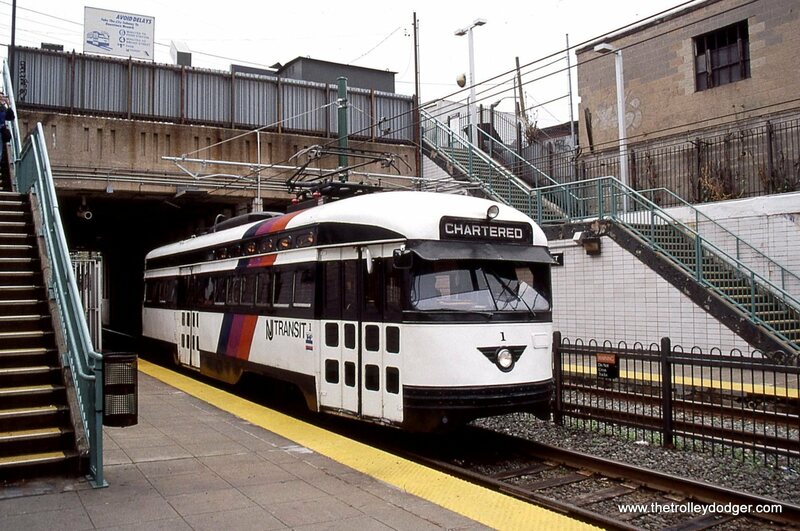 NJ Transit, to their credit, did a nice job of giving these cars a grand send-off. 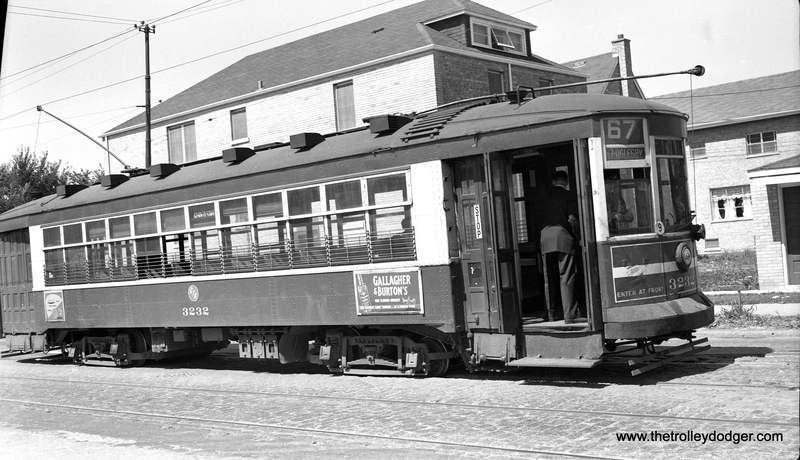 Car # 6 was painted in the grey paint scheme of Public Service Coordinated Transport. It looked great in it’s new shiny paint on that warm sunny day. It was quite a nice gesture for NJT to completely repaint a piece of equipment that only had one more day of revenue service. 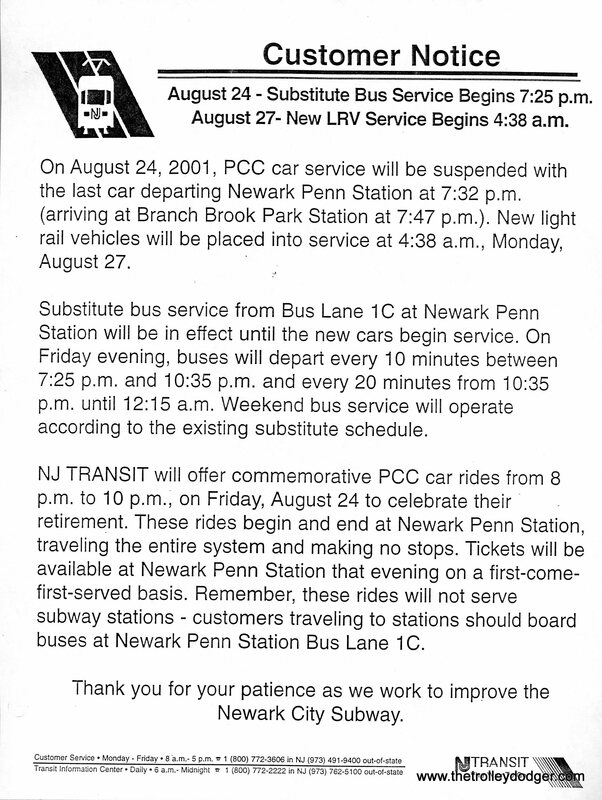 This wasn’t only the end of the PCC era this was, after all, August of 2001. We all know what would happen on the 11th of the following month and railfanning the subway, or any place other place would never be the same. 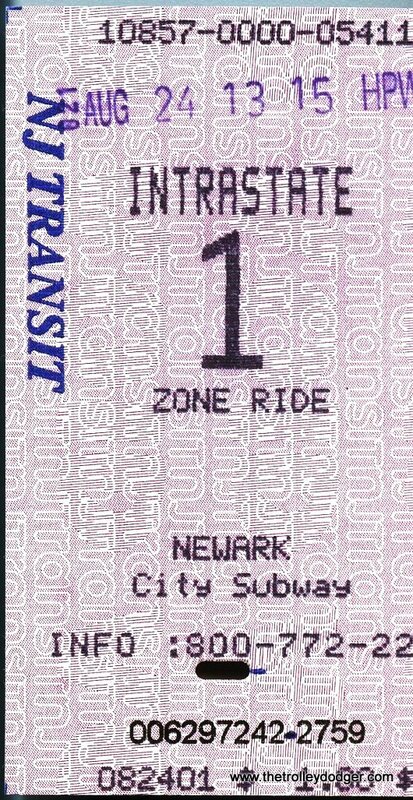 This batch is from the first time I rode the Newark subway. It is also the only time I photographed the PCCs before they were equipped with pantographs. The occasion was an Electric Railroad’s Association fan trip that ran on May 24, 1987. In the morning we rode a farewell to the PATH K class cars and after lunch we rode the subway and toured the shop at Penn Station. My tripod was accidently left at home so I got very few useable photos of the shop. Somehow I managed to get a fairly good shot of the snow sweeper. 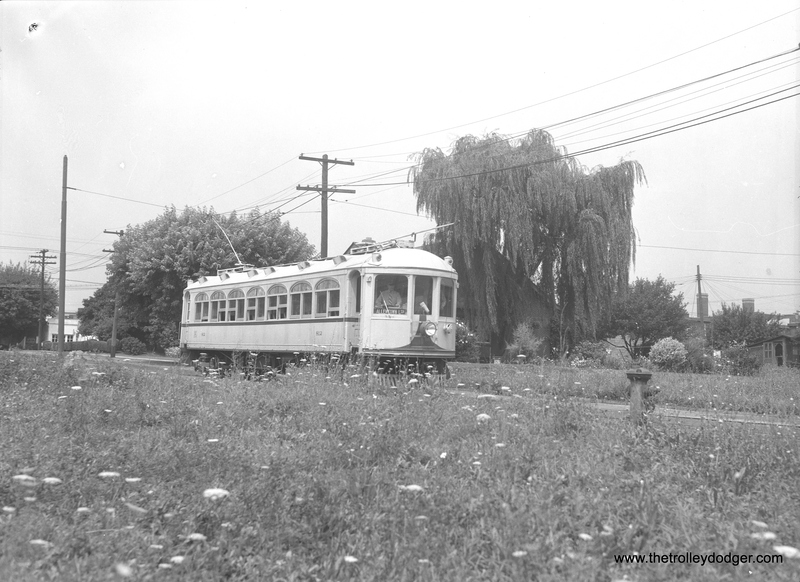 PCC 10 makes a photo stop at Davenport Avenue Station. 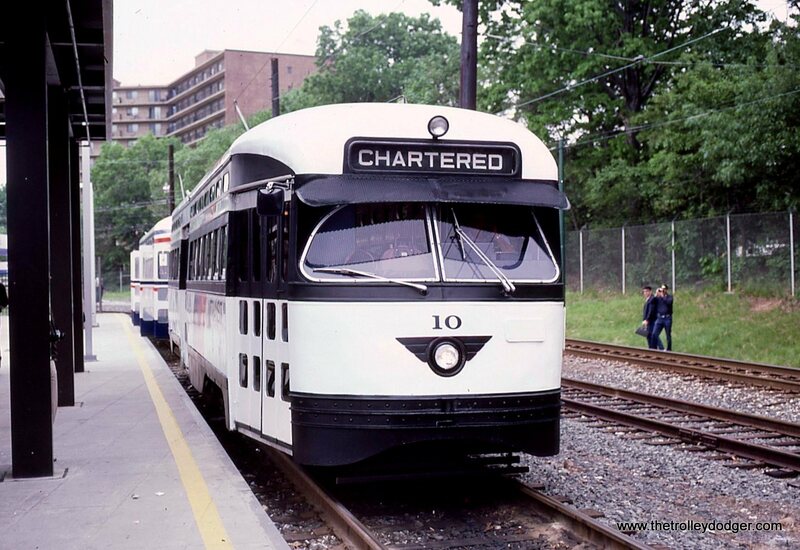 PCC 10 at Franklin Avenue station in Branch Brook Park. 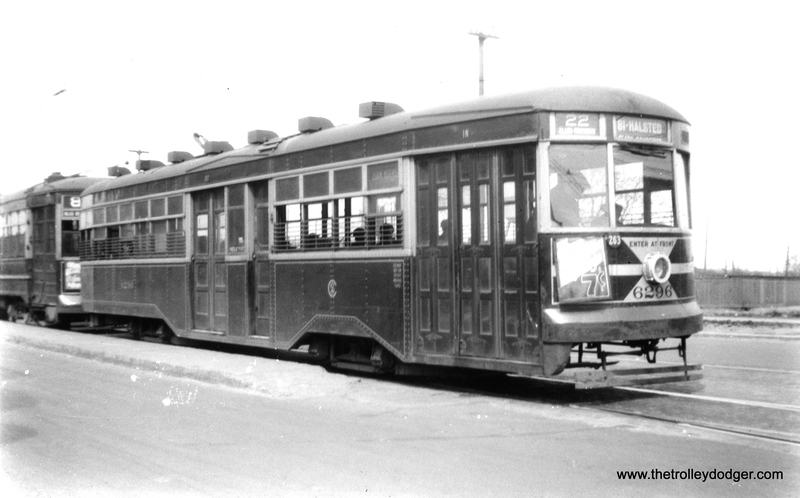 PCC 10 was built by St. Louis car in 1946. No. 10 at Norfolk Street. This station is where the connection to the 23 Central Avenue Line once left the subway by means of ramps. 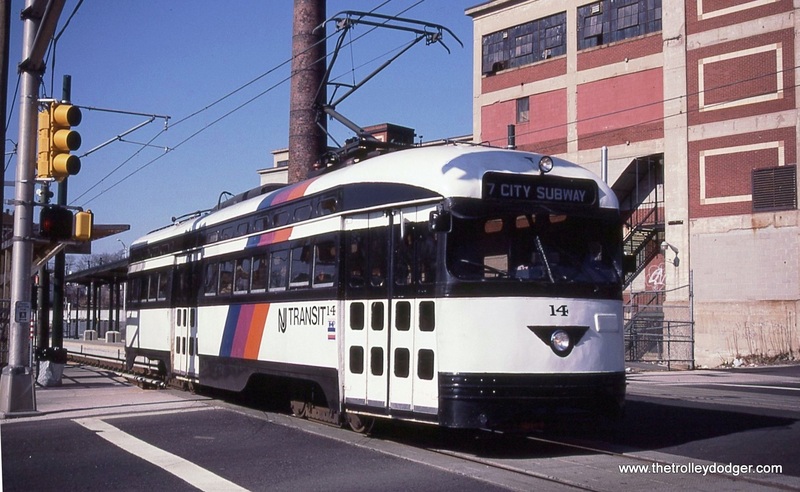 PCC 11, still in the Transport of New Jersey Bicentennial colors, is stopped at the soon to be replaced Orange Street Station. Here the subway crosses over the ex-DL&W Morris & Essex Line and the bridge is in need of replacement. 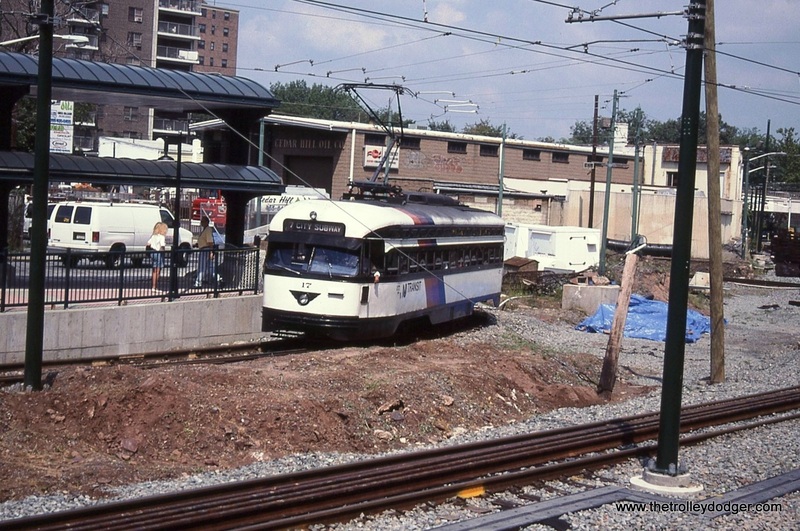 To accommodate this work the station was moved across Orange Street to it’s present site. 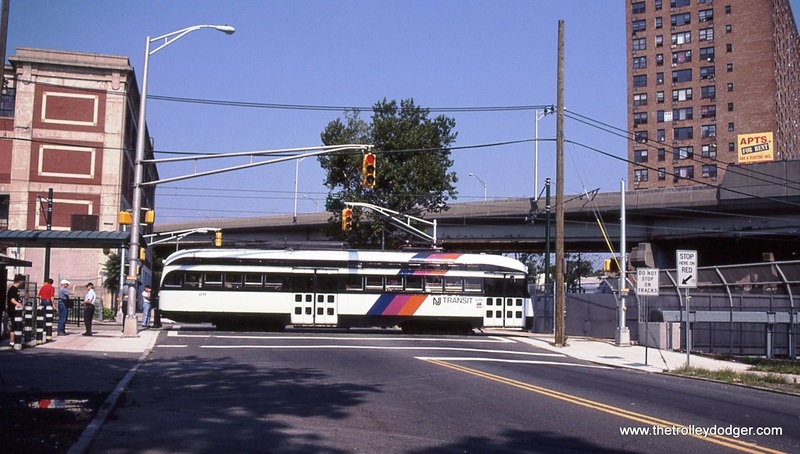 PCCs being readied for the NJ Transit “Disco Stripes” paint job. 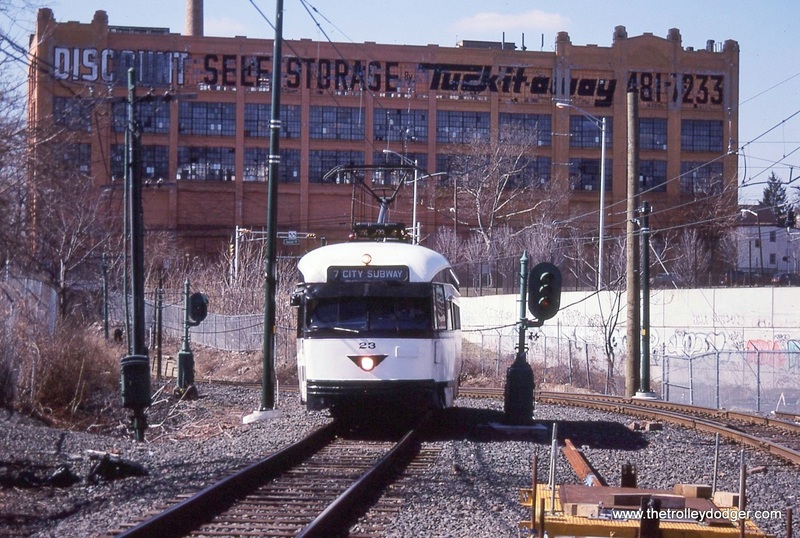 A going away shot of PCC 15 in TNJ colors, inbound, leaving Franklin Avenue. 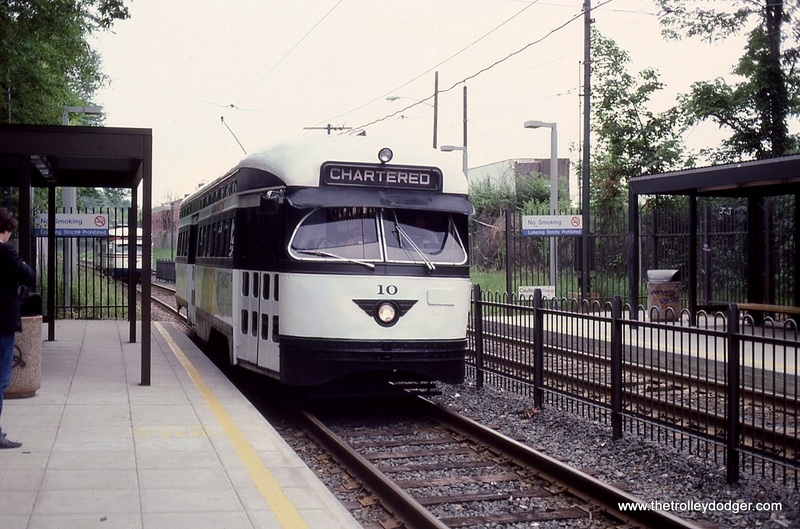 PCCs 10 & 11 on the Franklin Avenue loop. Cars 10 & 11 during a photo stop at the Franklin Avenue station. 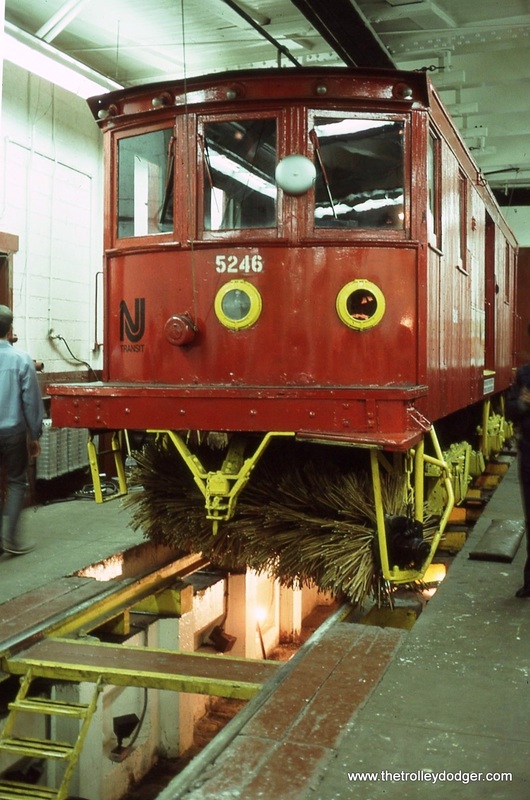 Snow sweeper #5246 in the shop area of Penn Station. Number 5426 was built by Russell in 1921. 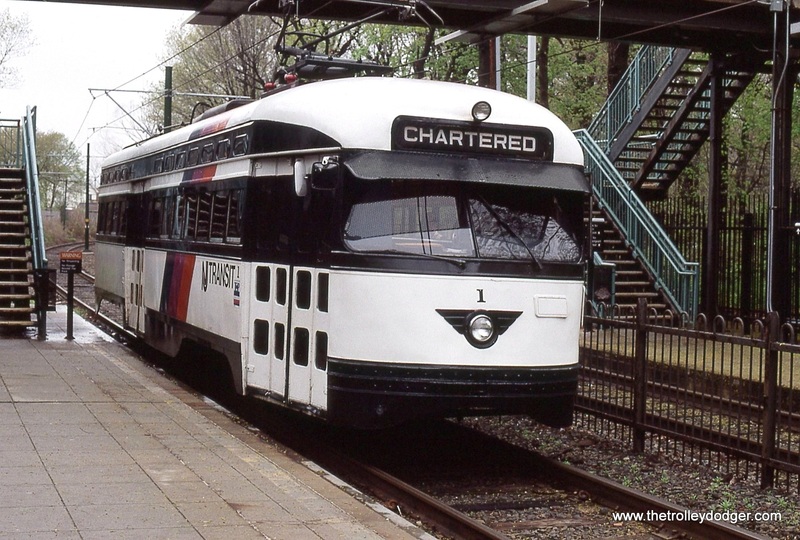 It was built for the Trenton & Mercer County, Trenton Transit as number 51. 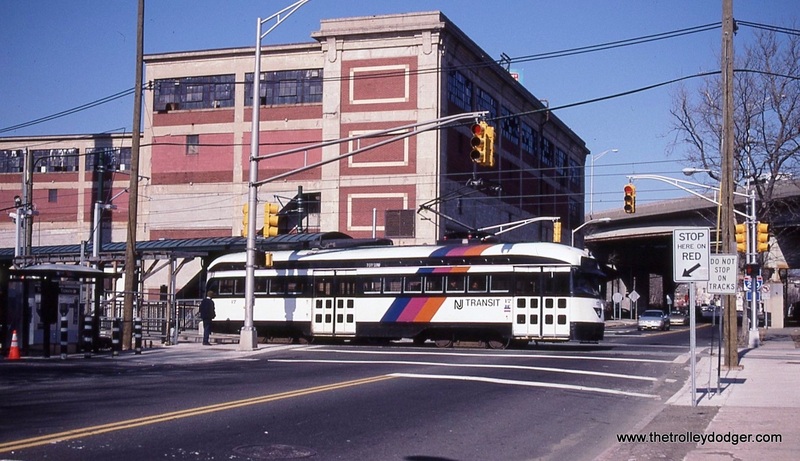 NJ Transit PCC 1 makes a photo stop at Davenport Ave.
A wider shot of PCC 1 at Davenport Avenue. This is one of my favorite PCC photos. It shows car 15 seen from inside car 1 near Franklin Street. Number 1 is inbound while 15 is, of coarse, outbound. 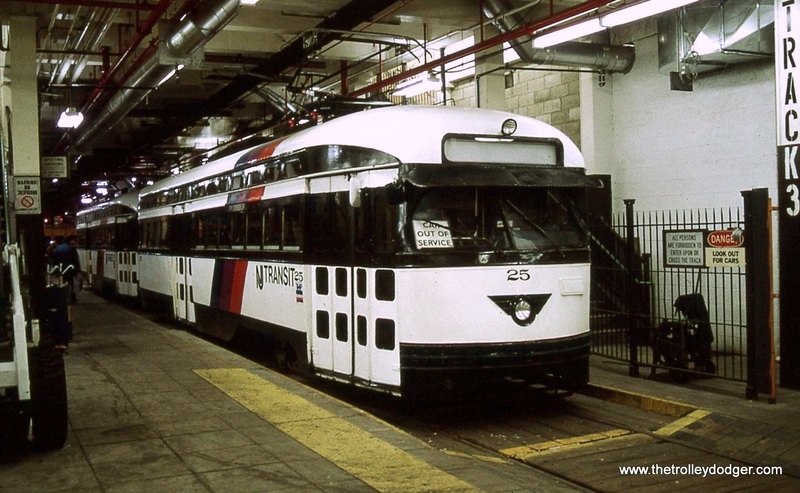 PCC 23 is outbound at Franklin Avenue, it will soon go around the loop track and become inbound (to Penn Station). The construction work in preparation of the new LRV cars is in evidence along the right of way here. 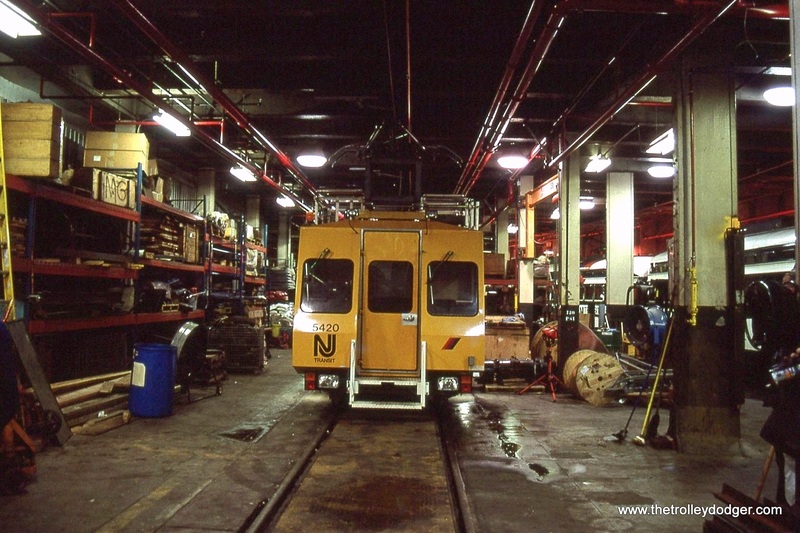 NJT PCC all electric PCC 1 at Norfolk Street Station “chartered” for a fan trip. 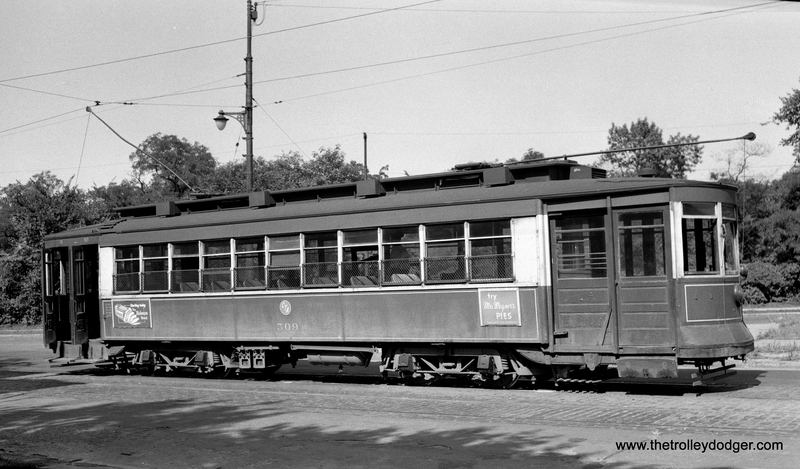 Car 1 is again in front of the fan’s cameras as it poses for even more photos at Franklin Avenue. We made several trips of the entire subway. Cars 1 and 19 pass at Davenport Avenue. 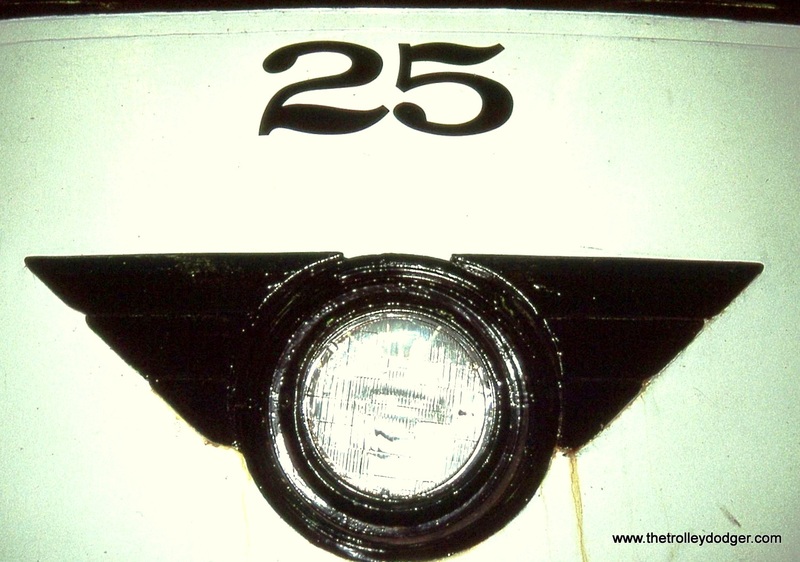 The famous art deco headlight wings on PCC 25. After taking tons of photos of car 1, we toured the Penn Station subway shop. 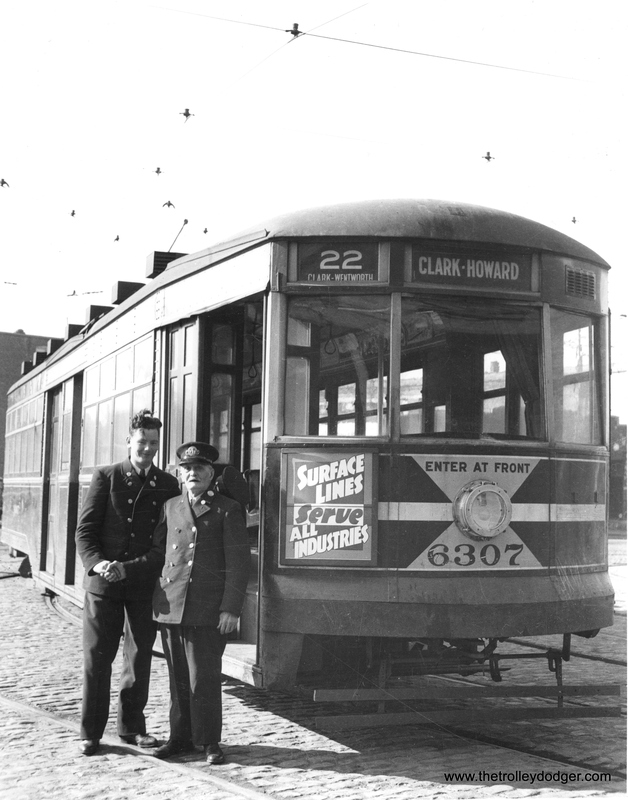 The trolley operator in this photo appears to be all business. He was the person who ran car 1 during our fan trip. He was more likely to be smiling at the end of the day because we passed the hat around and he got a pretty nice tip! 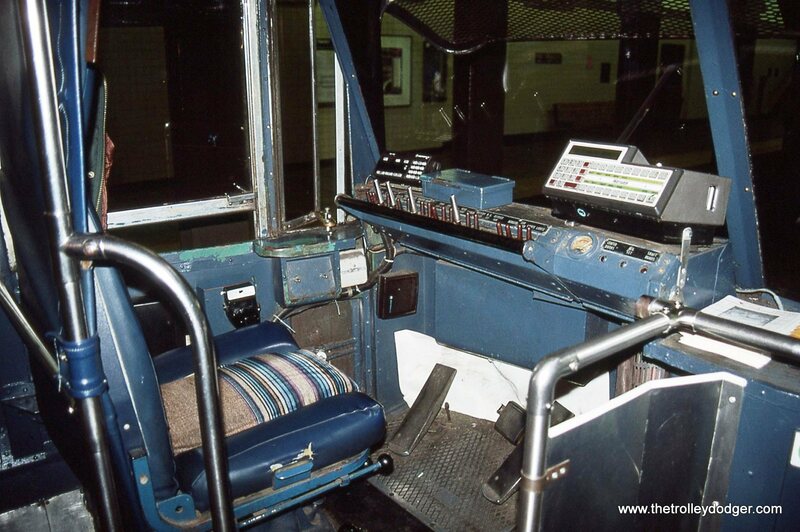 PCC 1 at Newark Penn Station. 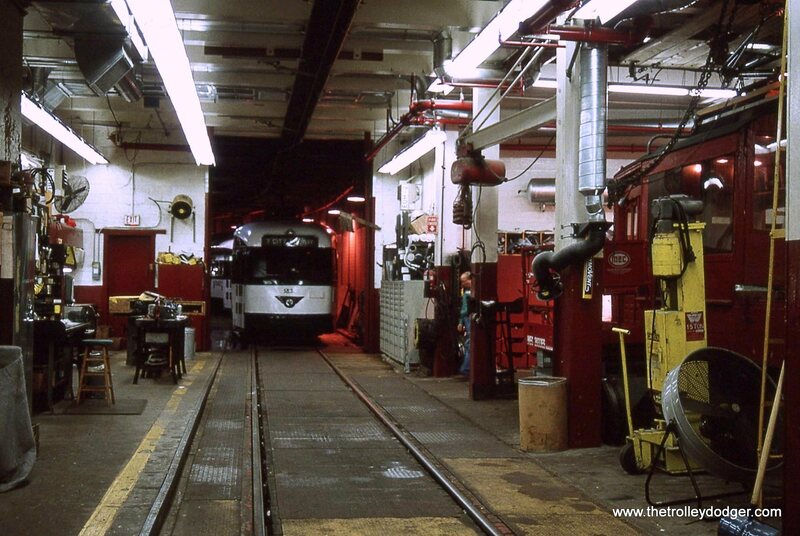 PCC 21 in the shop under Penn Station. 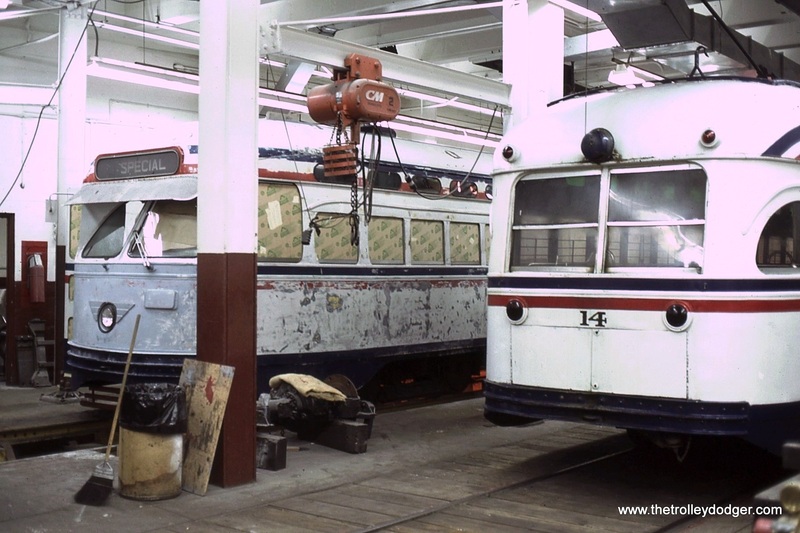 PCC 16 in the shop. A wide view of car 21 and the surrounding shop area. Car 25 and friends in the shop. 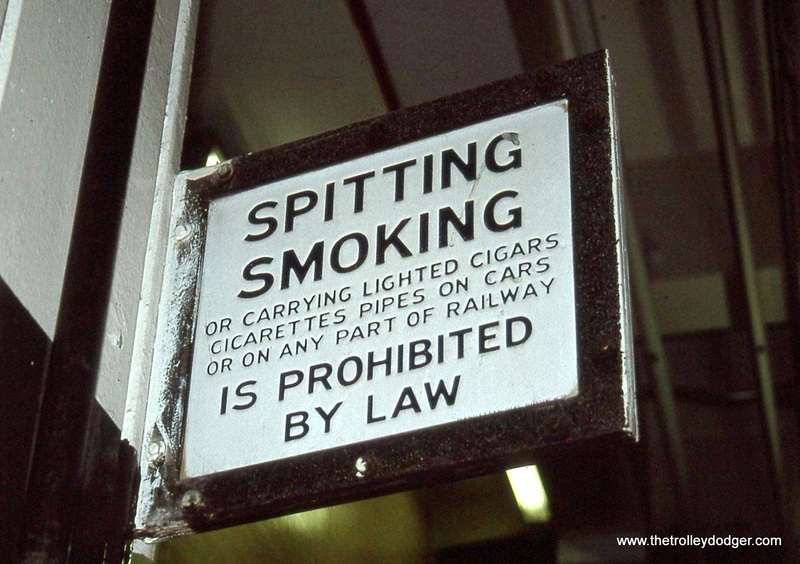 No tobacco chewing here! The sign in the shop area of Penn Station spells it out quite clearly. 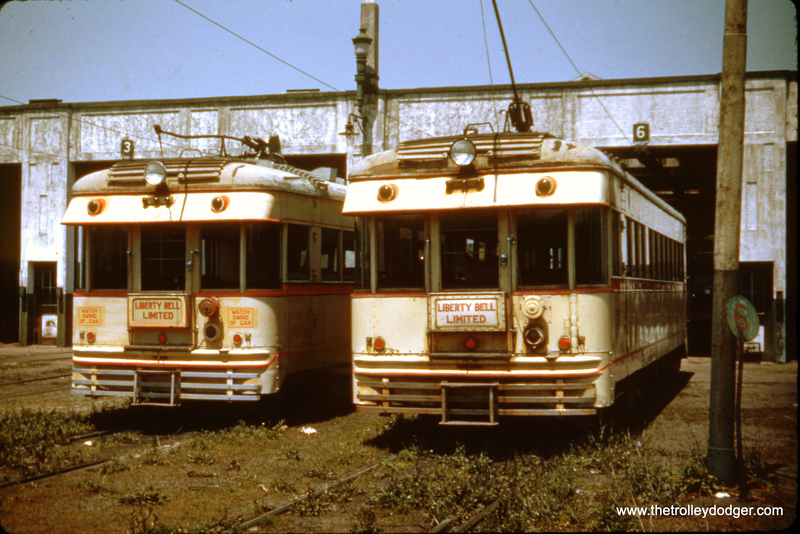 PCC 12 and motor flat 5223 meet at Davenport Avenue. PCC 12 inbound at Davenport Avenue. NJT motor flat 5223. 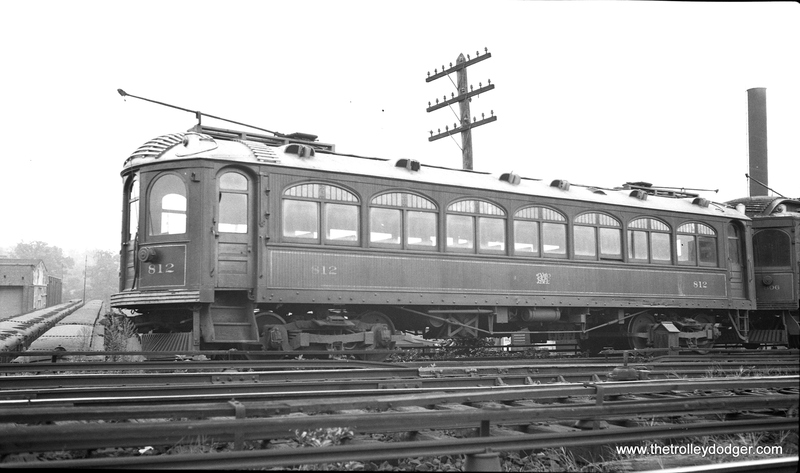 Originally built in 1917 as Public Service Composite car 2683. It was converted to a motor flat work car in 1954. Car 20 outbound at Davenport Ave. Car 23 arrives Davenport Ave.
PCC 24 inbound and 14 outbound meet at Davenport Ave. Car 17 inbound, Interstate 280 overpass in background. Car 17 rear view as it makes the Orange Street station stop. 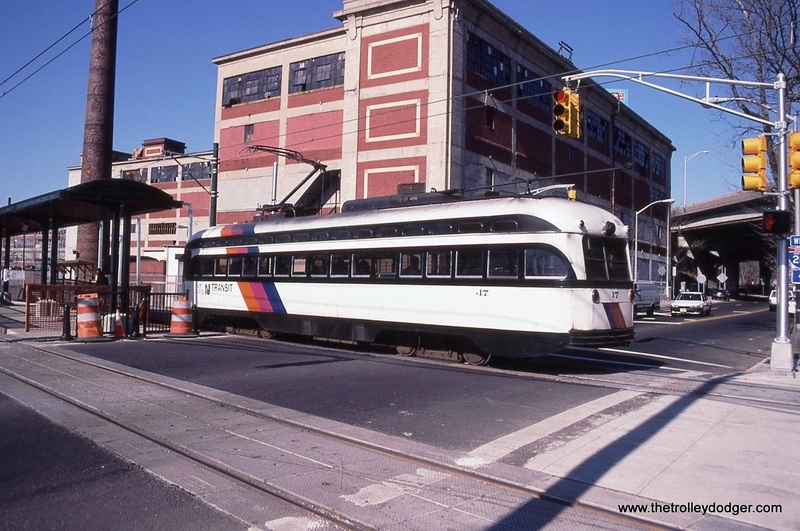 Car 17 again, crossing the subway’s only grade crossing– Orange Street. PCC 23 approaching the Orange Street Station. Former Otis Elevator building in background. Car 24 outbound, showing the entire Orange street Station. 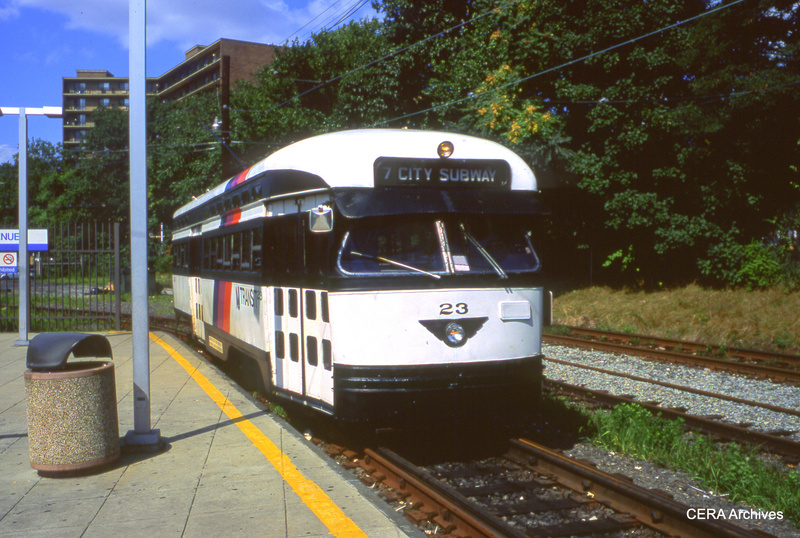 PCC 28 inbound at Orange Street. PCC 6 outbound making the stop at Orange Street. PCC 28 in a wide view of the Orange Street grade crossing. 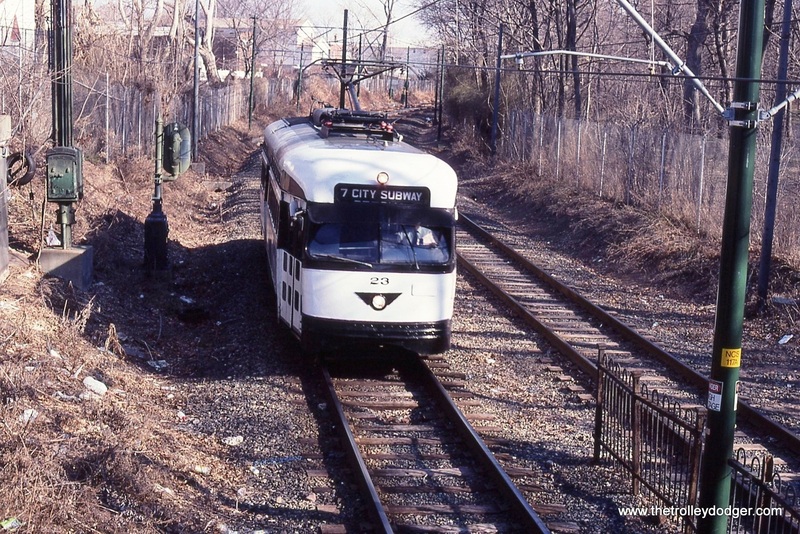 Car 28 ’rounds the tight curve of the Franklin Avenue loop on the last day of service for both the car and the loop trackage. PCC 19 outbound, Orange Street. PCC 17 amongst the construction work still going on at Franklin Avenue/Branch Brook Park Station. 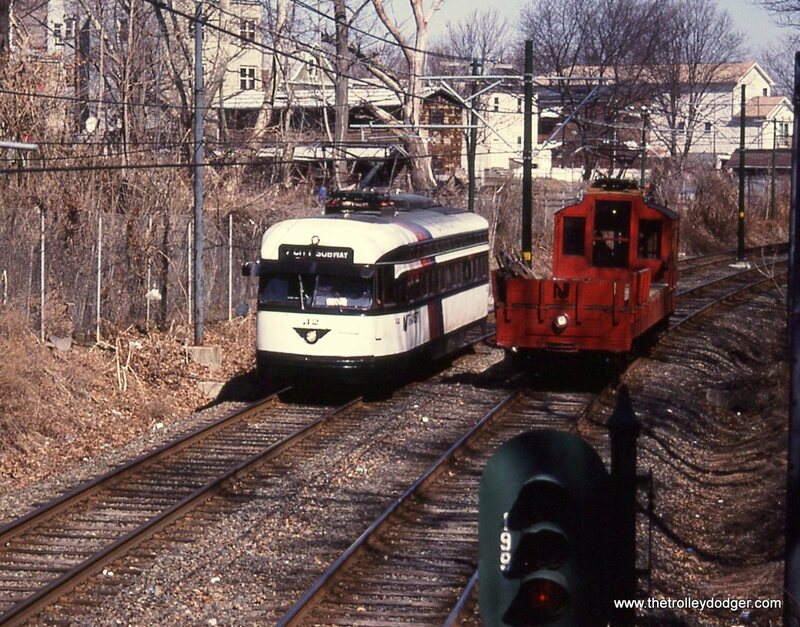 PCC 17 at Franklin Avenue re-named Branch Brook Park at this point. 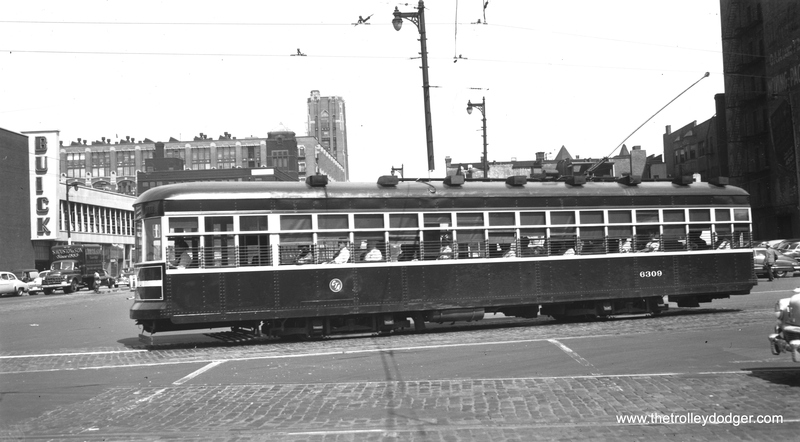 PCC 6 head-on at Orange Street. PCC 6 again crossing Orange Street. The star of the show PCC 6 in it’s brand new retro Public Service paint job. Crossing Orange Street. My last ride. 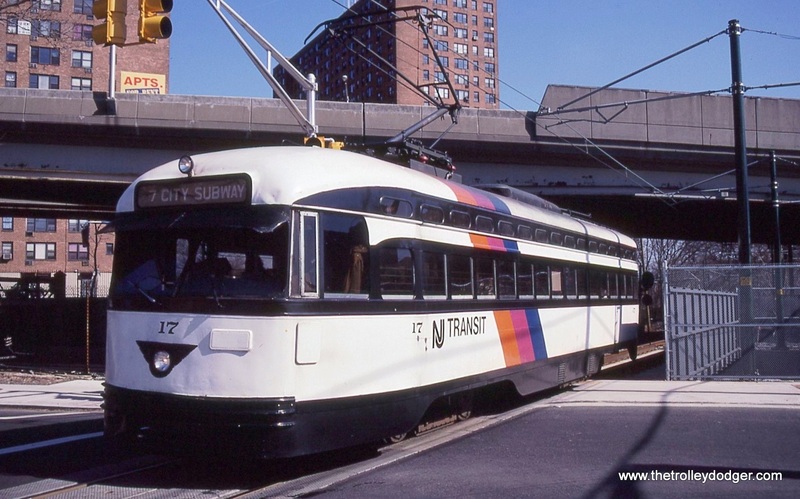 The last time I rode a PCC on the Newark City Subway was in this car, Number 19. inbound to Penn Station. It would all be over soon! 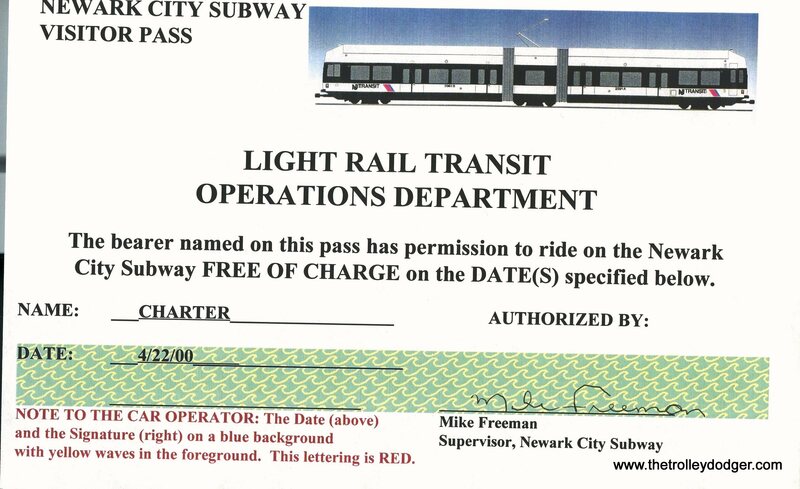 PS- Here are some scans of Newark Subway related documents from my files. 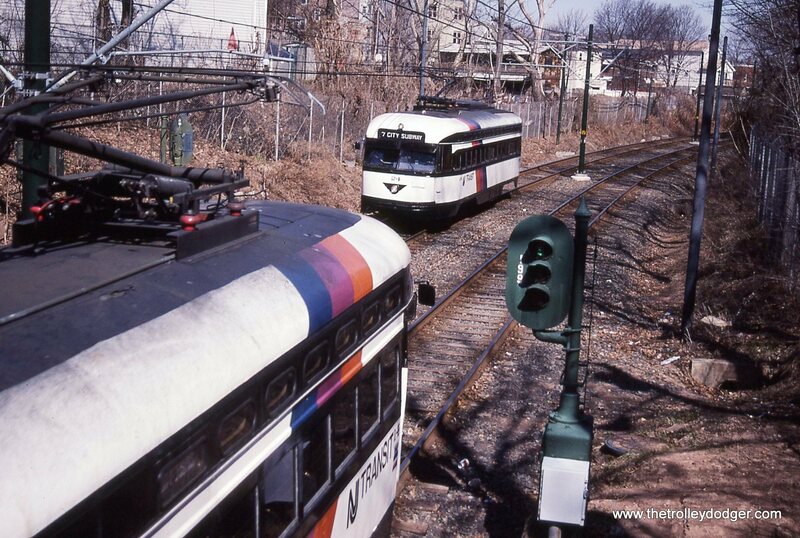 LVT 1006 making a backup move, which these single-ended cars had to do on a regular basis in Allentown. 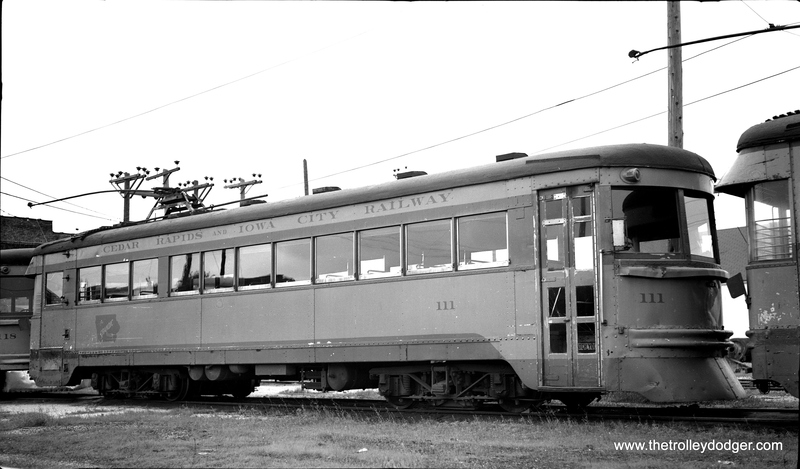 This must be near the end of service in 1951 as evidenced by the premature corrosion on the car (caused by electrolysis between the steel and aluminum plates it was built with). 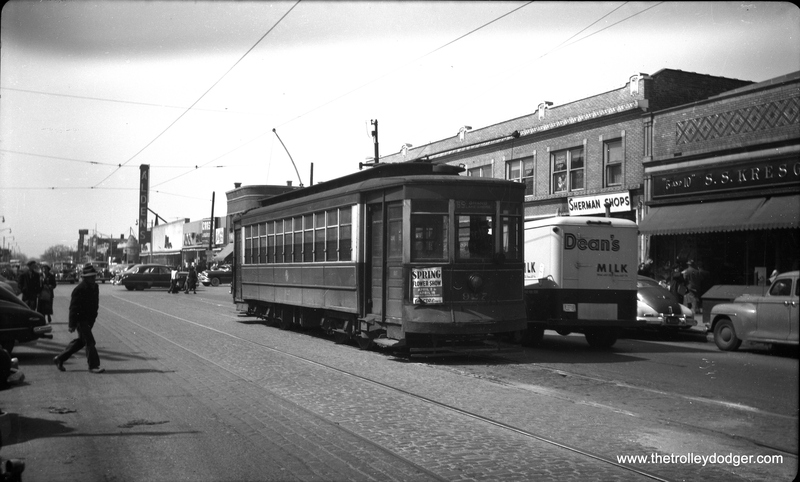 LVT 1002 on the Philadelphia & Western in 1940. The straight track heading behind us is the original main line that went to Strafford (and gave the Strafford cars their name). 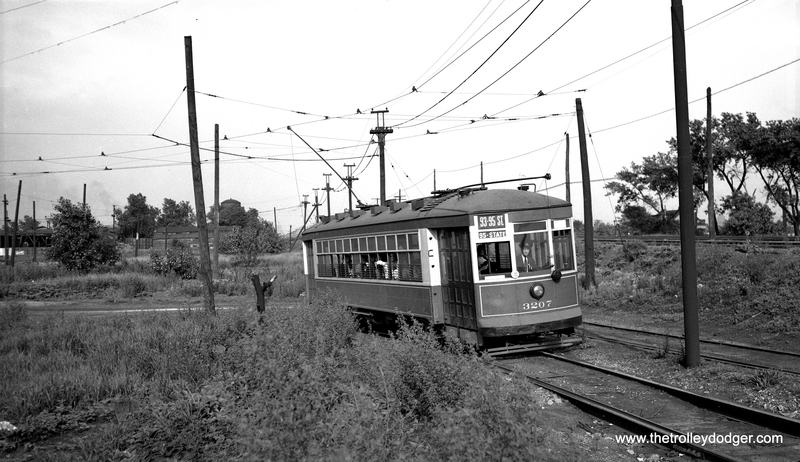 It was eventually eclipsed by the extension to Norristown and was abandoned in 1956. 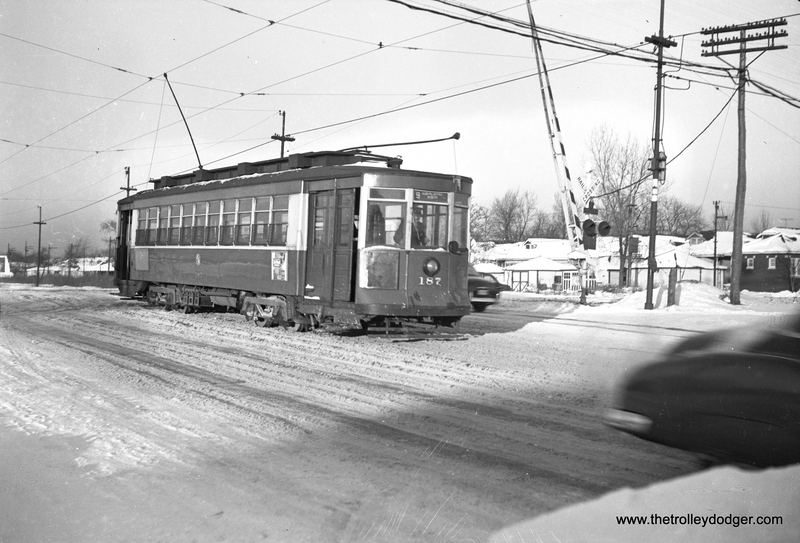 In a 1951 snow scene, LVT 702 meets a 1000-series car. LVT 702 and 812 on November 12, 1939. 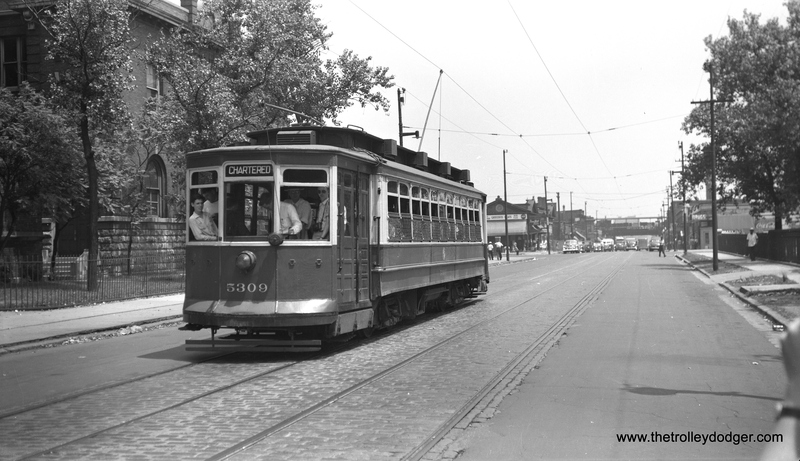 An LVT 1000-series lightweight high-speed car on the Philadelphia & Western in the 1940s. According to Jim Graebner, the siding is “a yard track of the Millbourne Mills shop area. LVT’s Souderton car barn in 1951. 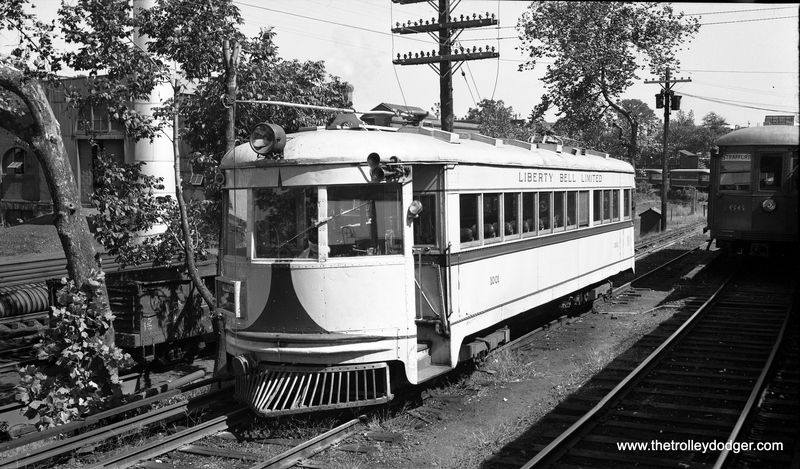 LVT 702 at Rink Siding in Norristown in 1951. 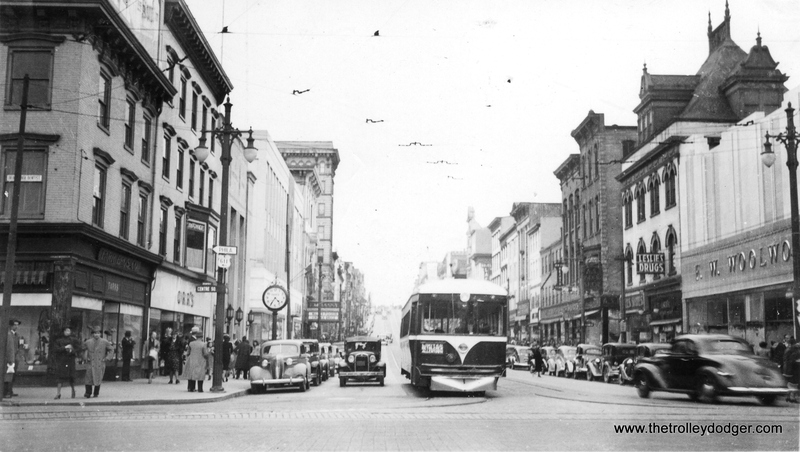 LVT 1020 and 1002 on Washington Street on an April 1, 1951 fantrip. If you look closely, you will see lots of fans with their cameras on both cars. 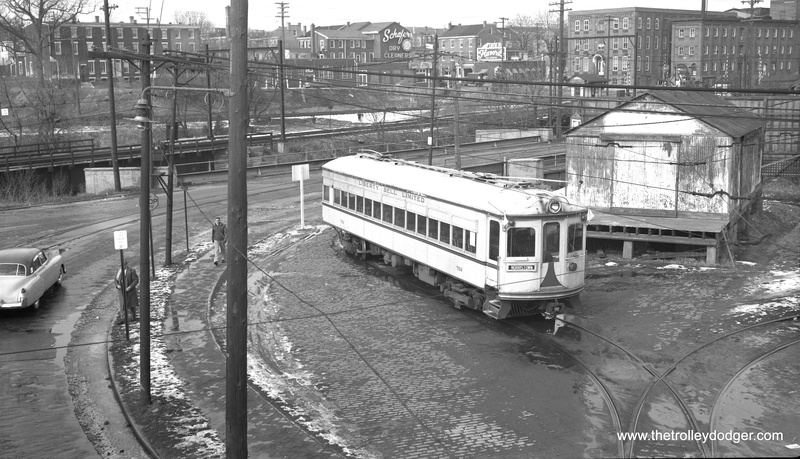 LVT 704 and 1020 taking their last trip on the way to the Bethlehem Steel scrap line, on New Street near 3rd Street in Bethlehem on January 8, 1952, four months after service ended on the Liberty Bell Limited interurban. Some cars had to be towed, but these at least were still able to move on their own. 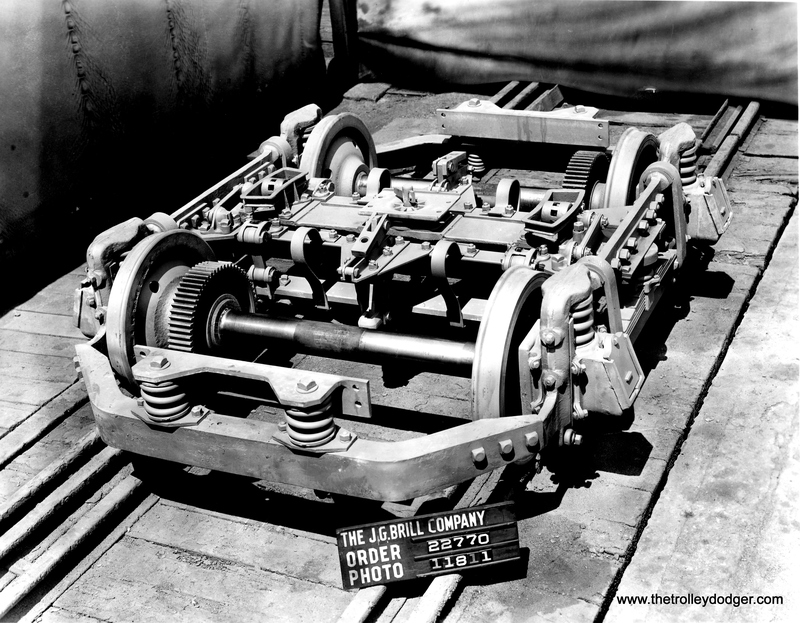 Prior to being put into service on the Liberty Bell Limited in September 1941, LVT 1030 made the rounds throughout the system. Note the sign advertising this new club car. 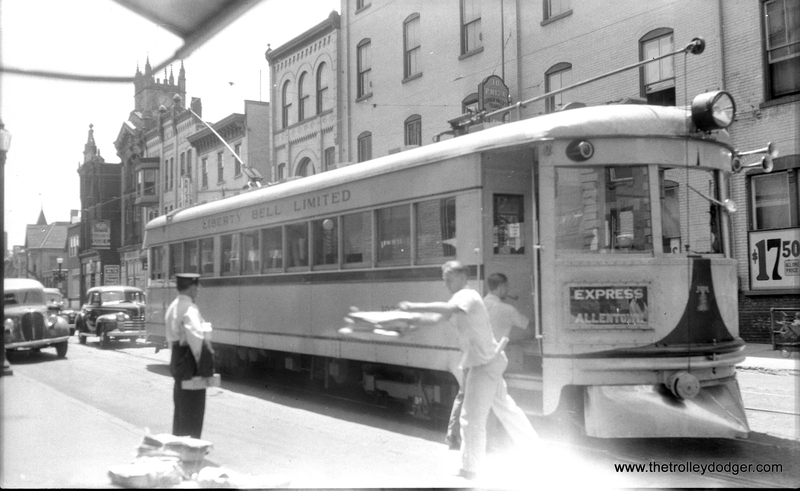 This may be Easton, usually the territory of the Easton Limited, LVT’s other interurban. Notice the difference in the shape of the rear end (curved) vs. that of the ex-Cincinnati & Lake Erie cars that LVT had (squared off). That is because 1030 was originally Indiana Railroad car 55, and the IR lightweight high-speeds could be operated in multiple units and hence needed more clearance in back for turns. 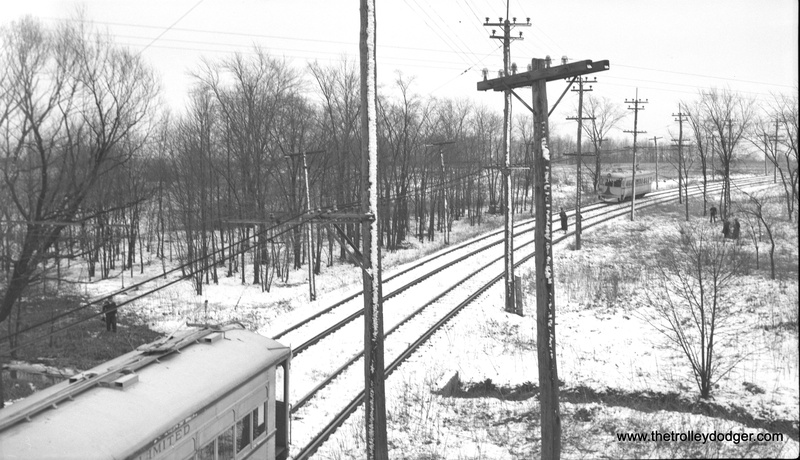 Lehigh Valley Transit Co. Liberty Bell Route right-of-way at Acorn Siding one year after abandonment, looking north in 1952. 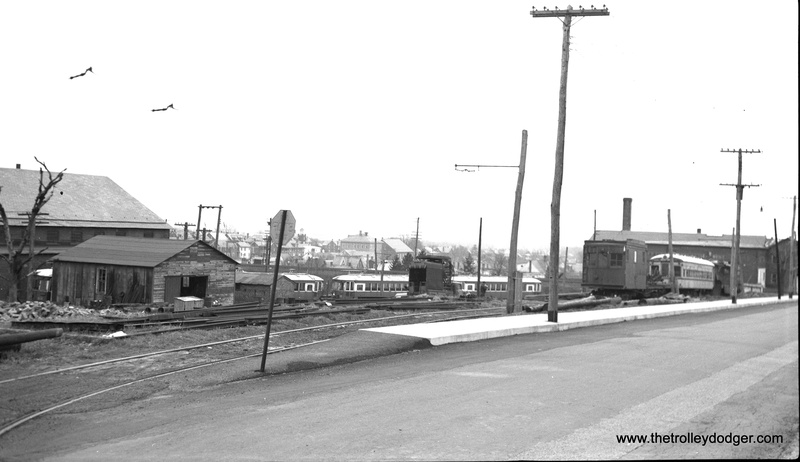 The Lehigh Valley Transit Co. Aineyville Viaduct over the Reading Railroad East Penn Junction in Allentown, PA in 1951. 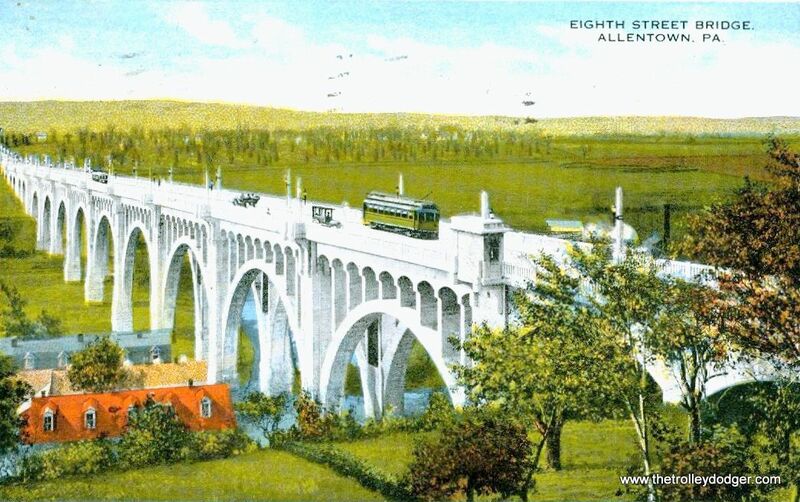 LVT built the Eighth Street Bridge in Allentown, which charged tolls. This vintage postcard was mailed in 1919. 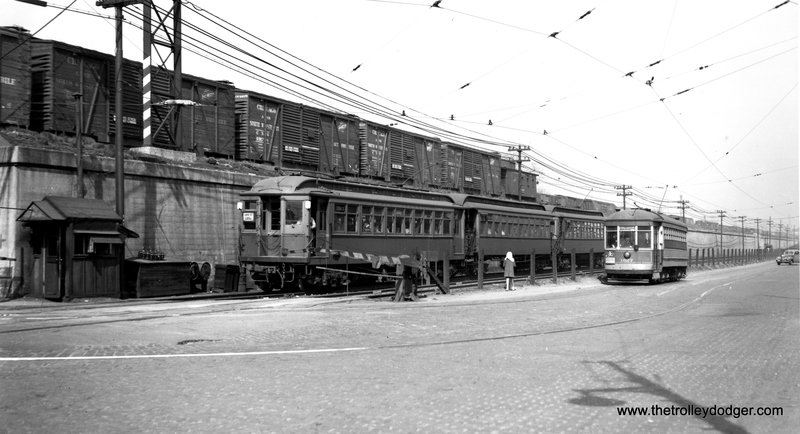 An LVT local car (yes, the interurban had locals as well as expresses) in Norristown in 1934, on the ramp up to the Philadelphia & Western terminal. 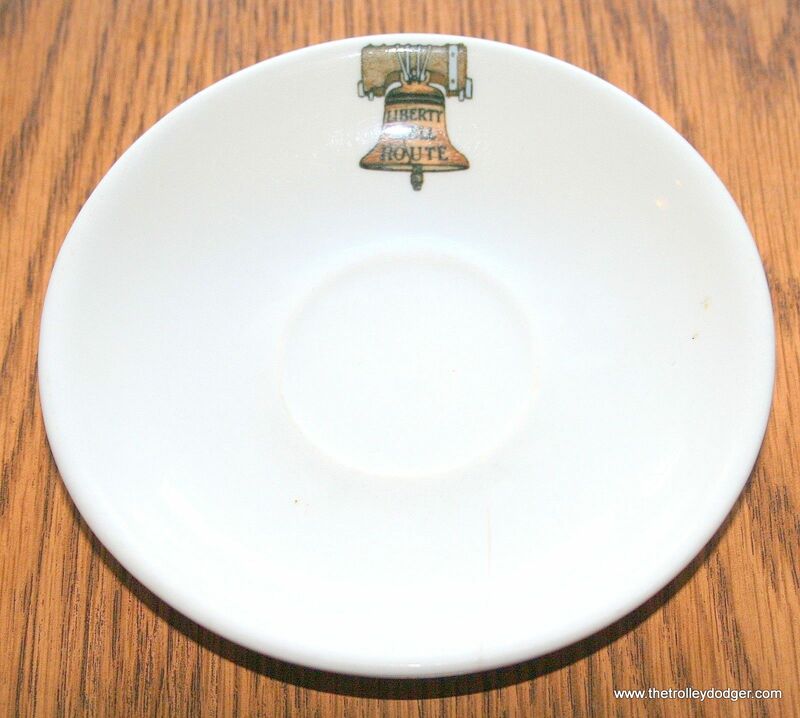 A Liberty Bell Limited saucer. 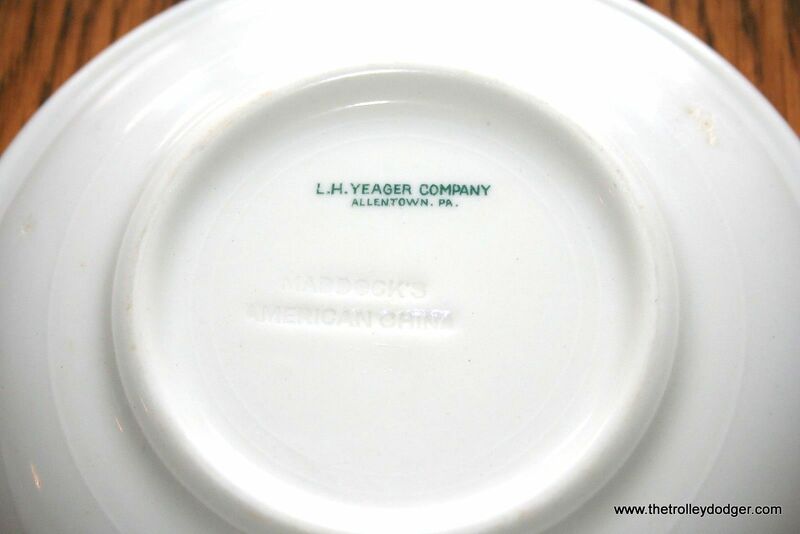 The LVT crockware was made in Allentown. According to author Ron Ruddell, these were custom-fired in 1914 for use on car 999. This vintage liberty Bell Limited mustard pot recently sold on eBay for $429.99, although not to me (my finances don’t cut the mustard for stuff like this). 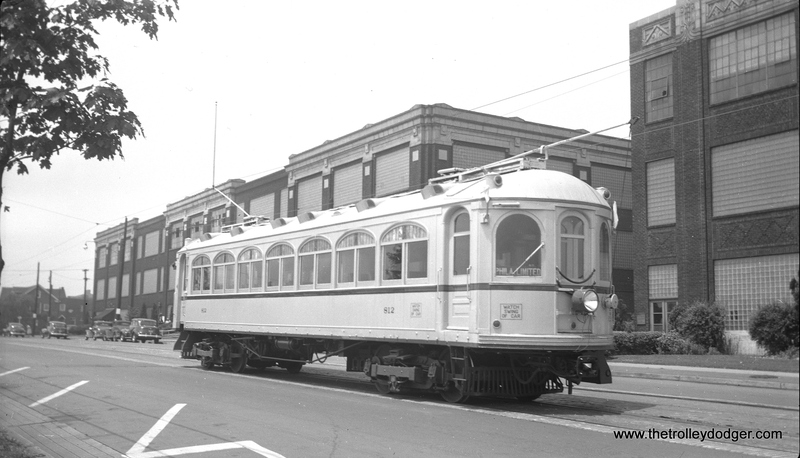 Jamestown (NY) Street Railway car 82, built by St. Louis Car Company in 1917, was sold to Lehigh Valley Transit in 1938 as part of their modernization program, where it was renumbered into the 400-series. 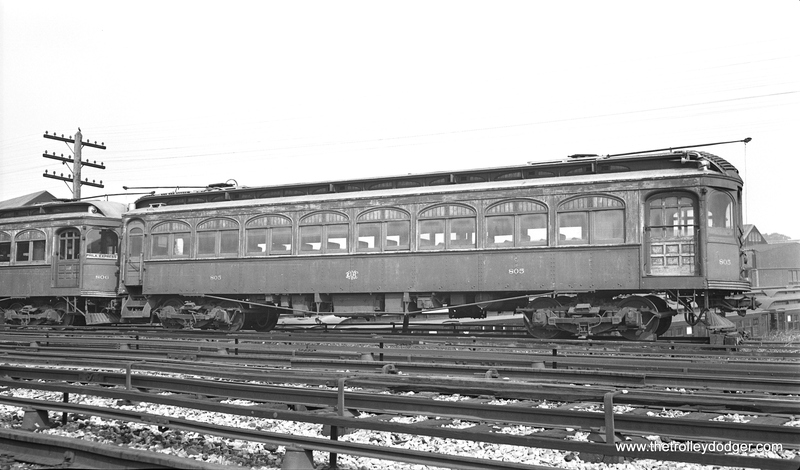 A P&W “Bullet” car side by side with the LVT at the 69th Street Terminal in 1948. 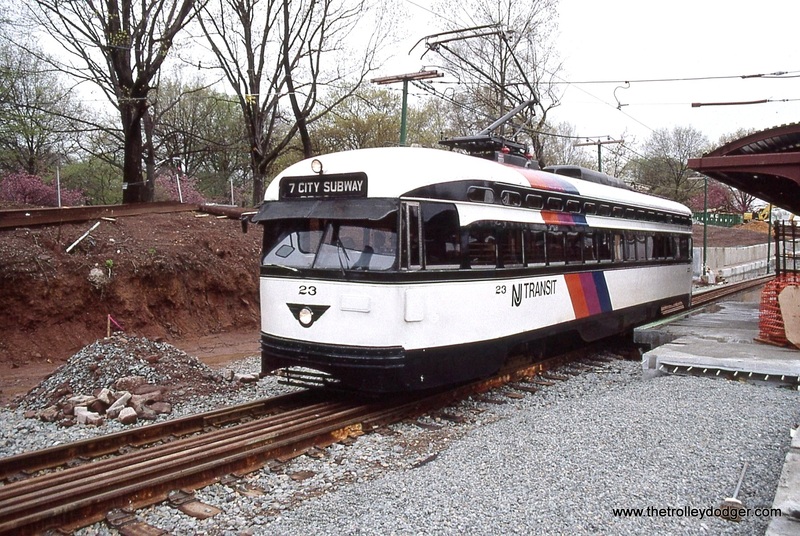 The following year, Liberty Bell Limited service would be cut back to Norristown. 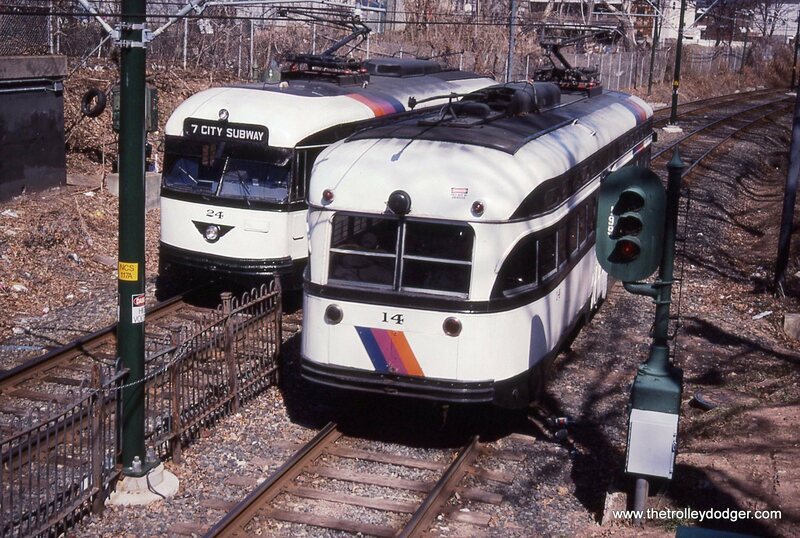 A rear view of two Lehigh Valley Transit ex-Cincinnati & Lake Erie “Red Devils” shows how their squared-off ends were not designed for multiple-unit operation. 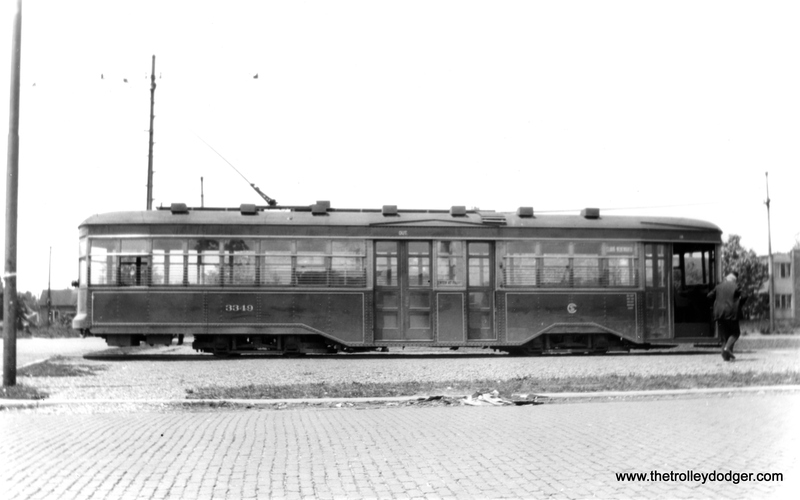 By comparison, car 1030, adapted from Indiana Railroad car 55, had a rounded end and was designed for multiple unit operation. Presumably, this is the Fairview car barn in Allentown. 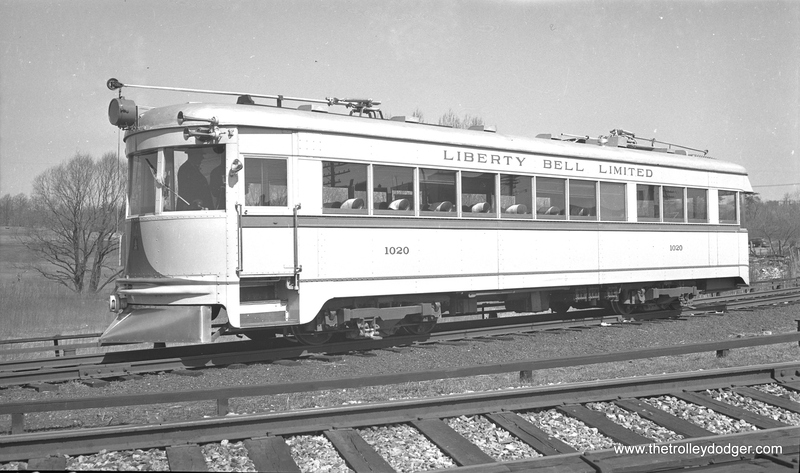 Liberty Bell Limited interurban service ended in 1951. 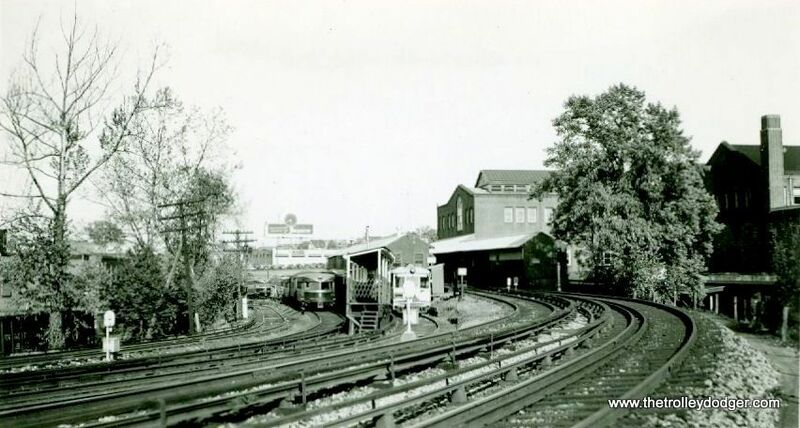 On this link there are 2 photos that show the northbound (outbound) platform directly north of Elm street east of the (North Shore Line) Winnetka Station which would have been on the modernized section of the Shore Line route. The only thing remaining are the cement blocks that supported the platform structure. The platform is long gone, but the cement supports are still fighting trees and other greenery from taking out the last known platform (that I know of) from America’s fastest interurban era. The strange thing is that this platform was abandoned in 1955. Obviously it’s either gone (let’s hope not), or it’s so hidden you can’t see it. But it’s pretty clear that those photo’s are not old. I’m pretty sure that one of them is still there, or at least the foundation of the platform. P.S. Thank you so very much for posting my email on your blog, you totally made my day! 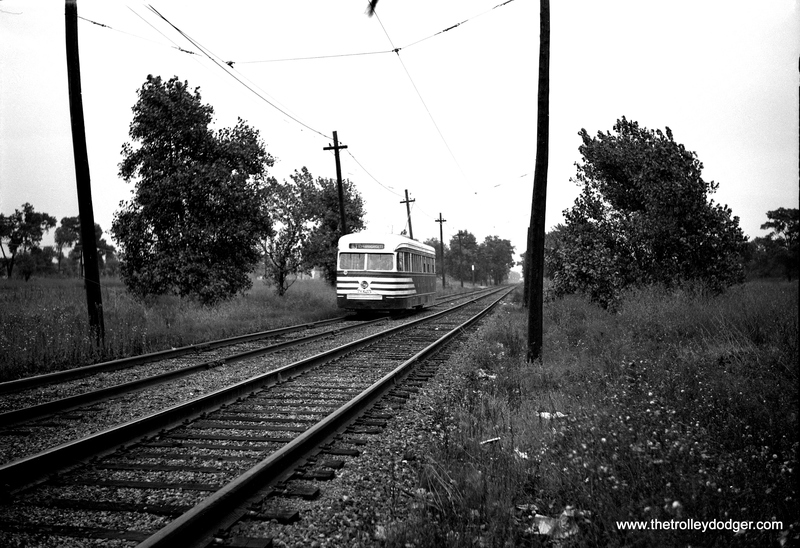 The Shore Line was abandoned in 1955 since it was a lot slower than the Skokie Valley route and presumably had a lot fewer passengers. It also had a lot more direct competition. Of course, their eventual goal was to abandon everything, which did happen in 1963. 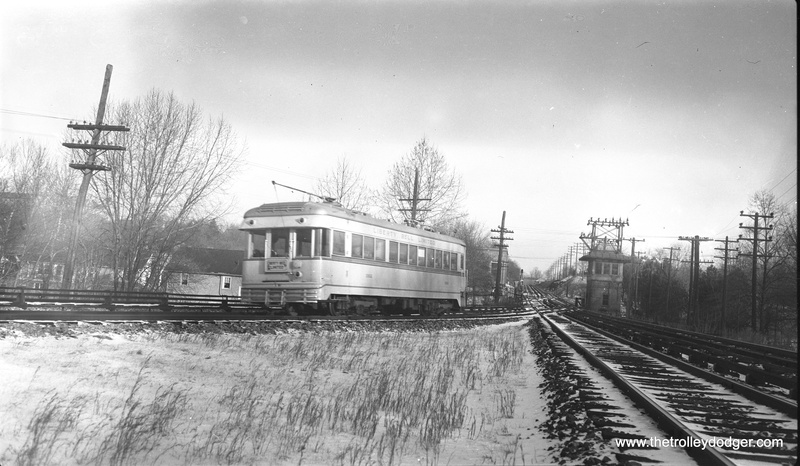 Around 1950, the CTA proposed turning over the Evanston/Wilmette service to the North Shore Line, in exchange for having all their trains terminate at Howard. I am sure some people at the CTA regarded the interurban operations on their tracks as an inconvenience that created various operating complications. 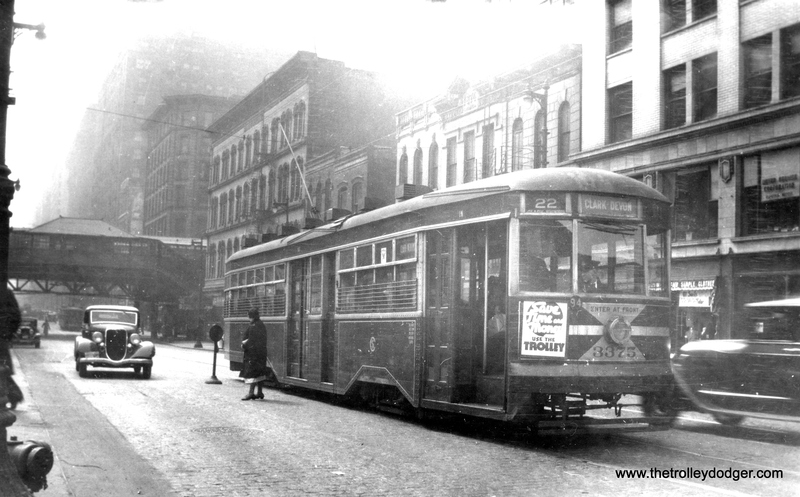 With the CTA’s attempts to speed up service, at first by using A/B skip-stop service, then later high speed motors, they felt that reasonable times to downtown could still be achieved even if interurban passengers had to change trains at Howard (or Forest Park). This did not work out so well for the Chicago, Aurora & Elgin in 1953-57 but that was mainly due to the very slow temporary trackage on Van Buren Street (2 1/2 miles). Who knows how things would have worked out if CA&E had survived after the new Congress rapid transit line had opened in June 1958? Thanks for the reference to the CSL car. It sometimes seems that the best we can do is get “close enough” for colors. And, sometimes an educated guess is closer to reality than the rivet counters want to admit. I follow a seller on eBay who operates out of Waukesha and he seems to be knowledgeable about the Kidder 0-Scale production. There appear to have been quite a number of these short production run cars in addition to your CSL car. I just haven’t had time to sit down and pick his brain about them. Kidder specialized in this sort of thing, and these cars appear to be at the direction of a buyer or two, with an additional unknown number of “spec” cars. No telling where he got the drawings of the different cars; perhaps Wagner. 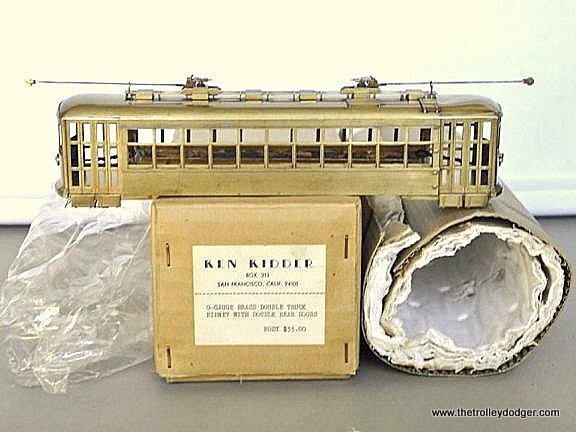 From what I’ve seen, Kidder did, among other things, an Electroliner body (four cars, but no floor or mechanism) and a number of interurbans. Also at least one city car in 0-Scale. By the way, I’ve read your blog on many occasions and I thank you for doing it. It’s very interesting. One possible source for the 7001 blueprint would be Car Plans of the Chicago Surface Lines (1962), published by the Electric Railway Historical Society as their 38th bulletin. All 49 ERHS bulletins have been reissued by Central Electric Railfans’ Association on a DVD data disc in PDF form, and are available directly from them or their dealers. 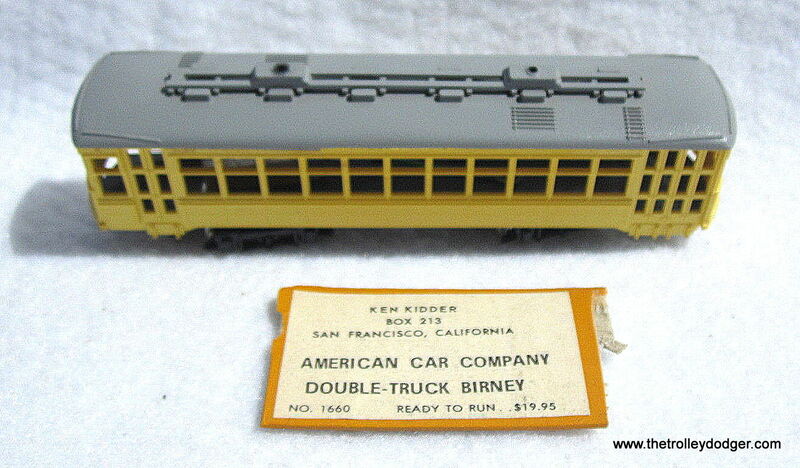 I’ve seen Ken Kidder brass Birney cars for sale on eBay, both single and double truck. 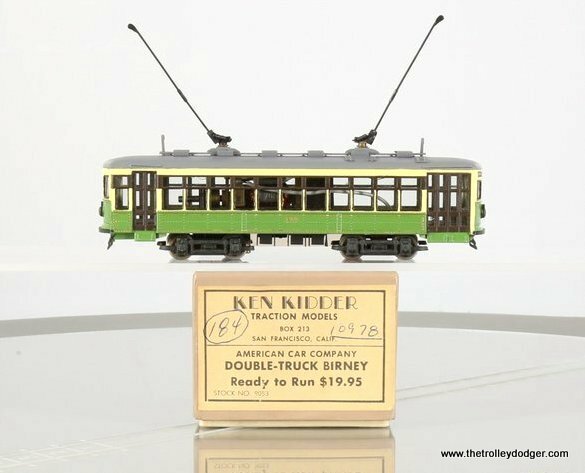 The double truck Birney would be the same type of car (Johnstown 311) featured on Railroad Record Club LP #23, Pennsylvania Trolleys, available on CD via our Online Store. 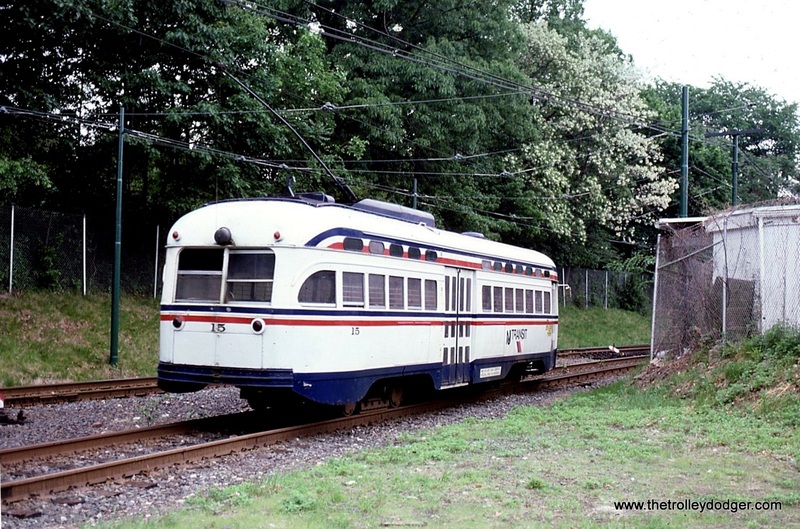 This car still exists and was the first one acquired by the Rockhill Trolley Museum in Pennsylvania. I started buying RRC LPs from Mr. Steventon back when I was in high school (Mid-1970s) My uncle had RRC 10 PRR and he loaned it to me and I enjoyed it very much. In spite of the fact that this record was almost fifteen years old, I wanted to find out if the other LPs (I knew there had to be at least nine others) were still available. I wrote a letter to the Railroad Record Club thinking that I’d never get a reply. Could the post office even deliver a letter addressed simply Hawkins, Wisconsin? A few weeks later I got a nice handwritten note from Mr. Steventon (I sure wish I had saved it) explaining that RCA had lost or destroyed his master discs that the LPs were made from. He was in the process of having new masters made using good copies of the 10″ LPs. He would then start selling the remastered records as 12″ discs. I would end up buying eight LPs over the next couple of years, but for a while my interest faded. By the time I wanted to start buying more, it was all over. Just one of the reasons I enjoy these records (CDs) so much. Awhile ago I sent a few Railroad LPs to a company I found online. I spoke to the sound engineer on the phone before I sent any thing to them. 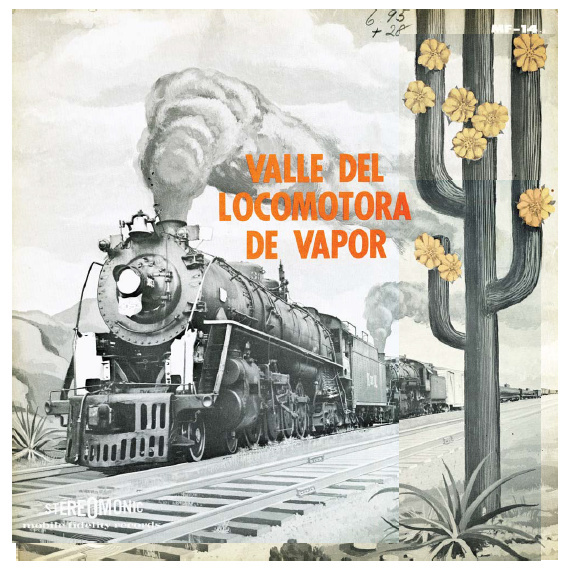 He admitted that he had no idea what to do with locomotive sound recordings but he agreed to make simple transfers to CD without attempting any restoration or track dividing. The results were CDs that sounded exactly like playing the LPs. Your work is so much better that there is no comparing them. So far, I haven’t been able to find anything to indicate that Steventon (1921-1993) had any children. His wife’s name was Mary (née Witt) (1921-2003) and they got married in Washington, D. C. in 1954, when they were in their early 30s. She outlived him by ten years and it looks like someone else helped clean out their house after she died. His own personal collection of RRC LPs ended up getting sold one-by-one on eBay. I would like to think that we are continuing to carry out Mr. Steventon’s life mission by making these fine recordings available once again in modern form as compact discs. 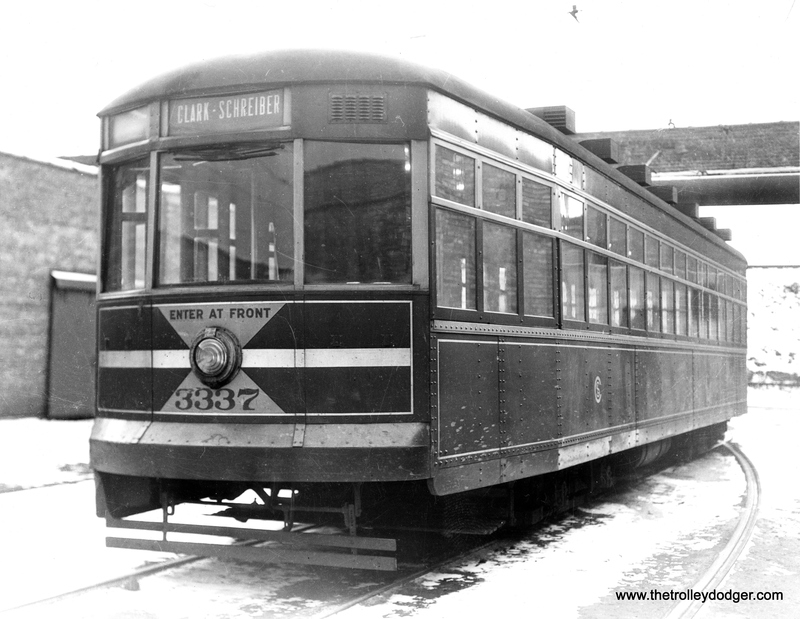 I wrote you a while back asking if anyone might have photos/plans of interurban stations/depots specifically ones like the ones on Northern Indiana Power. This was the line that ran from Marion, Indiana to Frankfort, Indiana and more specifically like the depot in CERA book bulletin 102, 1958 on pg 55 of Michigantown – Bottom right. 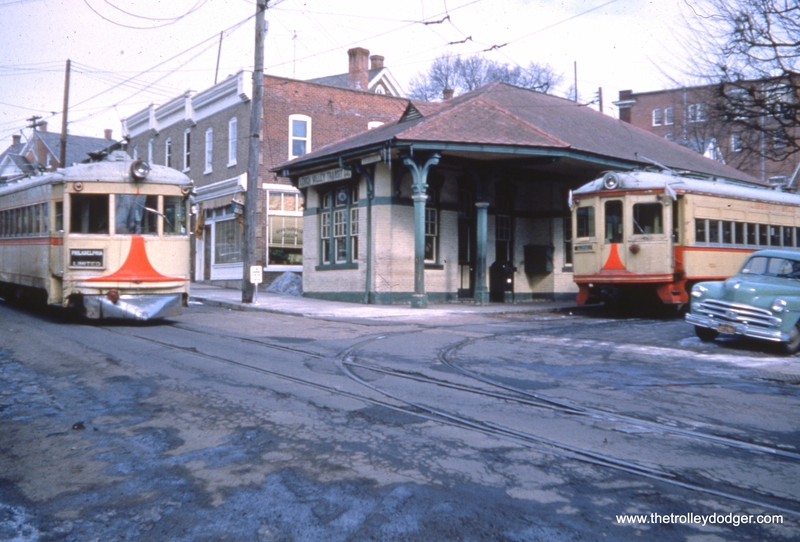 The depot in this photo is very like the one we are working on in Russiaville, Indiana. I know you indicated you might ask around however since I have not heard anything more I assume you did not find anything. You will recall we want to restore the Waiting room in the depot. We did find one photo of the Agents office which is attached for you. !. Can you tell me your opinion of generally what a waiting room would be like. I am thinking a lot of depots had vertical siding about 3 feet up from the floor covering the lower portion of the plaster. This wood was like box car siding I think. Would appreciate any suggestions you might have because if we can not find anything specific we will just make it look like a generic depot interior. 2. Could you look at the photo – Questions; the two men in uniform – one is an agent. The uniforms are different i.e. one has a dark shirt – other has a white shirt also different hats – we have talked about trying to obtain some uniforms like these and putting some “dummies” in the depot agents office. Any idea where we might obtain uniforms like these. Also any idea on the route map on the wall above the desk, Also the telephone. Also would you say what I think is a window – to the left of door in the back – might be a ticket window – what do you think. Also any comments you might have about the other objects in the office. Let me ask the readers of my blog and also some of the railroad discussion groups I belong to. I apologize for not following through on your previous request. Chances are some of our readers will offer some excellent ideas. MCB 10A trucks (the 6-foot wheelbase ones) with 80A motors would have come from 5001-5200 series, though trucks were apparently rebuilt by Brill as “27FE-1″ as MCB 10A trucks were only 4’10” wheelbase. There were three cars burned 1916, 5169, 5194,5303. 39Ewith 242-B motors would have come from 5701? Here is some more info on these 19 cars. Officially, 6138-6142 replaced 2520, 2526, 2584, 2597, 2621, 6147-6150 replaced 2515, 2546, 2565, 2585, 6151 replaced 2777, 6152 replaced 5239, 6153 replaced 5765, and 6154 replaced 2561. However, the reality is a bit different. 2500’s had 4 GE 67 40hp motors and 6′ wheelbase St Louis MCB trucks. Very different from 226-A’s and 27GE-1 trucks. Possibly 2777’s trucks ended up under 6154, with 5239’s motors? 6143-6146 do appear to have the equipments of 5169,5194,5303,5701 which they “replaced”. However, note that 1927 inventory shows 6143-6145 with GE 80 (not 80-A) motors. This might be an error, though. It would appear that 6138-6142 and 6147-6153 did not have the equipments from the cars they “replaced” at all, but instead had trucks and motors from entirely different cars, the 1409-1505 series Bowling Alleys. One wonders if the 2500’s trucks went with the 1400’s bodies when they were sold off? In addition 3090-3091 “replaced” 1405 and 1360, Matchboxes. Again, no equipment match. St Louis 47A trucks with GE 80A 40hp motors vs Brill 39E-1 trucks and 242-B motors. In 1927, though, 3090 is shown with GE 80A motors, which were apparently from the Matchbox, but by 1939 has 242-B’s. Here is an interesting tabulation. One-man conversions over the years. 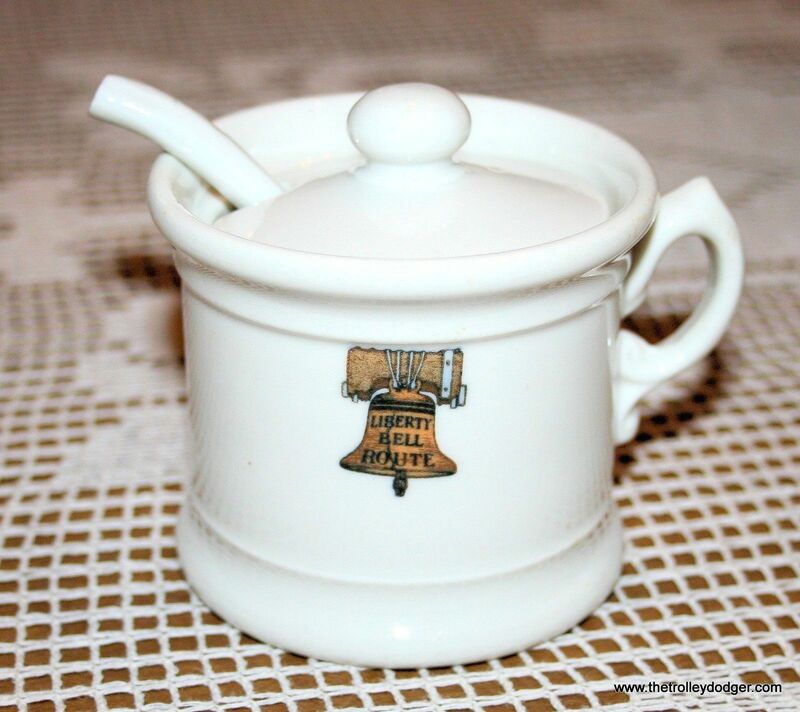 The China shown on your blog embossed with the Liberty Bell was not used in any depot restaurant. It was custom-fired in 1914 for Liberty Bell Car 999. Please see my book “Riding on the Bell” – page 78 for further information. I have a pickle dish of the same pattern. Nice to hear from you again. 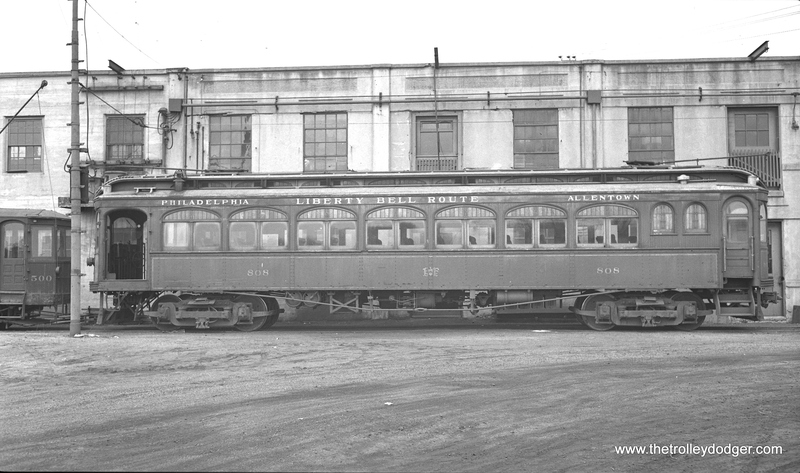 Congratulations on the successful completion of your excellent and very definitive work on the Liberty Bell interurban. 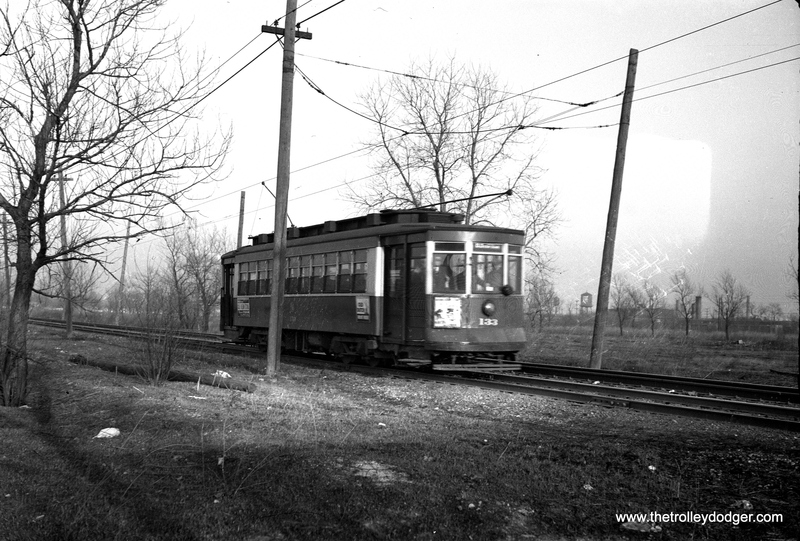 With its rapid expansion in the 1920s, the Chicago North Shore and Milwaukee Railroad set the standard for electric interurban transit in America; no railway could compare to the North Shore Line. The North Shore Line also established itself as a leader in marketing with a highly successful print ad and poster campaign featuring the work of designers Willard Frederic Elmes, Oscar Rabe Hanson and Ervine Metzl, among others. Assembled from the collection of the Milwaukee Public Library and a number of private collections, this exhibition features many of these memorable posters along with photographs, prints and ephemera from the height of the North Shore Line’s success. Curated by photographer John Gruber and J.J. Sedelmaier, world-renowned artist, designer and animator of Saturday Night Live’s TV Funhouse. This is our 104th post, and we are gradually creating a body of work and an online resource for the benefit of all railfans, everywhere. To date, we have received 101,000 page views from over 29,000 individuals. Everyone wants to go home for the holidays, even if just in spirit. 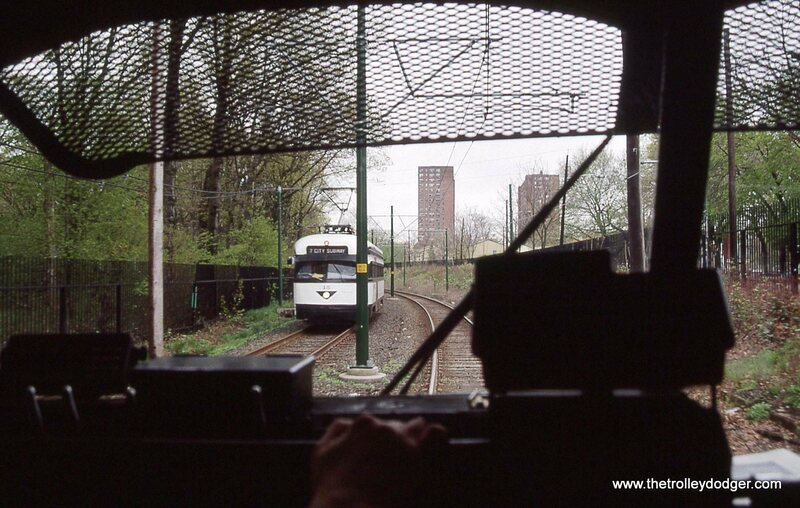 So, for this, our latest batch of classic views of Chicago streetcars, we have made sure to include some pictures from our old stomping grounds. I grew up near Grand and Harlem on Chicago’s west side, in the Mont Clare neighborhood, then one of the busier shopping areas outside of the Loop. 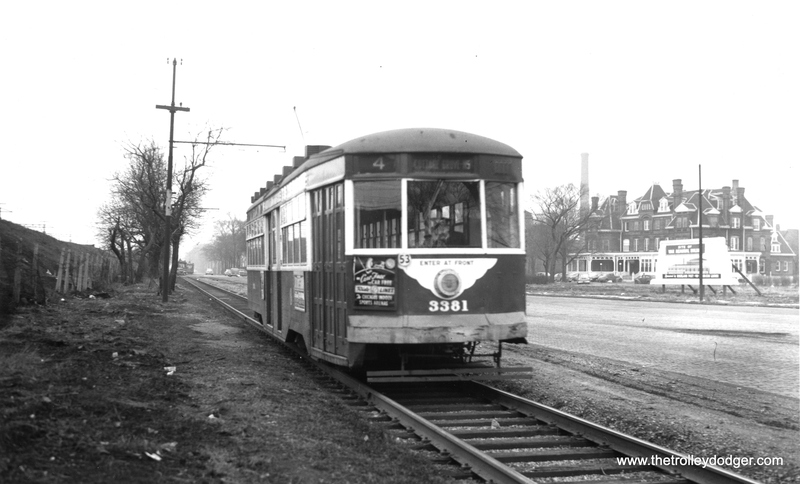 The Grand Avenue streetcar stopped running in 1951, three years before I was born, so I don’t remember that. 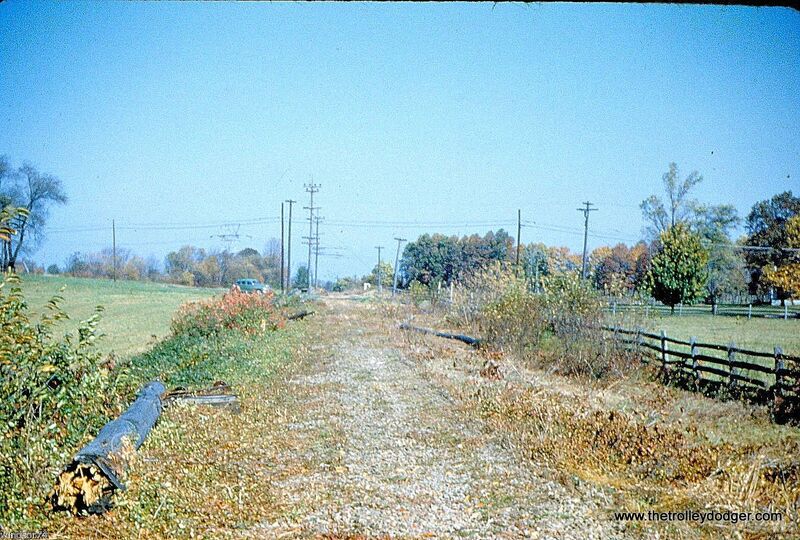 Today, however, we have not one but two photos showing the west end of the line. I can assure you that such pictures are rare indeed. 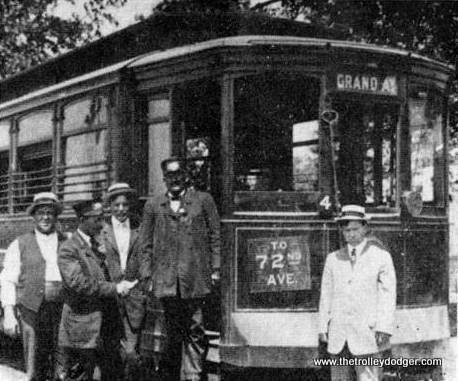 I do fondly recall the Grand trolley bus, which terminated at Grand and Noridca, an off-street loop about two blocks east of Harlem, which the CTA still uses for various bus routes (65 – Grand and 74 – Fullerton). 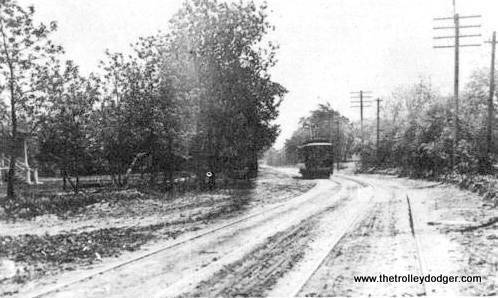 The #90 – Harlem bus used to terminate here, but now goes south all the way to the CTA Green Line in Forest Park. I’ve been told that the CTA would have preferred to put the loop closer to Harlem, but this was the closest point at which the necessary land was available. 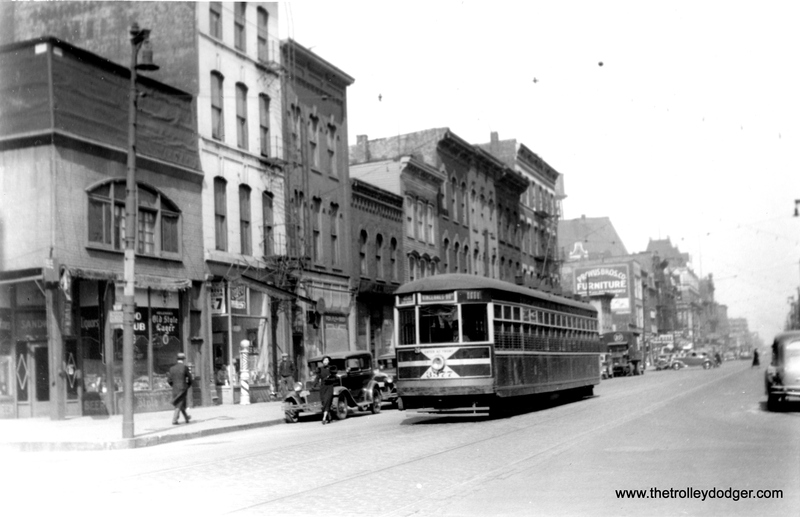 I recall walking over to Grand and Harlem along with my mother and siblings to go shopping on many occasions. With the rise of various shopping centers within easy driving distance, the Grand and Harlem area went into a gradual decline in the 1970s and 80s, resulting in many empty storefronts and, eventually, demolished buildings. The great Montclare theatre opened around 1929, prospered for decades, and eventually sputtered into permanent closure in the mid-80s. It is now but a memory along with many other local landmarks of my youth. We saw films all the time at the Mont Clare, which at one time had an expensive organ. I even worked there for six weeks in 1970 as an usher, and some years later, my sister worked at the candy counter. 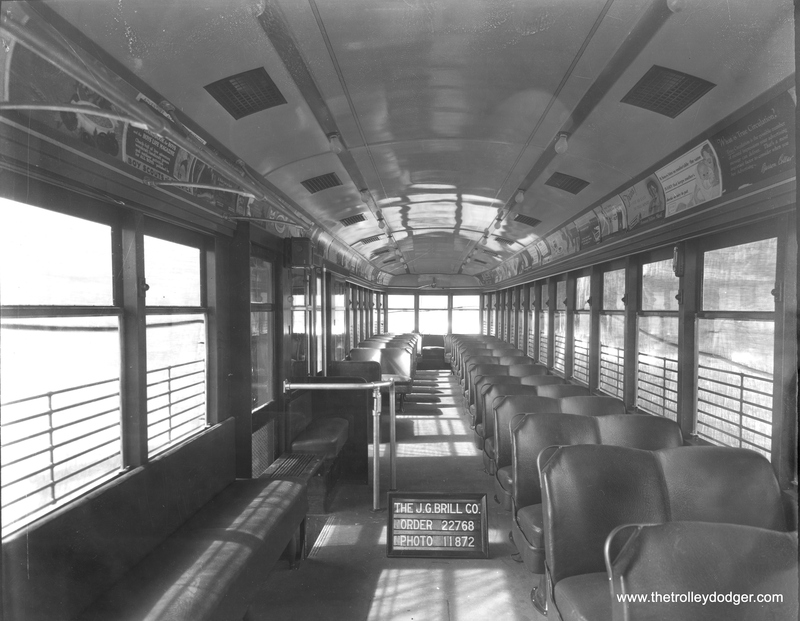 We also have a few pictures of the route 16 – Lake streetcar. Again, I am too young to remember this (it quit six months before I was born) but I certainly recall riding the Lake Street “L” many times when it still ran at ground level for the two-and-a-half miles west of Laramie. 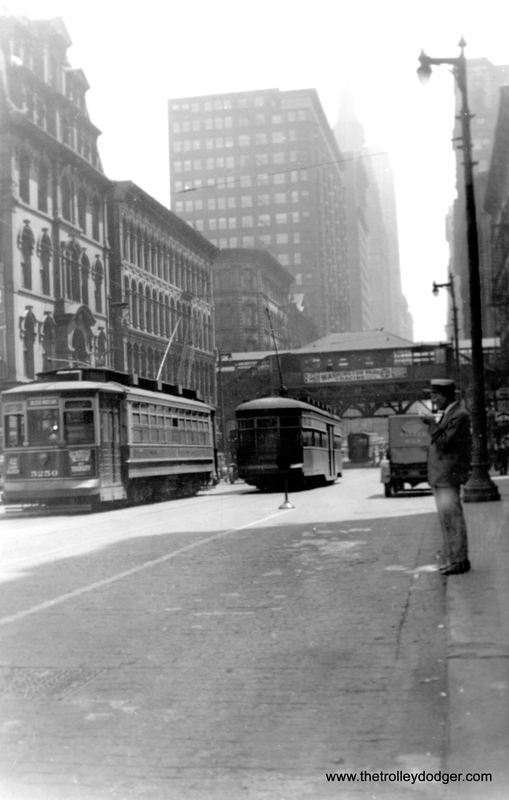 Nowadays, the CTA doesn’t even offer bus service on Lake Street, which was at one time an important route. 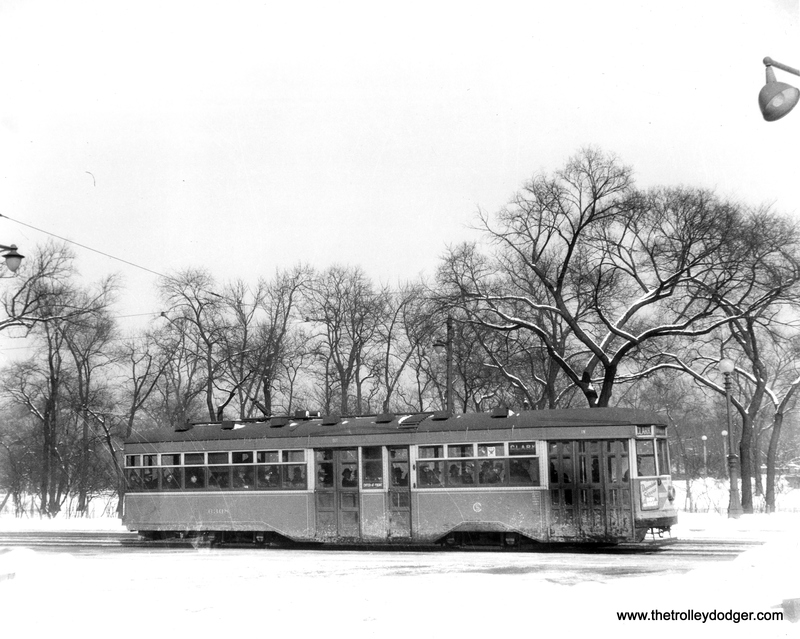 For a time, CTA used special narrow buses to navigate around the “L” support columns on Lake. 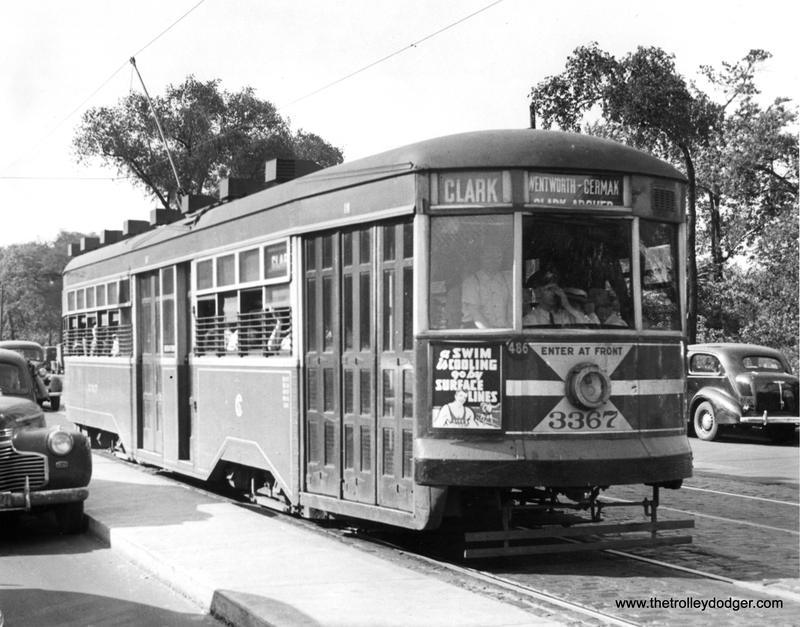 Streetcars, of course, could operate on much closer clearances, since they were on rails. 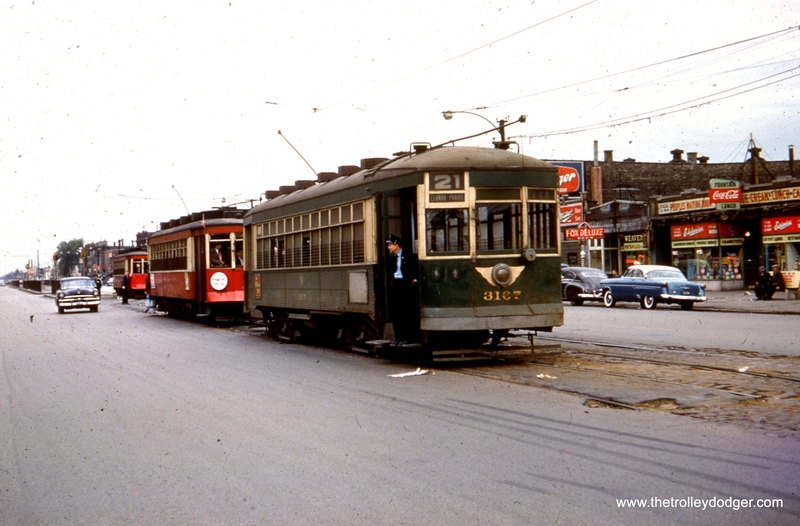 Fortunately, we still have our memories and these great pictures, which date to the “red car” era in Chicago. FYI there will be additional posts in this series coming up in the near future, so watch this space. To see previous posts in this series, use the search window on this page. Yesterday, we reached another milestone with 100,000 page views in less than 11 months since our first post on January 21st. We must be doing something right and hope to do even better in 2016. Thank you for spending time with us. This is our 103rd post, and we are gradually creating a body of work and an online resource for the benefit of all railfans, everywhere. To date, we have received over 100,000 page views from approximately 29,000 individuals. It’s always a good day when we can expand our offerings of traction audio CDs. We have several additional steam titles that are coming down the pike, but there just happen to have been a lot fewer audio recordings made of streetcars and interurbans in the classic era. 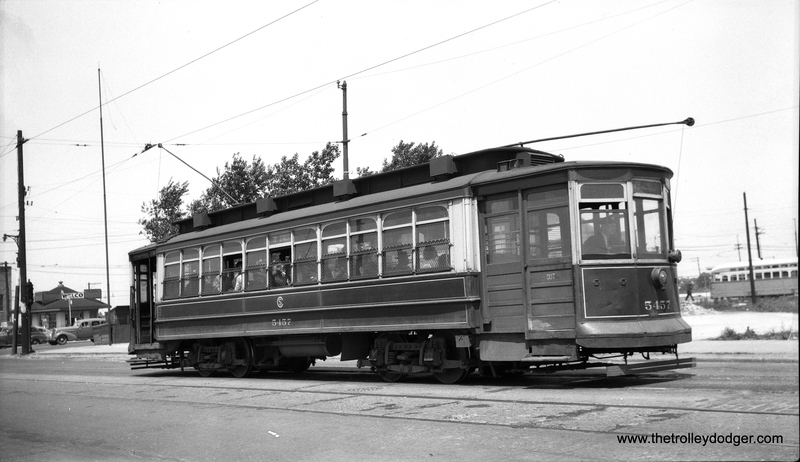 We thank collector Kenneth Gear for sharing a 1962 recording of Toronto streetcars (described below) with us. This features Peter Witts and PCCs. It has been our intent to pair up traction LPs on CDs, to give our customers the best value for their money. 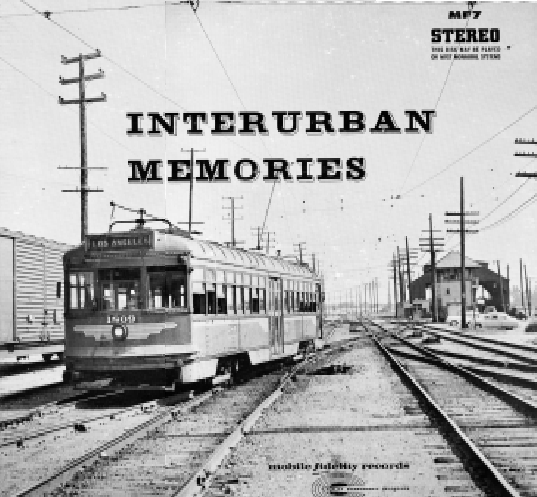 The only traction CD in our collection that still was not paired up with another recording is Interurban Memories, which has audio from both Pacific Electric and the North Shore Line recorded circa 1959-60, the waning days of both these great interurbans. Combining these two LPs onto a single CD results in a running time of more than 73 minutes, at no additional cost to you. All our traction CDs are new 2015 digital remasters, using the modern technology, from the best available sources. In some cases, we have compared multiple versions of the same recording in order to pick the best one to use. We are glad to make these long out-of-print public domain recordings available once again at very reasonable prices. Many of these “orphan works” of long-gone enterprises like the Railroad Record Club have been rescued from the dustbin of history and are now sounding better than ever. Eventually, we hope to have all the Railroad Record Club recordings available once again. 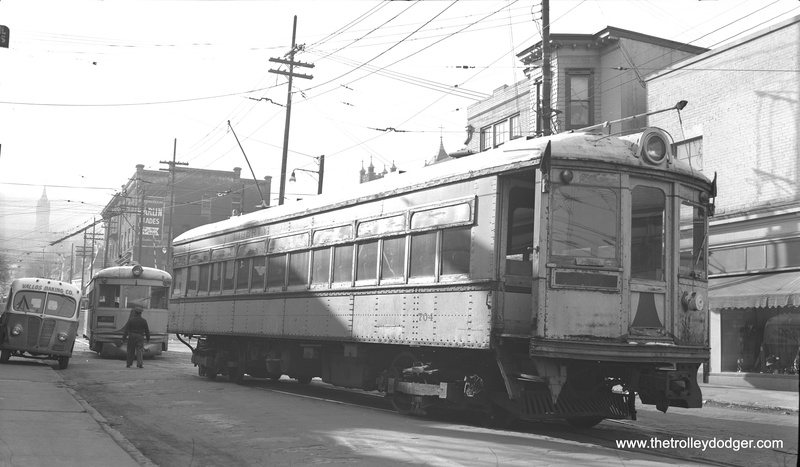 Interurban Memories features Hi-Fi audio of the Pacific Electric and the North Shore Line in their twilight years 1959-1960. 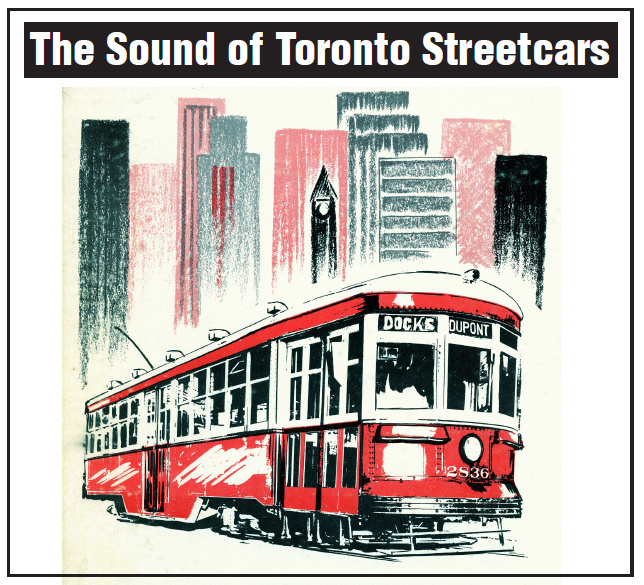 The Sounds of Toronto Streetcars was recorded in 1962. 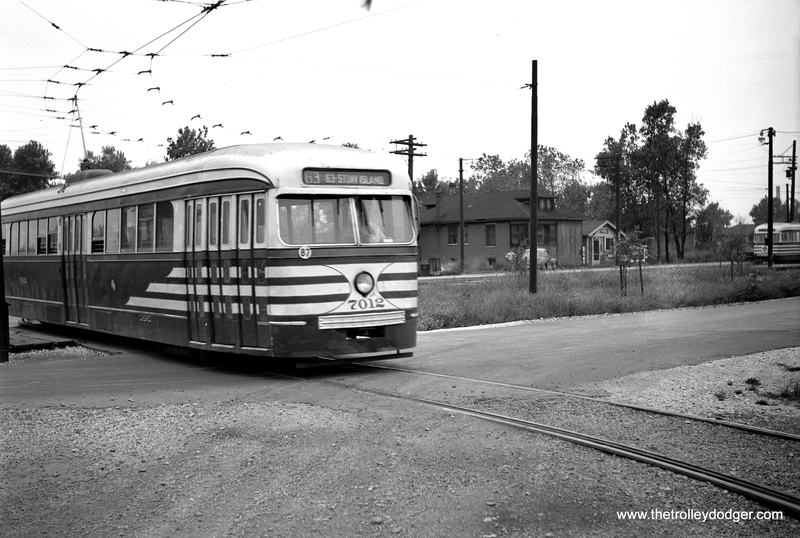 A 1960 CTA photo of the Grand and Nordica off-street bus loop. 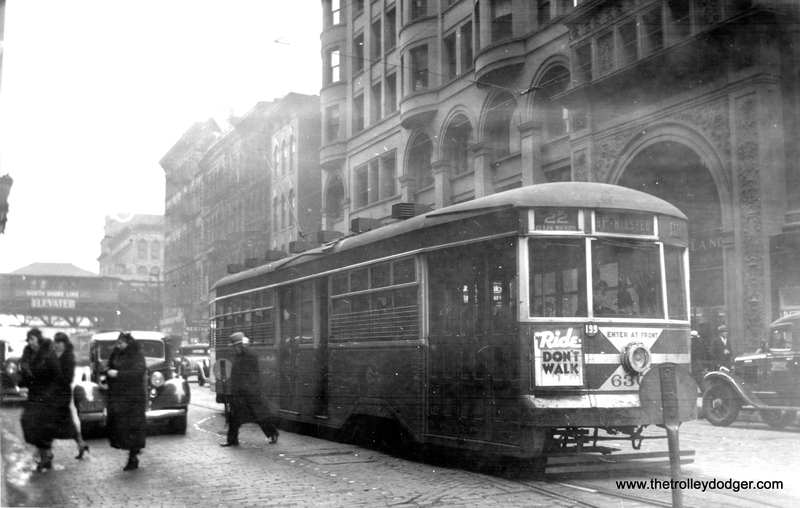 Route 65 – Grand trolley buses began operating from here in 1951, as did route 90 – Harlem buses. 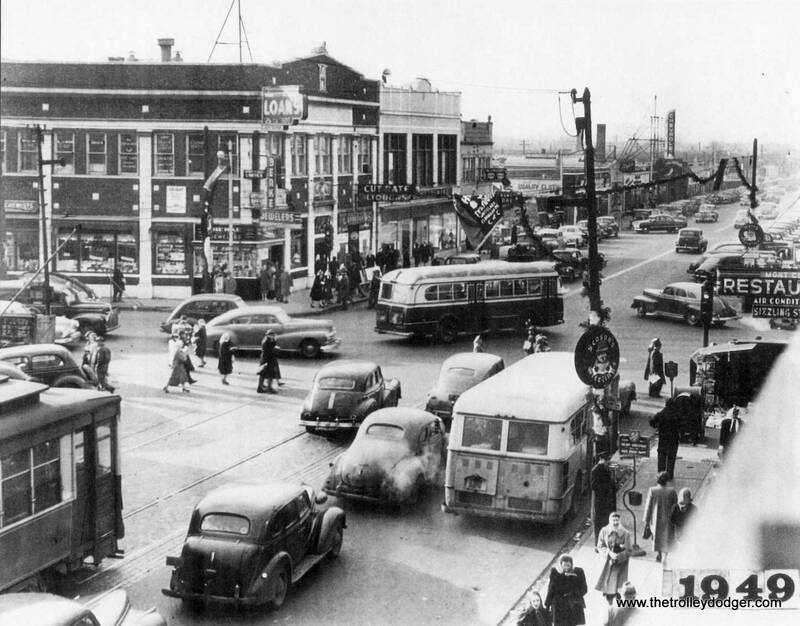 74B West Fullerton buses began using the loop on December 12, 1955. 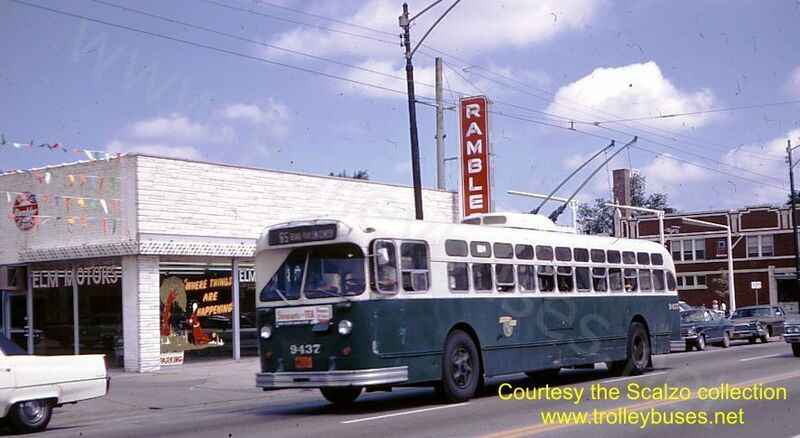 This image from http://www.trolleybuses.net, credited to the Scalzo collection, shows a Grand trolleybus, Marmon 9437, at Grand and Nordica on October 12, 1968. 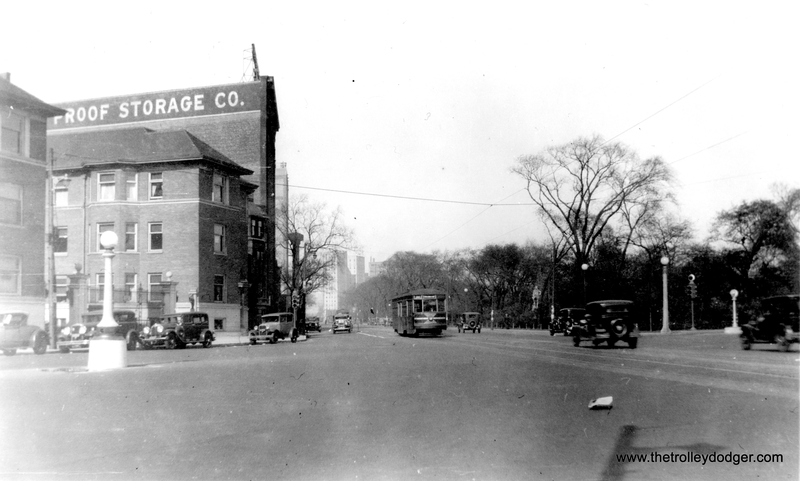 There was a grocery next to the loop, which later became a thrift store. 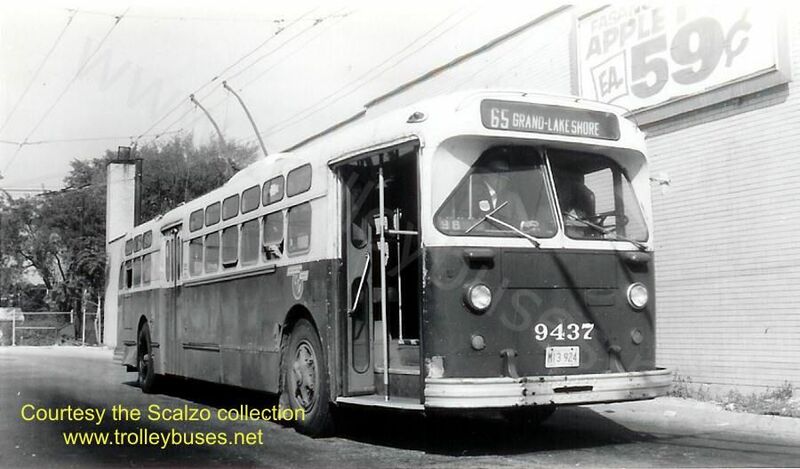 Marmon 9437 westbound on Grand at Newland on September 7, 1969, again from http://www.trolleybuses.net and the Scalzo collection. From 1954 to 1964, my family lived just south of here on Medill. The Rambler dealer later became AMC, then Jeep, Chrysler-Jeep and is now demolished. We are a short distance from the Grand-Nordica loop. The CTA bus loop at Grand and Noridca as it appears today. 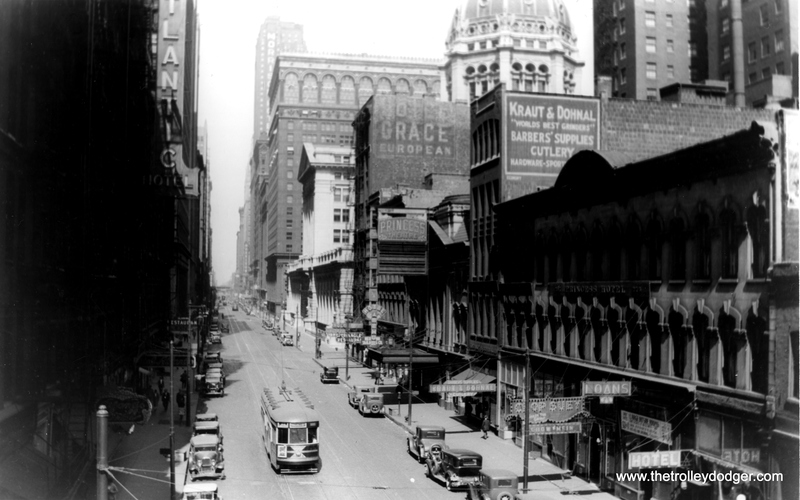 The two halves of the loop are bisected by retail, which once included the Terminal Grill, which had pictures of Grand Avenue streetcars hanging on the wall. From 1951 to 1973, CTA route 65 trolley buses turned back here. A contemporary view looking east on Lake Stret just west of Laramie. 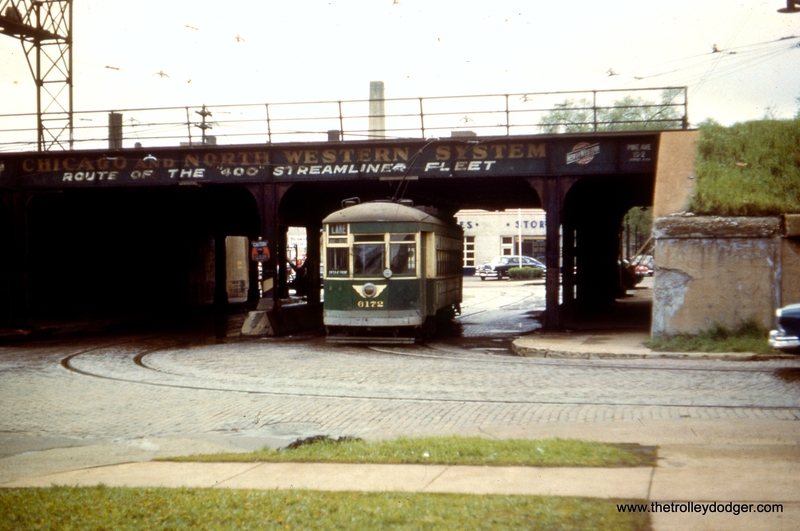 Until October 1962, the “L” descended onto the left portion of Lake Street and ran at ground level to Forest Park. Lake and Pine today, the same general view as the previous photo. 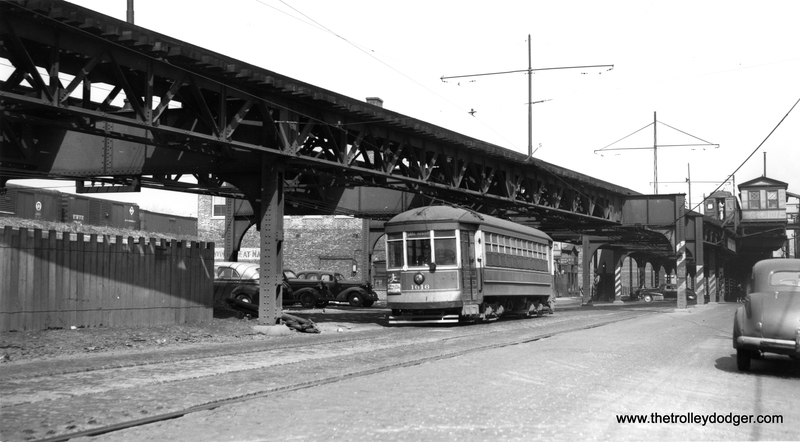 CTA 6172 passes under the Chicago & North Western overpass near the west end of route 16 – Lake in June 1952. 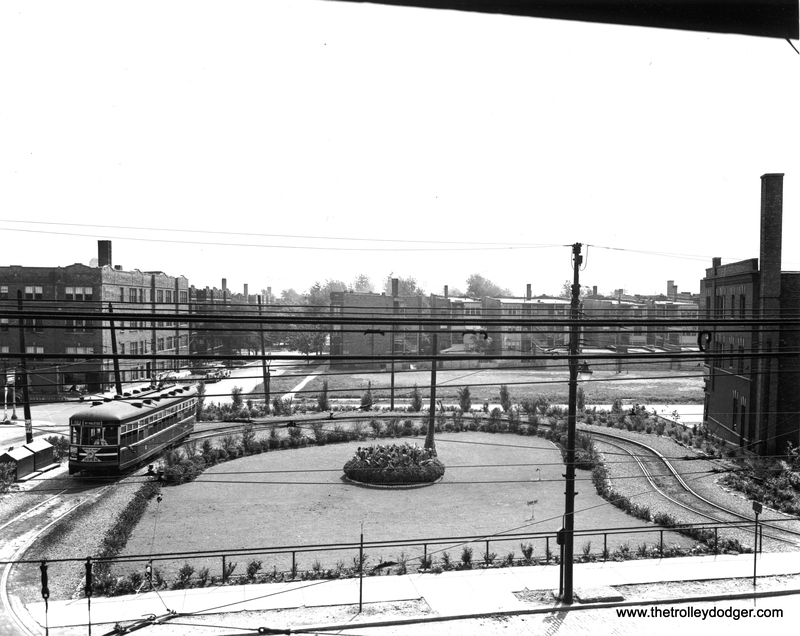 We are facing south, and the streetcar would also have just crossed the Lake Street “L” tracks on the other side of the viaduct. The ground-level portion of Lake was elevated onto the embankment in 1962. Route 16 ended a short distance west of here at Austin Boulevard, the city limits. Pine Avenue at Lake Street, looking south. 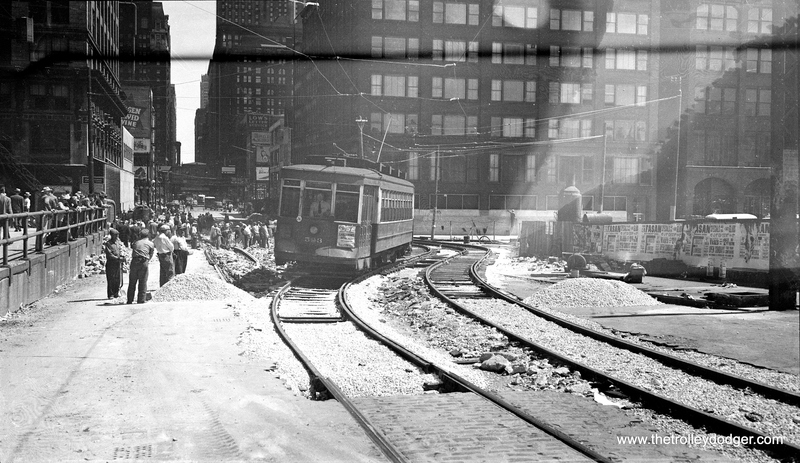 This is the same view as in the previous photo showing where the Lake streetcar went under the C&NW embankment until the end of May, 1954. CSL 3144 is eastbound on route 16 – Lake, just west of where the line passed under the C&NW. The view today looking west on Lake Street at Pine Avenue, where Lake and its streetcar crossed under the C&NW embankment. This is approximately the same view as the previous photo. In 1946, my grandparents on my mother’s side bought a wooden frame house at 6226 South Honore Street in Chicago. Previously, they had lived in Lakeview on Newport starting in 1937. 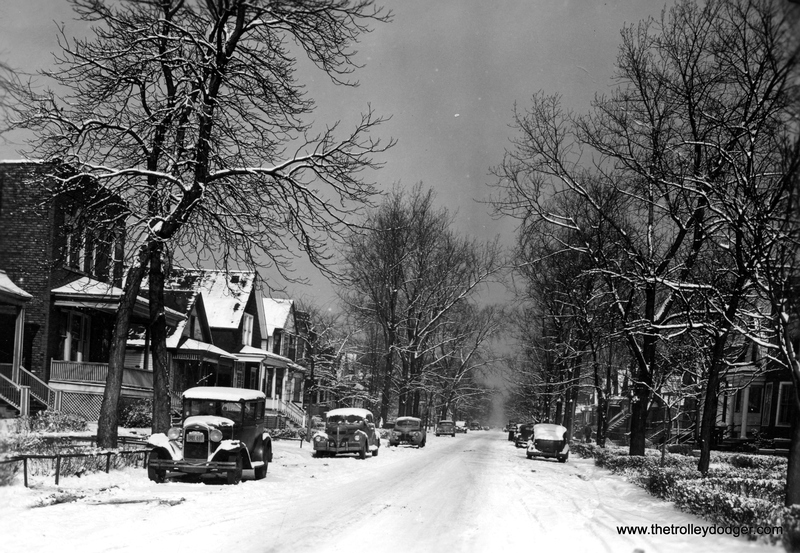 This is what their block on Honore looked like in 1946. The jalopy at left, which looks like a Model A Ford, was their car and must have been the oldest one on the block. The house remained in the family until the early 1970s when my uncle sold it. It has since been demolished, as have most of the other homes on this block. 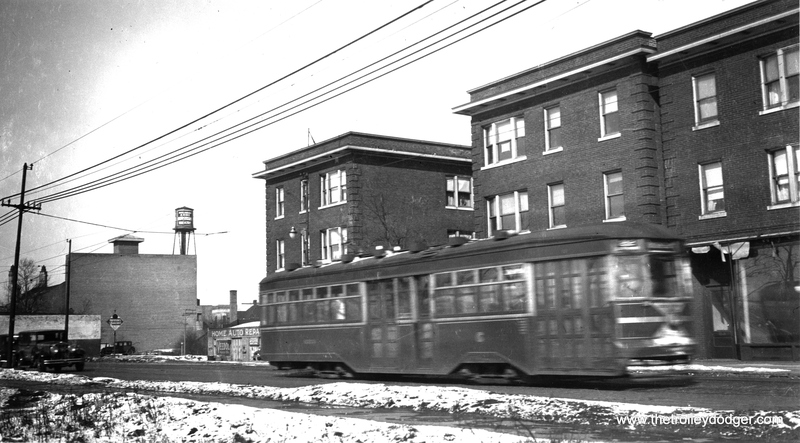 They lived just north of 63rd Street, which had a busy streetcar line, and less than a mile away from Loomis, west end of the Englewood branch of the south side “L”. 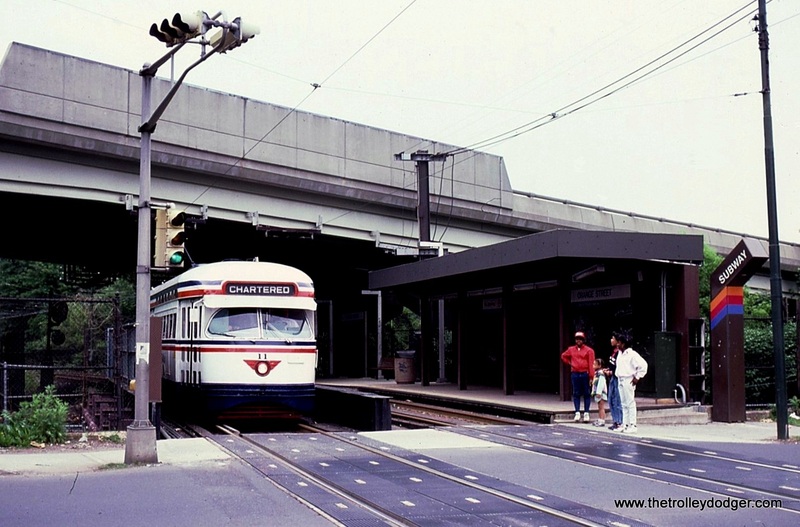 In 1969 the “L” was extended west a few blocks to Ashland, a more logical place to transfer to buses. CTA Pullman 133, eastbound on 63rd Place private right-of-way between Narrangansett and Central on the 63rd Street line. 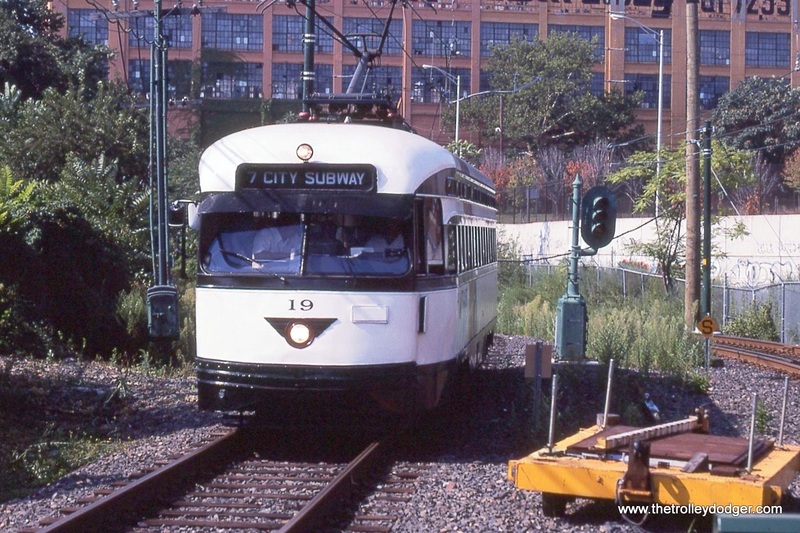 PCC 7023 heads west on the mile-long private right-of-way at the west end of the 63rd Street line. This is a built-up residential neighborhood today. CTA prewar PCC 7012 at the west end of the 63rd Street line (63rd Place and Narragansett). Not sure which direction we are facing. A view of the CTA bus loop at 6400 West 63rd Place as it appears today. The wooden frame building at right looks very much like one in the previous prictrue. According to Andre Kristopans, the loop was reduced in size to make room for the new Chicago Public Library branch at rear. 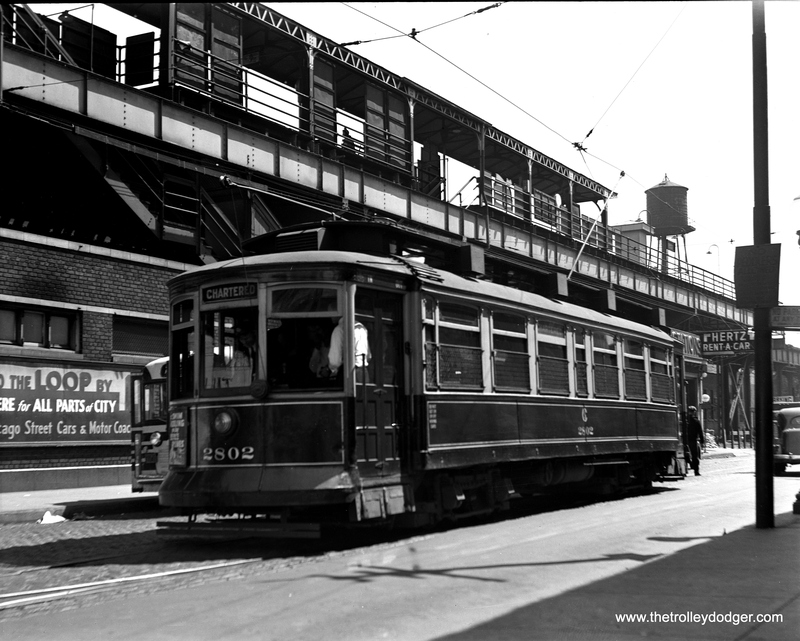 CTA 3167 and 479 at Cermak and Kenton on May 16, 1954, by the massive Western Electric plant. 479 was there on a “farewell to red cars” fantrip sponsored by Central Electric Railfans’ Association, which was organized by Bernard Rossbach. 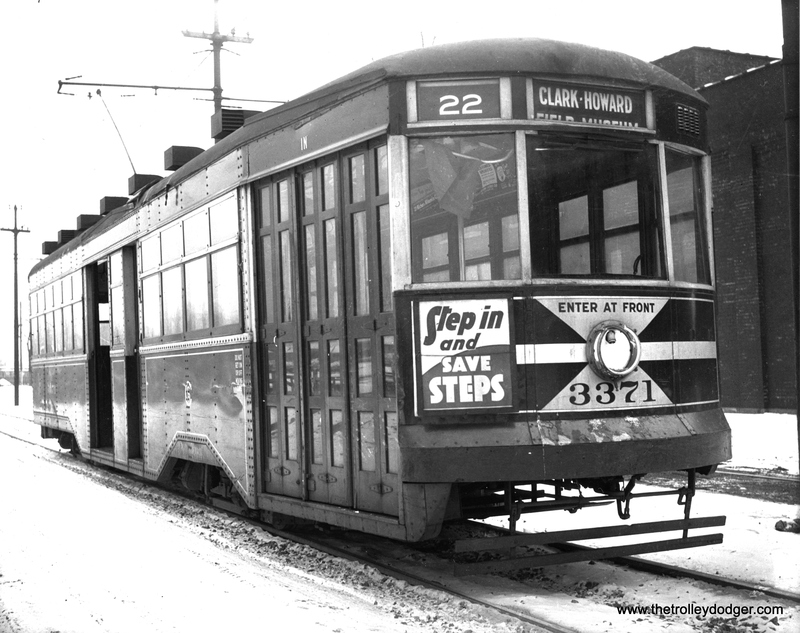 CTA regular service car 3167, painted green, is at Cermak and Kenton, west end of route 21. 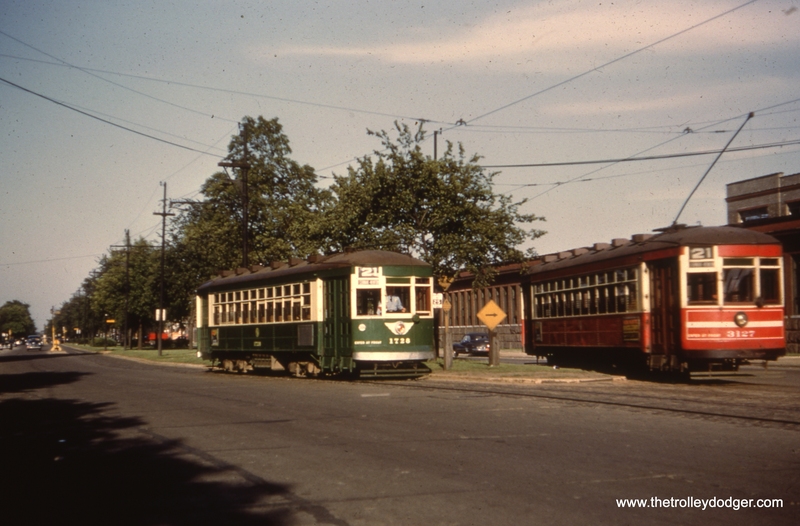 Red cars 479 and 473, at the rear, are on the famous CERA “farewell to red cars fantrip.” The date is May 16, 1954, two weeks before the end of red car service in Chicago. 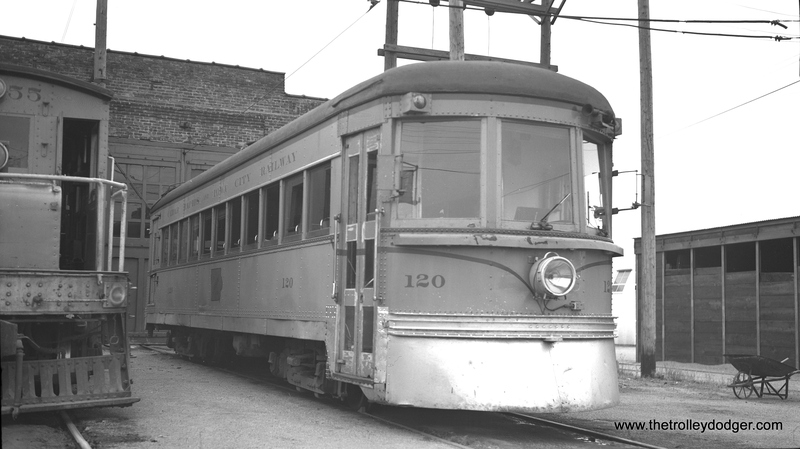 CTA 1728 and 3127 at Cermak and Kenton in May 1952. 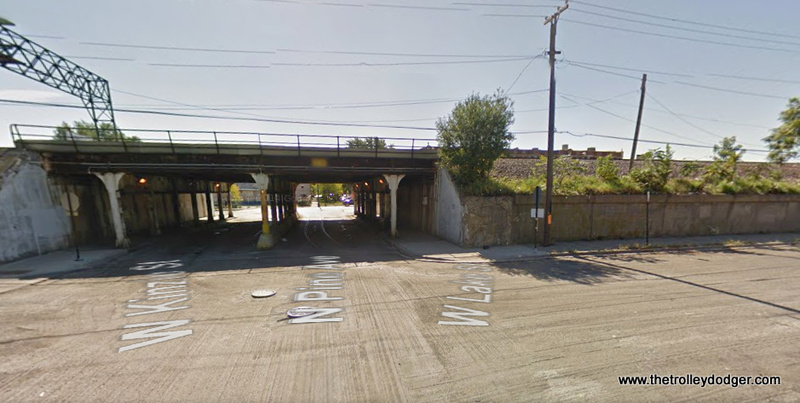 This was the western end of route 21 – Cermak. 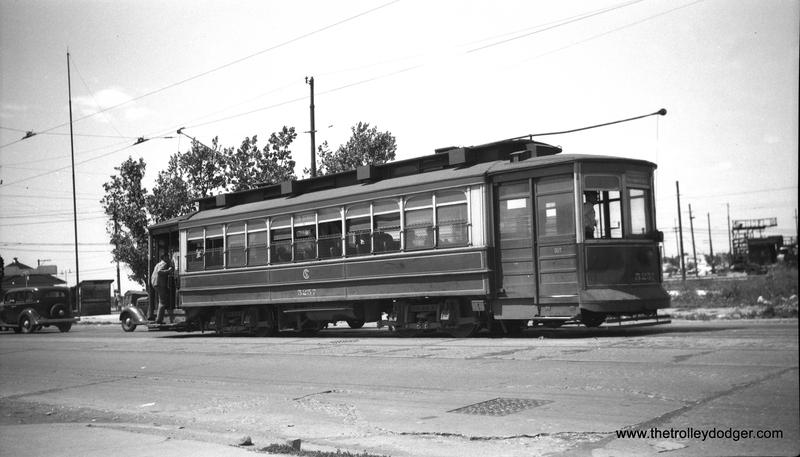 CTA 1724 is westbound at Ogden and Cicero on June 24, 1951. CTA 3232 is on route 67 at 71st and California, the west end of the line. 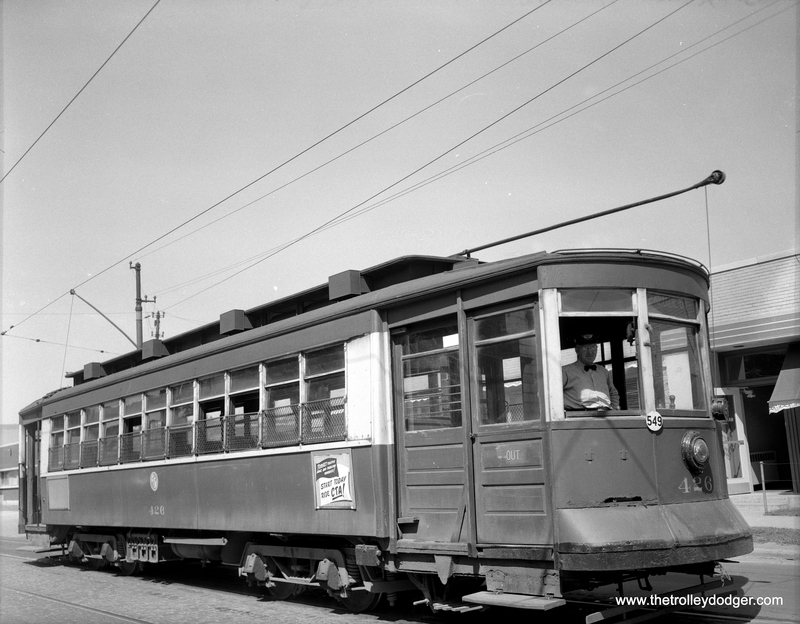 CTA Pullman 426 on route 52 – Kedzie-California on July 23, 1953, at California-Roscoe. 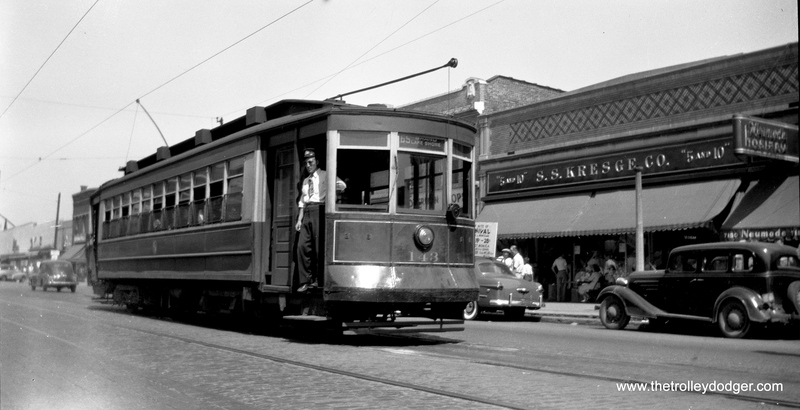 CTA 255 on Route 52 – Kedzie-California, with its two-man crew on July 23, 1953, at California-Roscoe. CTA Pullman 509, an Ashland car at Southport-Clark. 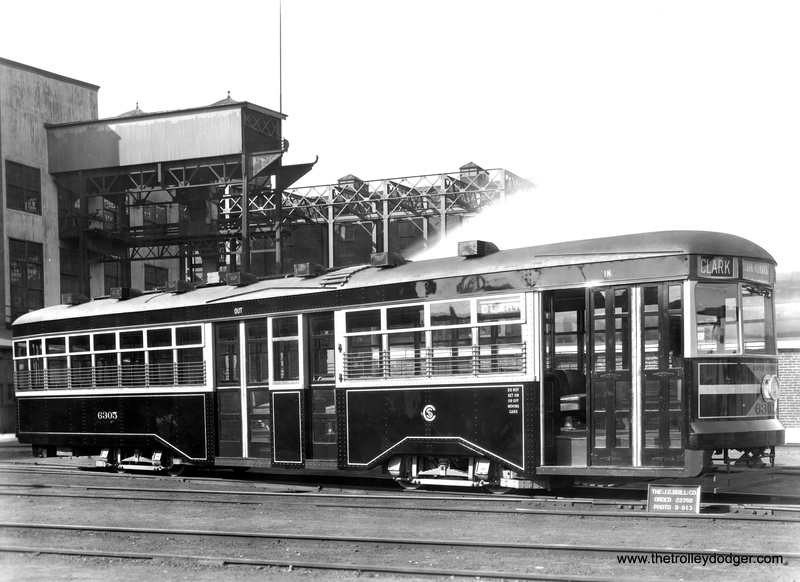 CSL 1731 at Armitage Station (car house) in War Bond livery, July 1942. 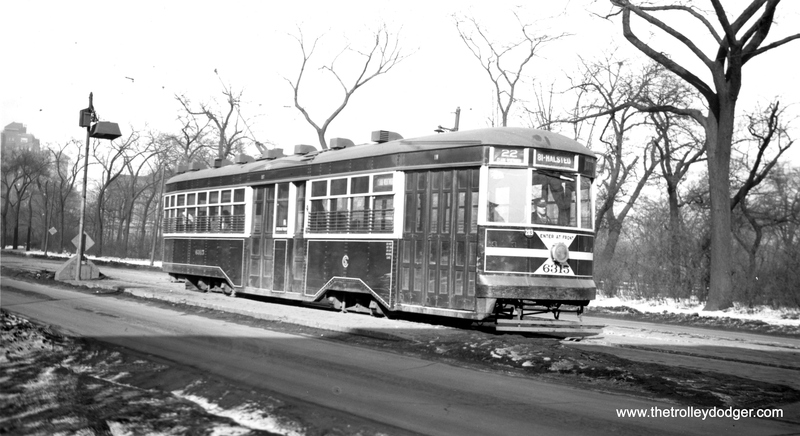 CSL 1910 at the eastern end of the Chicago Avenue line in April, 1941. 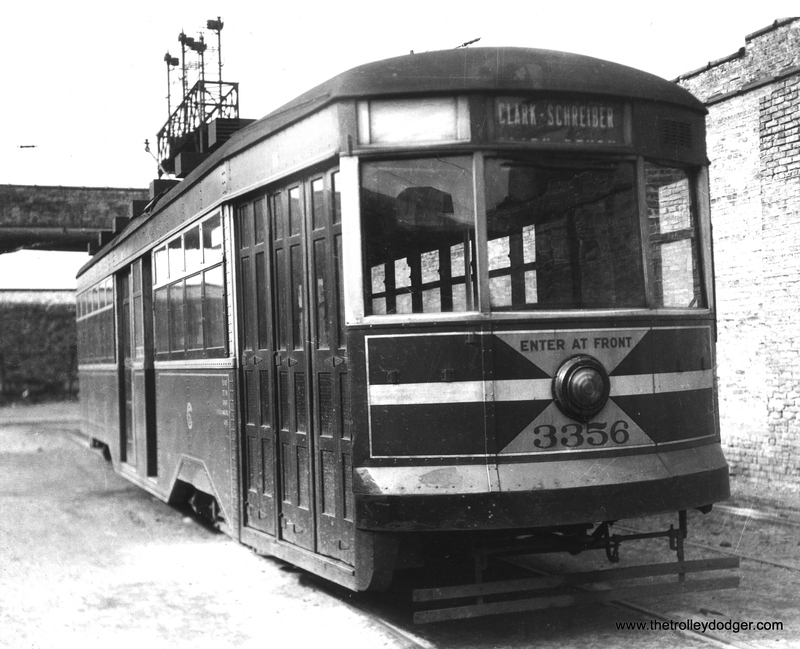 C&IT stands for the Chicago & Interurban Traction Company. Don’s Rail Photos says, “The Chicago & Interurban Traction Company was incorporated in February 1912, taking over all trackage outside Chicago in March 1912 (all trackage in the City of Chicago went to the Chicago City Railway Company). C&IT interurban service continued from the south side Engelwood Elevated Station at 63rd and Halsted (trackage in Chicago was leased along with the shops at 88th and Vincennes) to Kankakee.” Samuel Insull took over the C&IT in 1922 and tried to revive the line, but when the competing Illinois Central elevated much of their line and electrified, the C&IT could not compete and interurban service was abandoned in 1927. 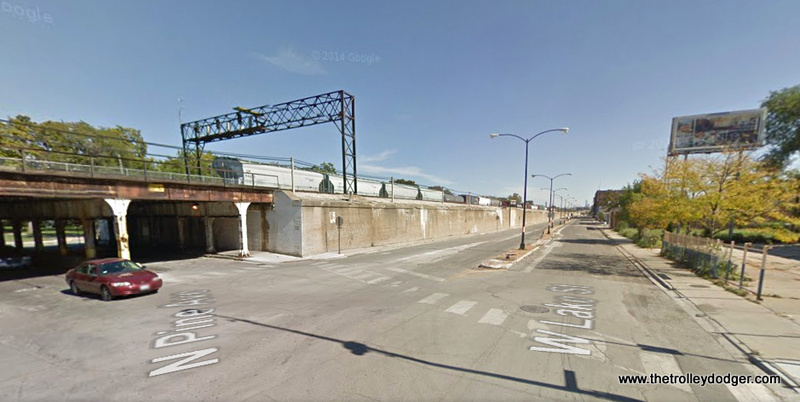 The “L” station at 63rd and Halsted as it looks today. 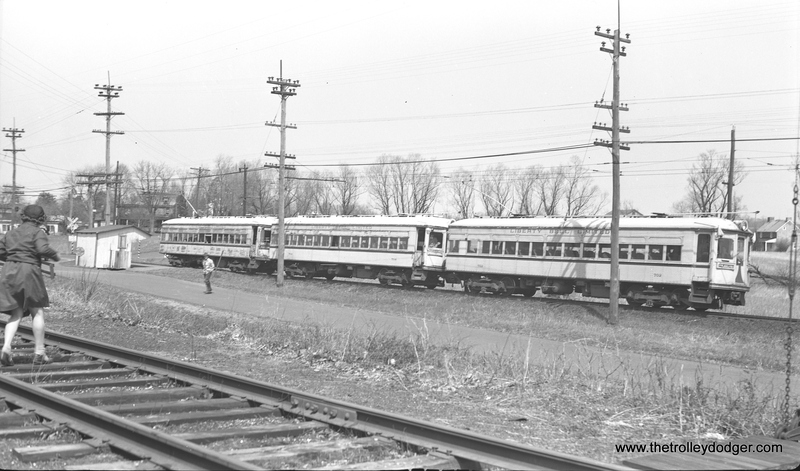 LVT interurbans 1006 and 702 at Perkasie on February 11, 1951. 702 was in fantrip service. 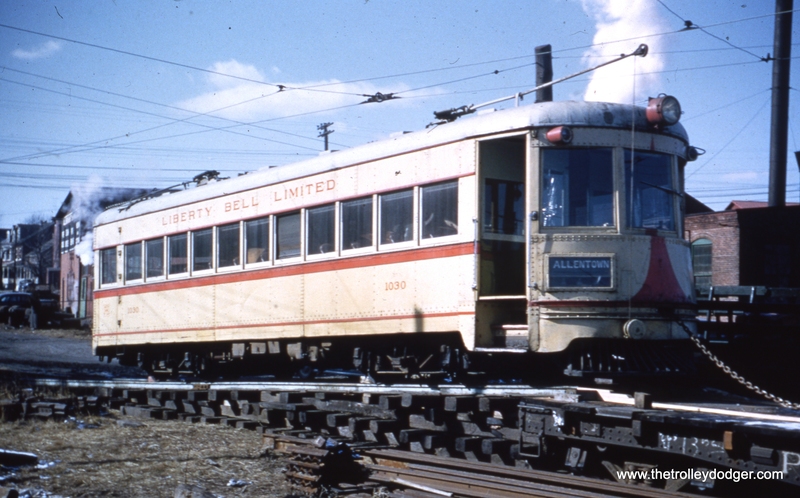 Today, we review a new book about the Liberty Bell Limited, a classic Pennsylvania interurban line that carried passengers between Philadelphia and Allentown until abandonment in the early hours of September 7, 1951. President George H. W. Bush once mistakenly referred to September 7th as Pearl Harbor Day, but to Keystone Traction enthusiasts, it will always be a day that will live in infamy. 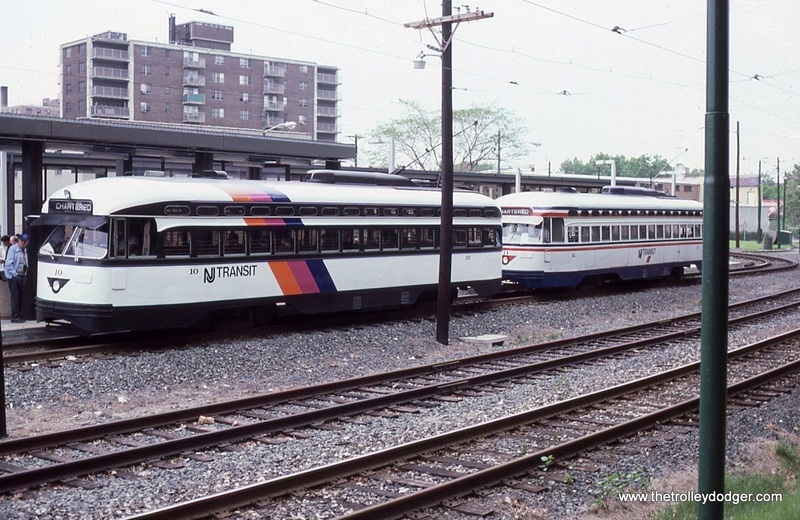 Along with our book review, we offer a generous selection of classic Lehigh Valley Transit photos from our own collections– mostly from the Liberty Bell route, but with a few from the Easton Limited, LVT’s “other” interurban, and even a city car to boot. 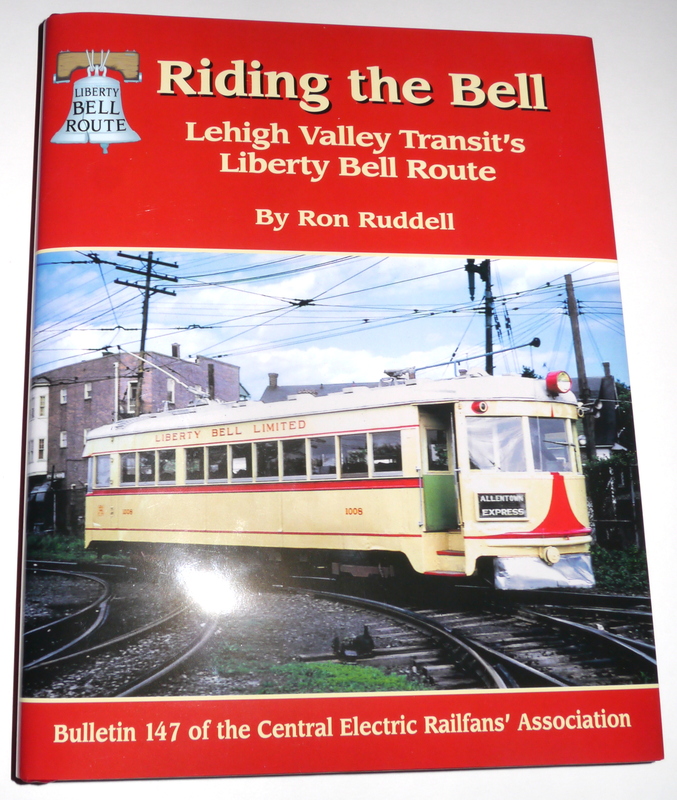 There have been many books written about the famed Liberty Bell Limited over the years, including some excellent ones, but Riding the Bell, available now from Central Electric Railfans’ Association* and their dealers, is sure to stand the test of the time as the best and most comprehensive of the lot. This is not the first time that the “Bell Route” has been covered in a CERA publication, of course. 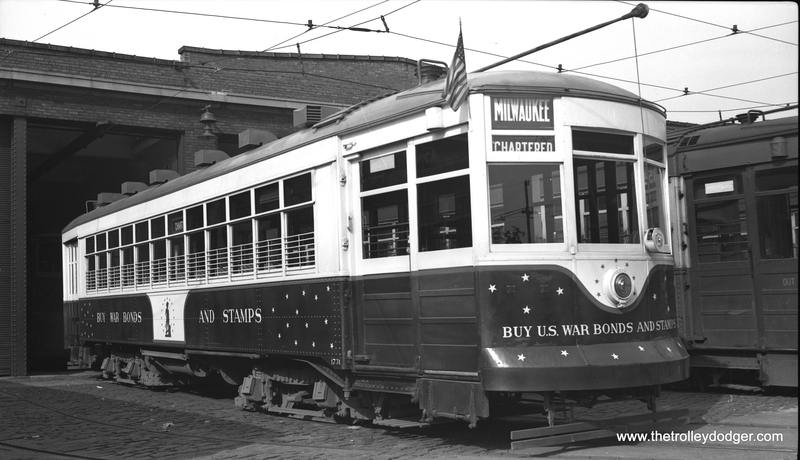 A roster appeared during World War II, and a 1000-series lightweight graced the cover of Trolley Sparks, the organization’s newsletter, when the line was still running. The late author Ronald DeGraw included much information about LVT in his excellent book Pig & Whistle: The Story of the Philadelphia & Western Railway, published by CERA in 2007 as their 140th bulletin. 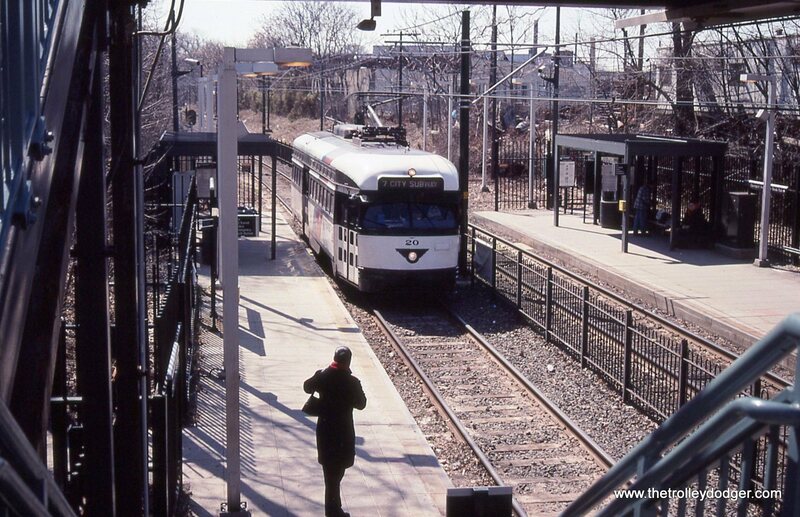 However, that coverage only pertained to LVT’s use of the P&W line to Norristown, which became the Bell’s main route to Philadelphia in the early 1900s. Author Ron Ruddell headed up a group of Pennsylvania traction historians, who labored for ten years to create a book equal to their subject. I am glad to say they have succeeded in spades. A tremendous amount of information has been put into Riding the Bell‘s 224 pages, and it would be hard to put anything else into it without needing to take out something just as important. The 1950s were the twilight years of Keystone Traction, at least outside of Pittsburgh and Philadelphia. 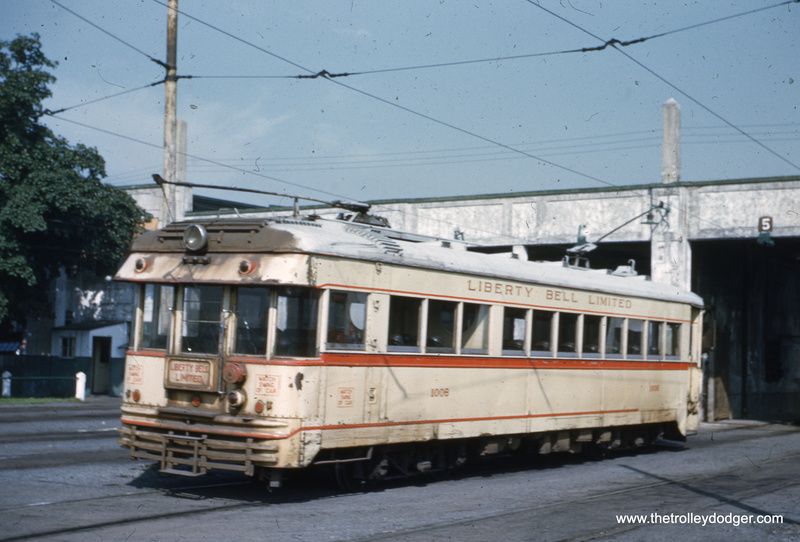 The LVT Liberty Bell Limited was, in some ways, the last great interurban in the eastern United States. 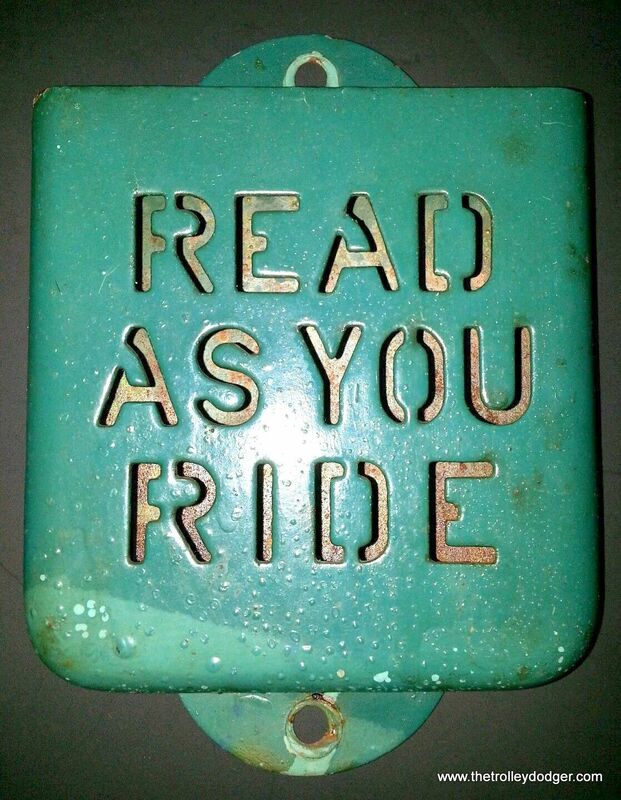 It has been gone for 64 years now, meaning you would have to be a few years older than that to have ridden it, even as a youth. The Bell line is fondly remembered and riding it must have been, in some ways, like riding the world’s largest roller coaster. The area between Allentown and Philadelphia is not flat, with grades that certainly put a strain on LVT’s traction motors. It also included quite a lot of variety, with burst of high speeds, followed by numerous stops in many small towns. Several of the station buildings in these towns still exist. 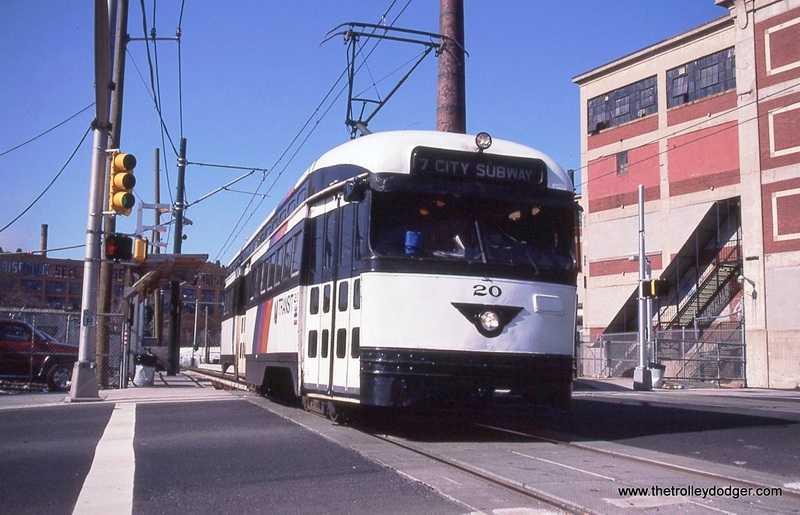 Luckily for us, Lehigh Valley Transit must be about the most well-documented operation ever, perhaps even more so than the Pacific Electric or the three great Chicago-area interurbans. When it comes to photographs, there is literally an embarrassment of riches, and as a result, the book is full of fine photos, some in color. An attempt has been made not to duplicate ones that were already featured in previous LVT books. As a subject, LVT operations covered so much ground that this book does not even attempt to document their extensive city lines or the Easton Limited, LVT’s shorter interurban. Those are wisely left to future authors and future books. 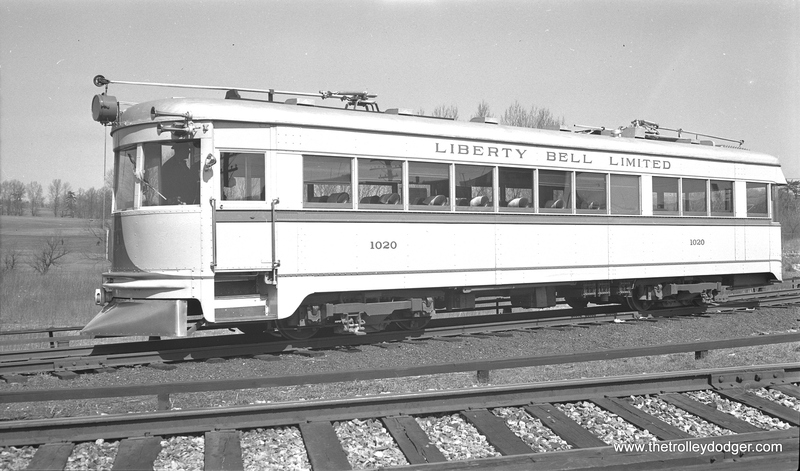 Faced with a need to either modernize or abandon rail service in 1938, LVT took the daring step of updating the Liberty Bell fleet. This task was made even more daunting due to a very constrained budget, which meant buying new PCCs or other such equipment was out of the question. 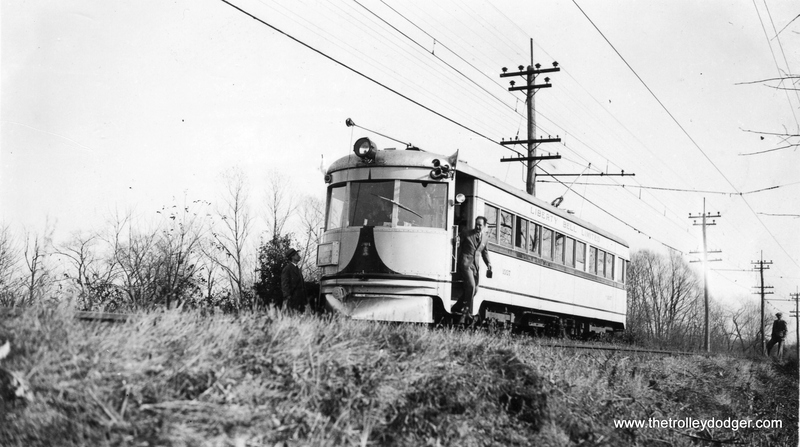 Fortunately, some relatively new (circa 1930) lightweight high-speed interurban cars were available at a relatively low cost, as the Cincinnati & Lake Erie had just been abandoned. 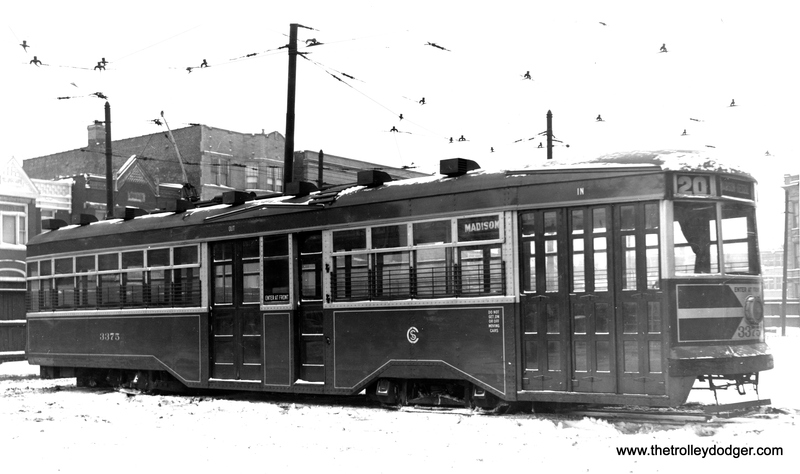 13 cars were purchased for the Bell, along with four Cincinnati curved-side cars for the Easton Limited, and LVT attractively modernized them. 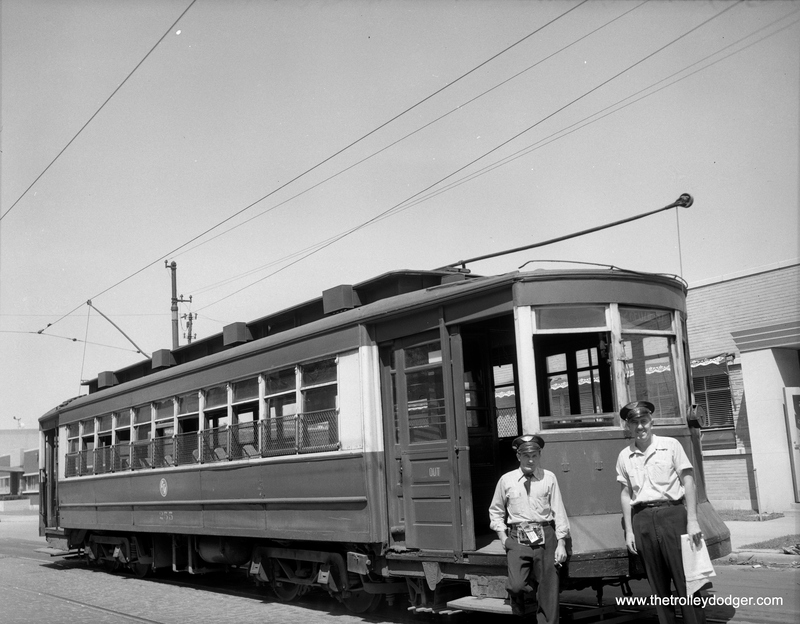 The new cars were a hit with the public, and ridership increased. The facelift was never intended to be permanent, but was hoped to buy the interurban another five years of usefulness before the inevitable switch to bus. It ended up lasting for 12, a testament to the build quality and durability of these cars. There were many unfortunate problems along the way. The ex-C&LE lightweights could not be coupled together. More passengers meant running additional trains in second and third sections. Inevitably, this led to a horrific accident in 1942, which was not the only such collision. 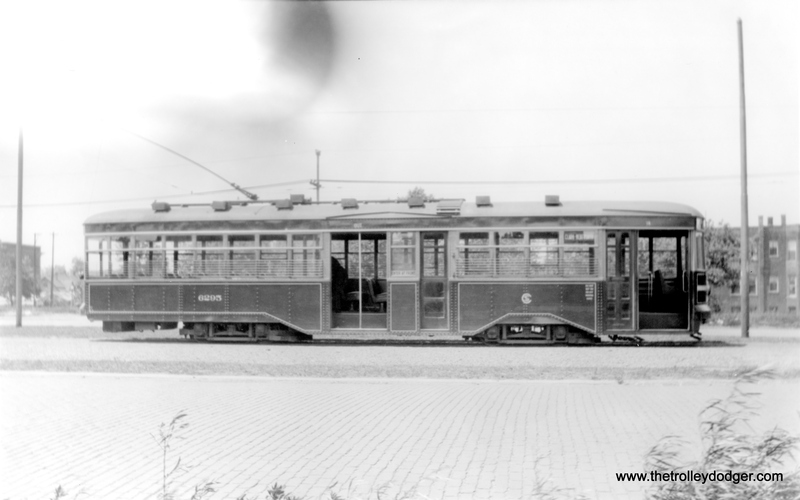 After one of the C&LE cars was destroyed in a fire, LVT purchased one additional lightweight car, which had been built for the Indiana Railroad. 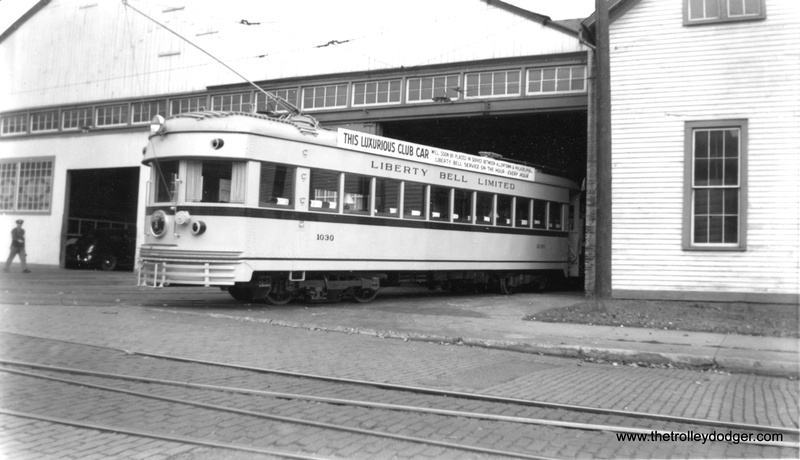 This was rebuilt into club car 1030, which became the standout of the fleet and one of the few Liberty Bell cars that has been preserved. Wartime rationing of gasoline and tires also increased ridership. The wear and tear of all that hill climbing really did a number on those traction motors. 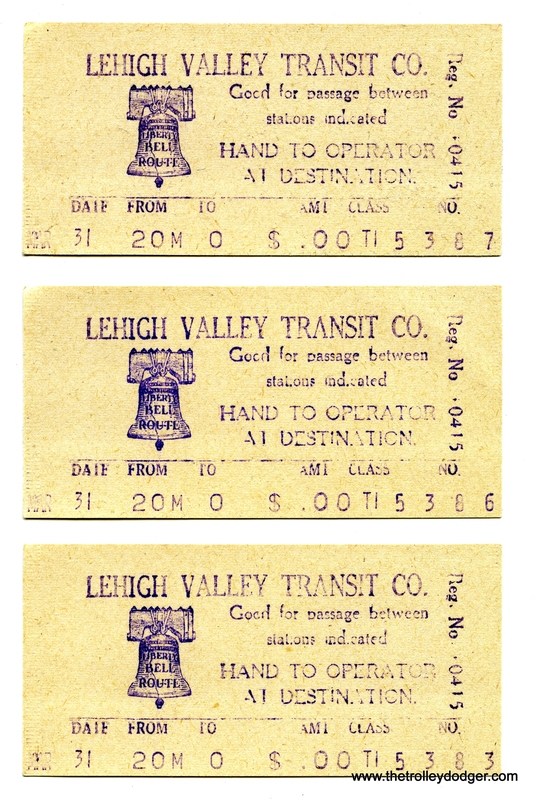 Schedules had to be adjusted in the interest of safety, and running times between Allentown and Philadelphia increased. 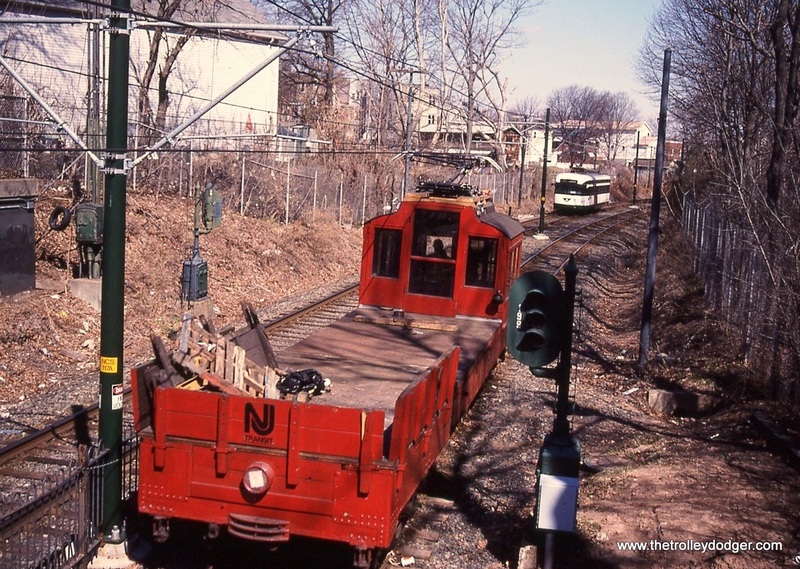 What really would have helped LVT would have been some more of those ex-Indiana Railroad cars, which were very similar to the C&LE “Red Devils” but could be coupled together in as many as three cars at a time. More than two dozen of these cars were available circa 1940-41 but ended up being unsold and were scrapped just prior to the outbreak of World War II. They would have been quite useful to LVT. 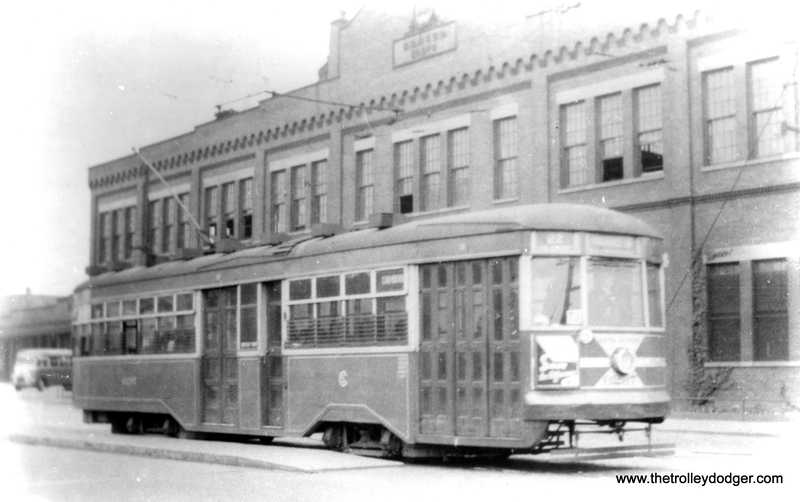 Only two such Indiana Railroad lightweights were saved– car 55, which became LVT 1030, and car 65, which was sold to CRANDIC (Cedar Rapids and Iowa City) and eventually made its way to the Illinois Railway Museum, its first acquisition. Oddly enough, they were made by two different builders. The end of the war in 1945 meant a steep drop-off in interurban ridership. By then, the handwriting was really on the wall for the Bell line, but the end did not come for another few years yet. There was a piecemeal abandonment. For a variety of reasons, well covered in this book and in Pig & Whistle, service was cut back to Norristown. 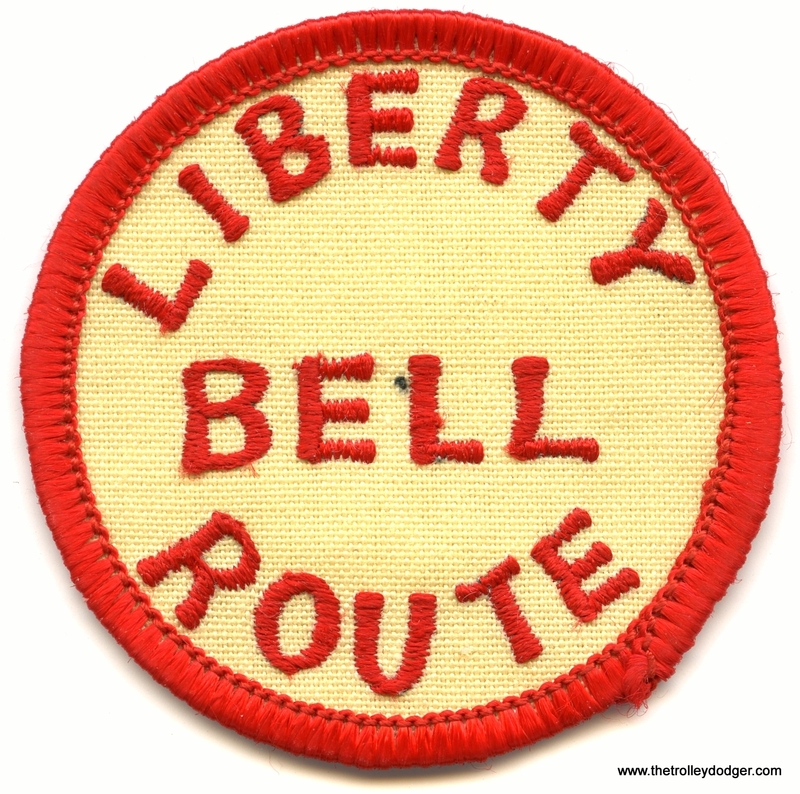 The Liberty Bell Limited never had a direct route to center city Philadelphia throughout its history. 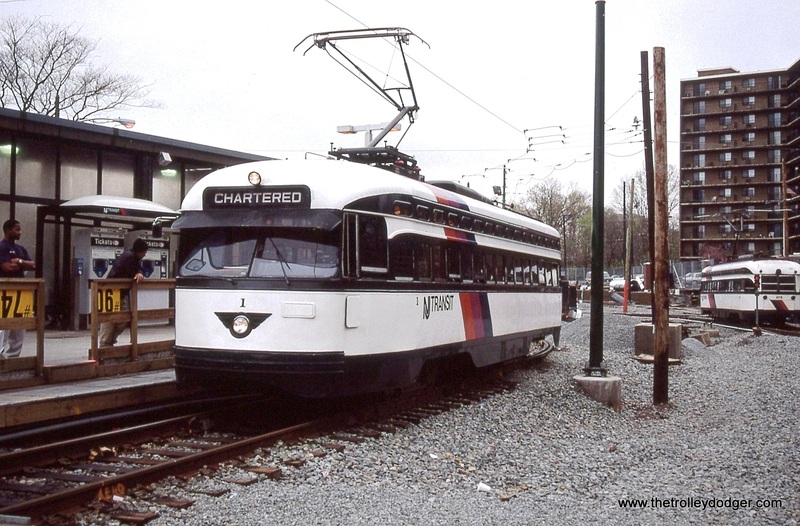 Consideration was given to cutting service back to Lansdale, where the Bell could connect to Reading (now SEPTA) suburban commuter trains to Philadelphia, but this would have necessitated building a turnaround loop for the single-end cars. 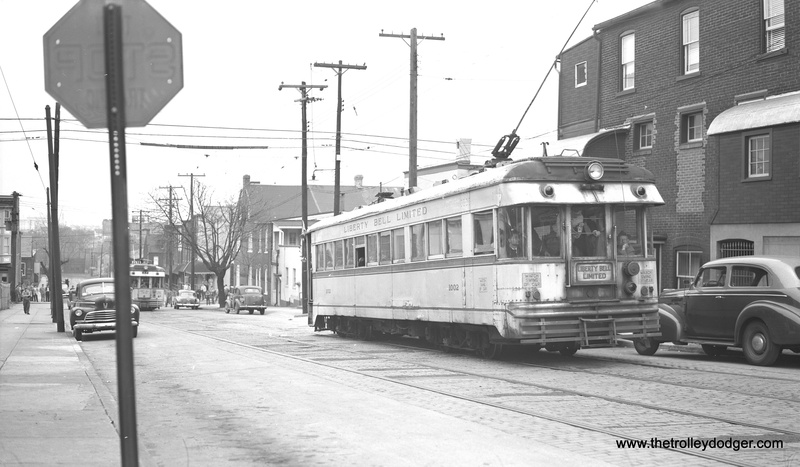 Since the Bell’s days were numbered anyway, LVT decided to simply let service continue as far as Norristown and the P&W. 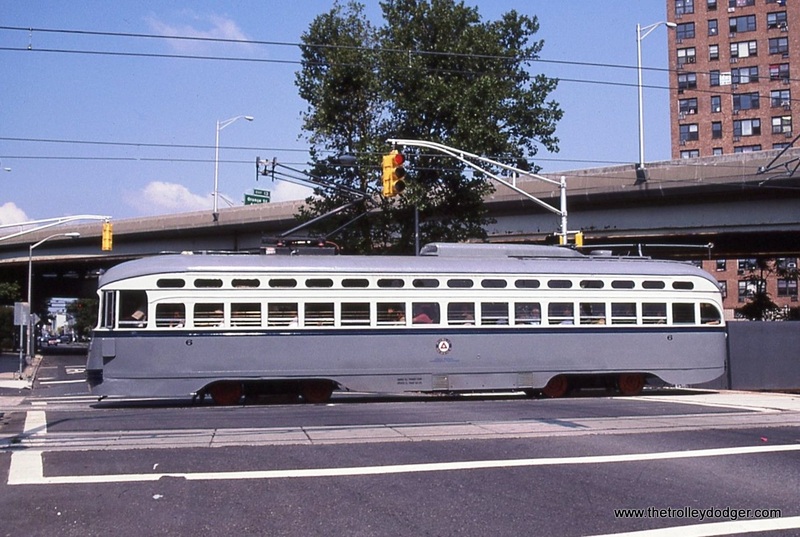 By 1951, LVT had really let maintenance slide, to the point where, in September, only a few of the lightweight interurban cars were still operable. As soon as they could get approval for abandonment, the end was swift. Fortunately, the fans caught wind of it and the railroad allowed them to ride one last time. The rails began to come up the very next morning. In some ways, this abandonment has some parallels in what happened a few years later to the Chicago, Aurora & Elgin. 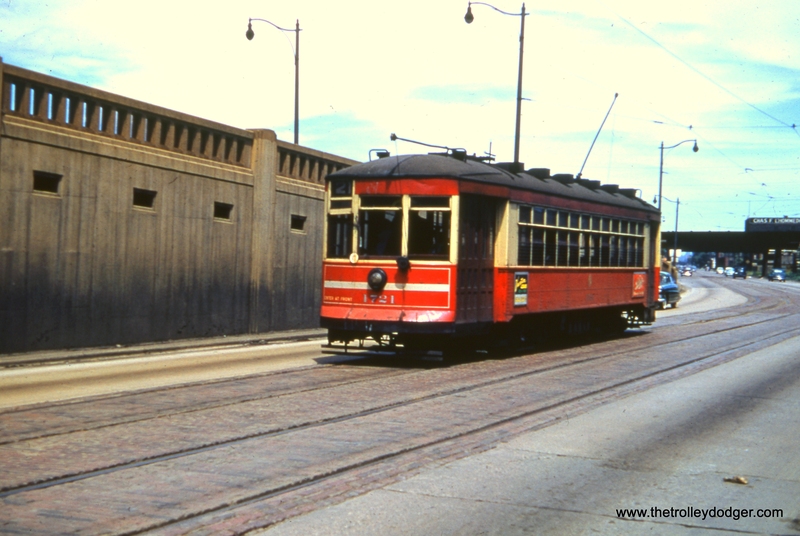 They decided not to continue running trains to Chicago’s downtown over the CTA Garfield Park “L” temporary trackage in 1953, due to expressway construction. In CA&E’s case, however, they kept up the equipment right to the end, as did the Chicago, North Shore & Milwaukee, which quit in 1963. 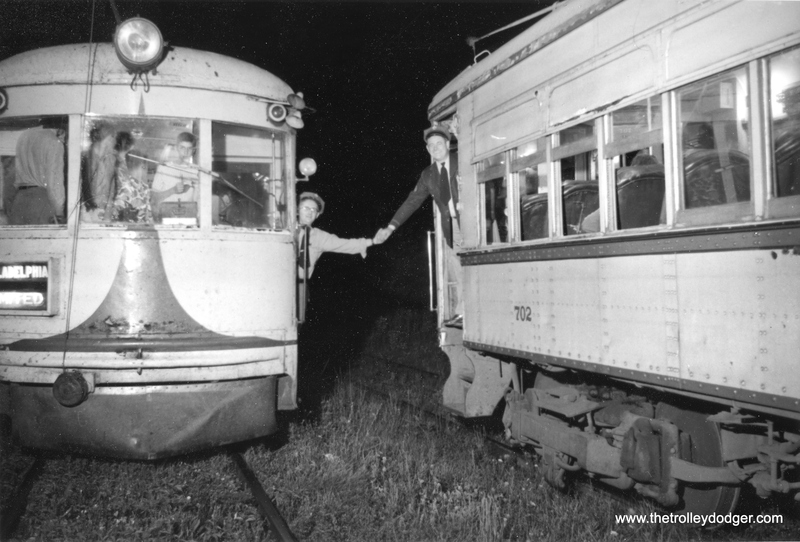 When CA&E got a local judge to allow their “temporary” abandonment of passenger service on July 3, 1957, they ceased operations immediately, stranding thousands of riders who had to scramble for a way home. In LVT’s case, they offered a replacement bus service. 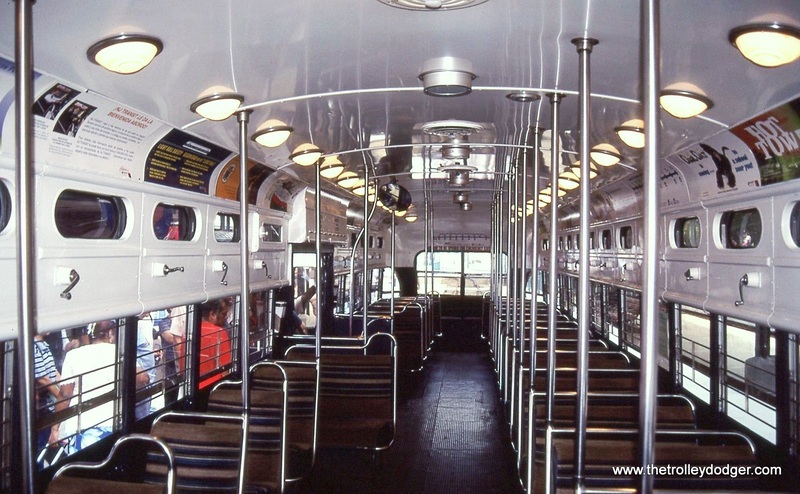 Unfortunately, while the interurban could run in a straight line between towns, the bus had to follow a more convoluted path at right angles. As more and more highways were built in Pennsylvania, even the bus ridership evaporated, and the interurban bus quit without any fanfare in 1956. 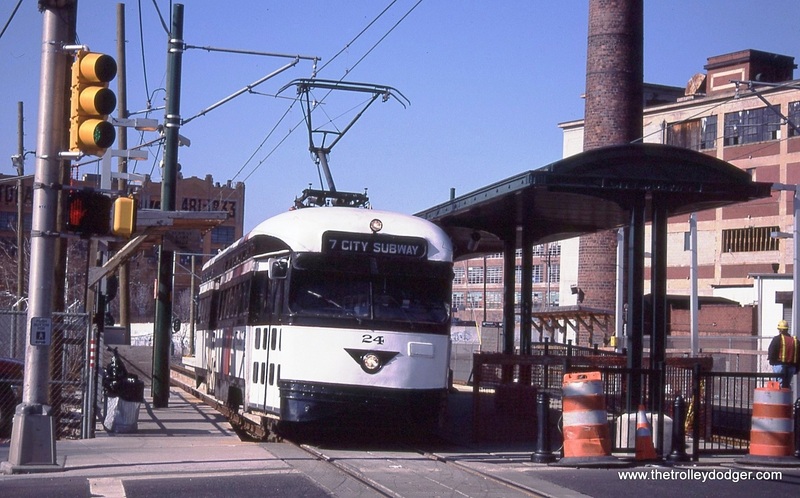 While electric rail transit is undergoing a renaissance in many places around the world today, the chance that anything like a Liberty Bell service might return to the Lehigh Valley is very slim indeed. The cost would simply be too great, compared to the number of potential passengers. But until it does, the spirit of this historic interurban is conjured up very well in this great new volume by Ron Ruddell. Hats off to him, and to the team that worked so long and hard to make this book possible. I would also like to single out John Nicholson, who acted as project coordinator for CERA in bringing this very worthy book over the finish line. Publishing any book like this is a very complicated effort. The layout, by the veteran team of Jack and Ad Sowchin, is handsome and attractive. CERA merits a lot of credit as well for publishing this wonderful addition to the historical record. Even if you do not live in Pennsylvania, the book may interest you. The Bell was one of the classic interurbans and, in one way or another, it had many connections to the Midwest. It is highly recommended, and I urge you to purchase a copy if you have not done so already. Only limited quantities of such books are made, and once they run out, the prospect of them being reprinted is unlikely for a variety of reasons. Many previous CERA books have become collector’s items and cost more to buy used than they did when new. I will not be surprised when this book sells out and if you don’t purchase your copy today, you may have difficulty picking one up in the future. In addition to this book, there are also some excellent Liberty Bell videos on the market, and those will really give you an idea of what the line was all about, after you have whetted your appetite by feasting on Riding the Bell. 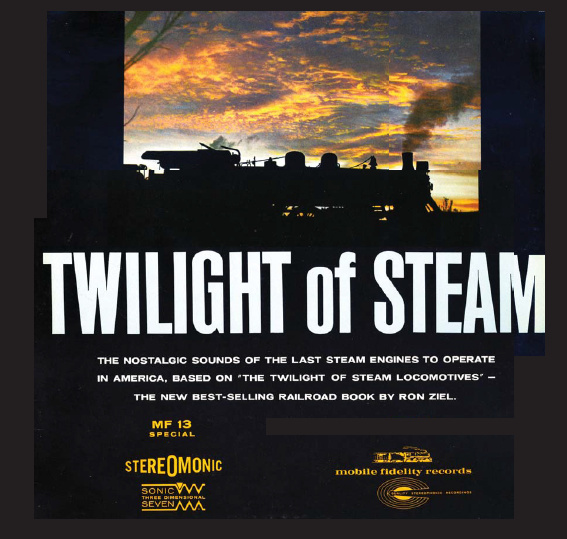 PS- You can also experience some of the twilight of Keystone Traction via one of our recently released audio CDs, featuring 1950s-era Hi-Fi recordings of Johnstown Traction, Altoona & Logan Valley, and Scranton Transit, available from our Online Store. Just look for the Railroad Record Club disc with LPs 23 and 30 on it. This is our 102nd post, and we are gradually creating a body of work and an online resource for the benefit of all railfans, everywhere. To date, we have received 99,000 page views from over 28,500 individuals. 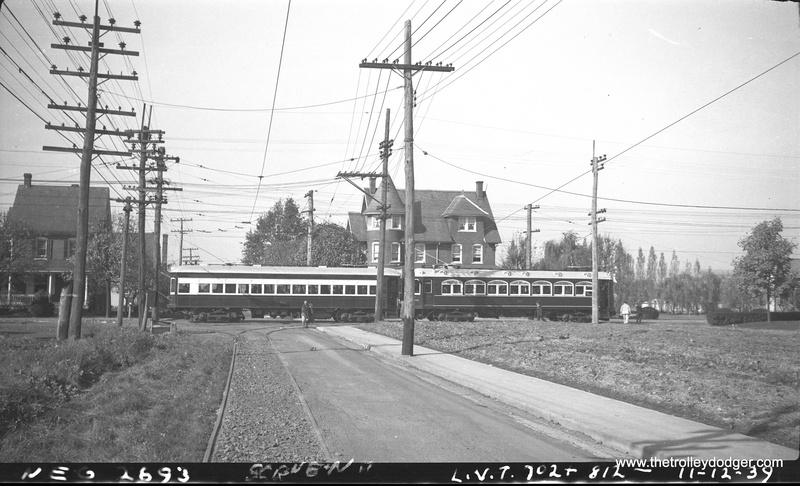 LVT 808 in Allentown on April 22, 1934. 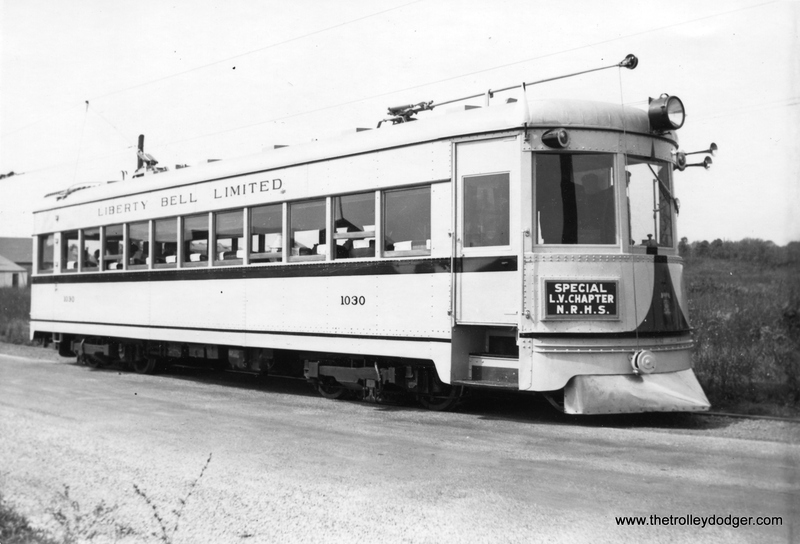 Don’s Rail Photos: “808 was built by Jewett Car in 1913. 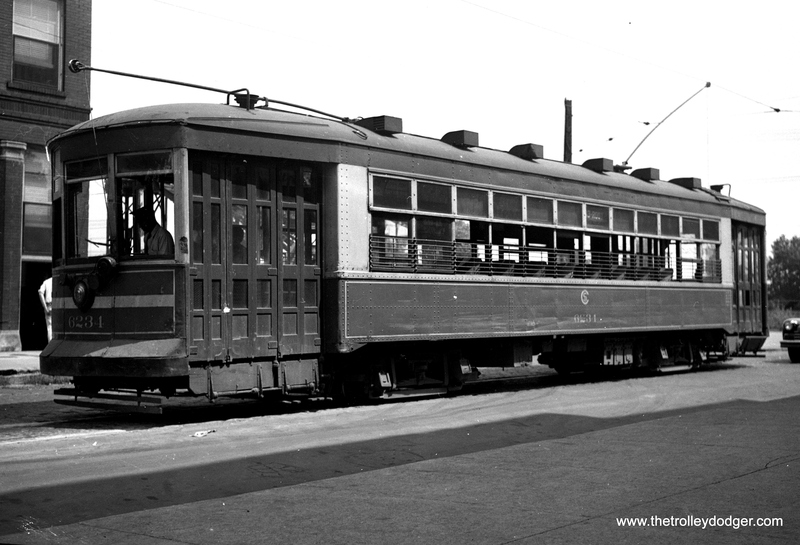 It was rebuilt as C15 in 1935.” The C-series cars were used for interurban freight. 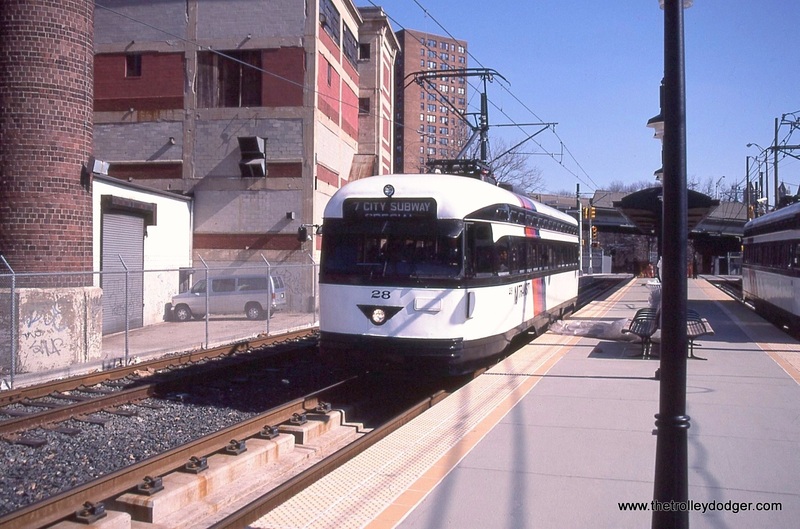 LVT 805 at 69th Street terminal in Upper Darby. This car was built by Jewett circa 1912-13. Apparently this car has been preserved and is privately owned but not operable. 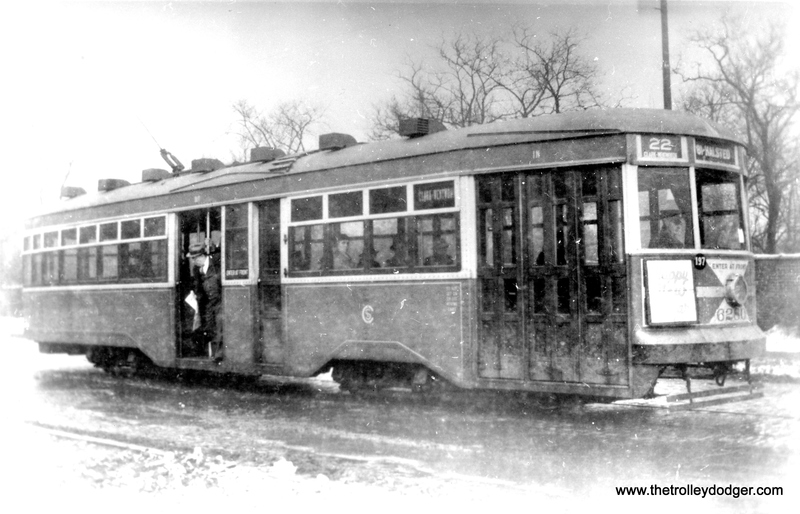 LVT 1007 at Perkasie on November 12, 1939. LVT 702, 704, and 710 are southbound on a fantrip at West Point on April 15, 1951. 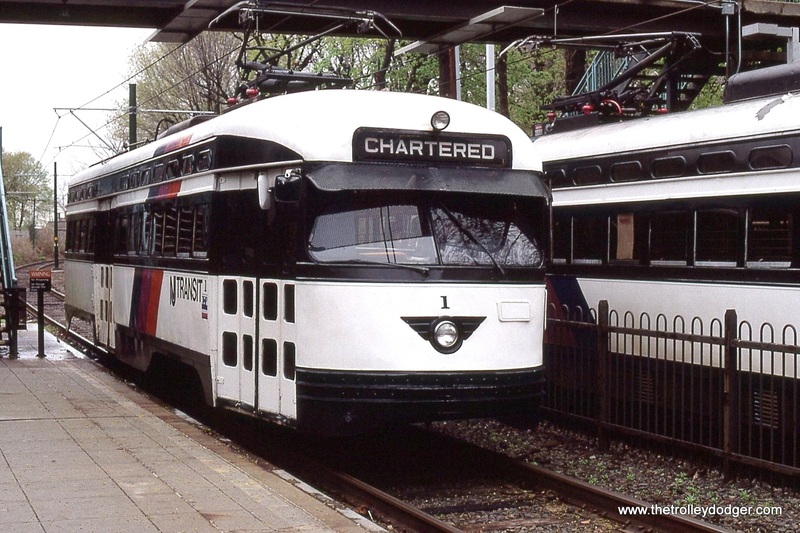 This was the first and only time a matched set of three 700-series cars were operated as a multiple unit. Shortly after this, the 710, looking pretty shabby here, was scrapped. LVT 702 at Locust Siding on February 11, 1951. From this scene, it would appear that a Liberty Bell Limited lightweight is backing up to the LVT downtown terminal in Allentown. 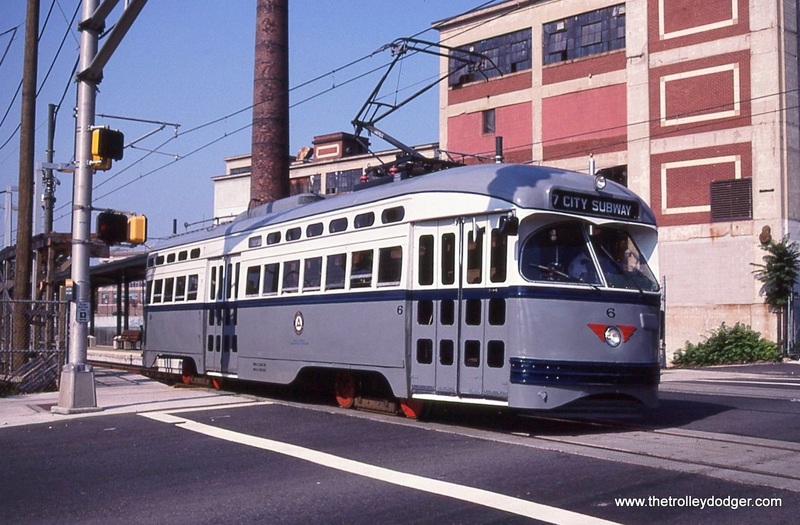 Meanwhile, LVT city streetcar 900 passes by. 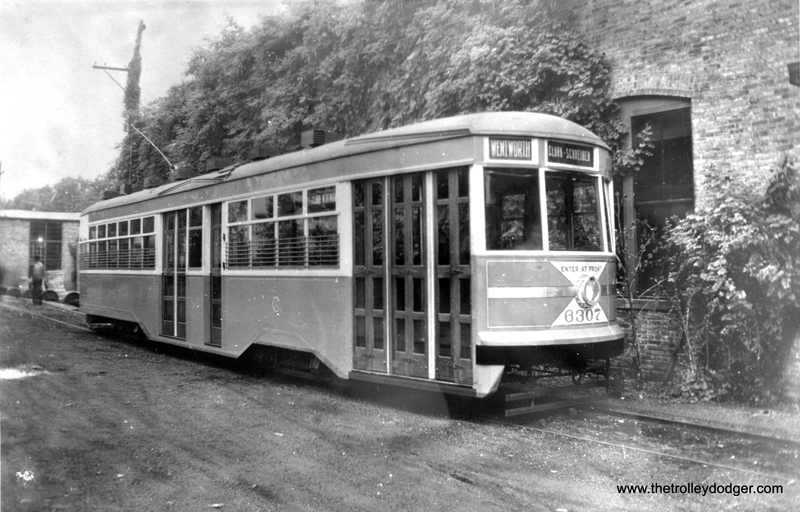 Don’s Rail Photos says, “900 was built by Brill Car Co in February 1917, (order) #20206. It was (later) rebuilt.” Looks like an LVT employee is crossing the street. 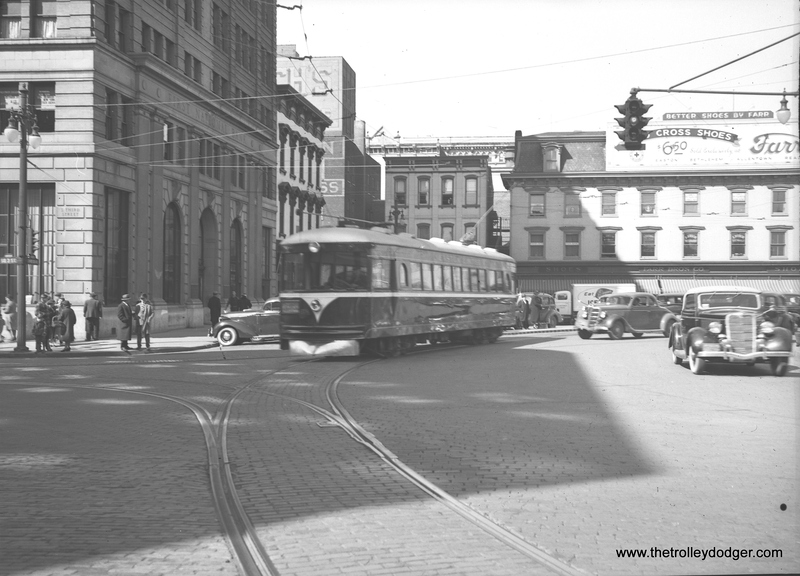 An LVT 1100-series lightweight interurban, still looking shiny, in the Easton town square circa 1939. 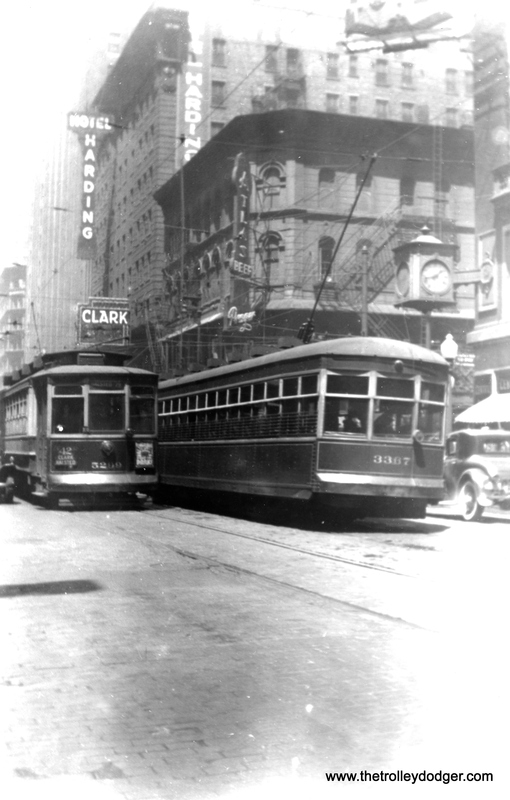 These Cincinnati curved-side cars were built in 1929 for the Dayton & Troy. They were repossessed in 1932 and remained at the Cincinnati Car Company plant until sold to LVT in 1938. 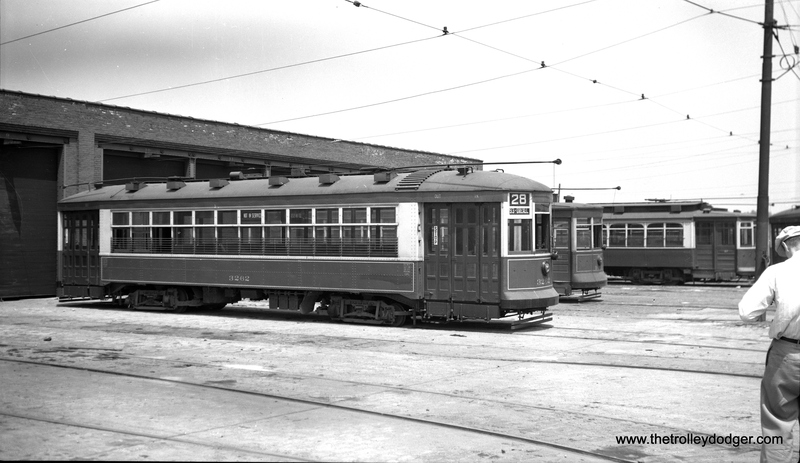 After the Easton Limited was bussed in 1949, two of the four cars were sold to Speedrail in Milwaukee, where one operated briefly as car 66. Unfortunately all four cars were scrapped. 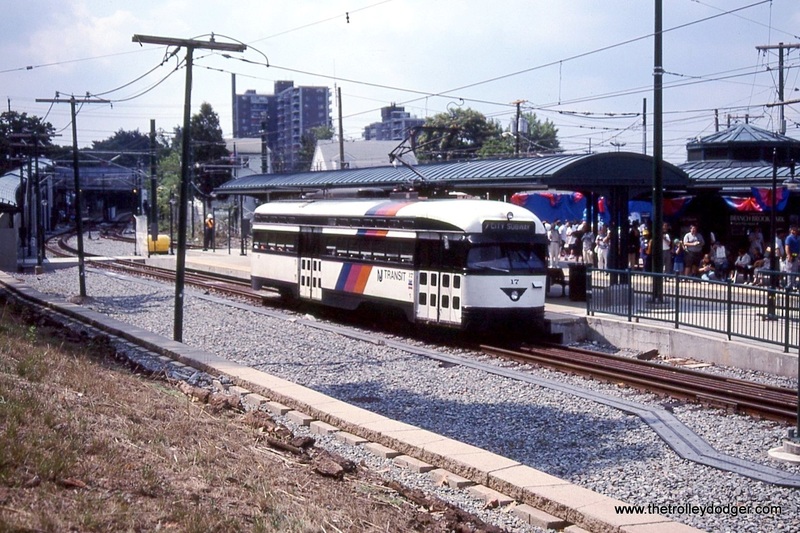 LVT 812 heading towards Allentown on the Liberty Bell Limited. 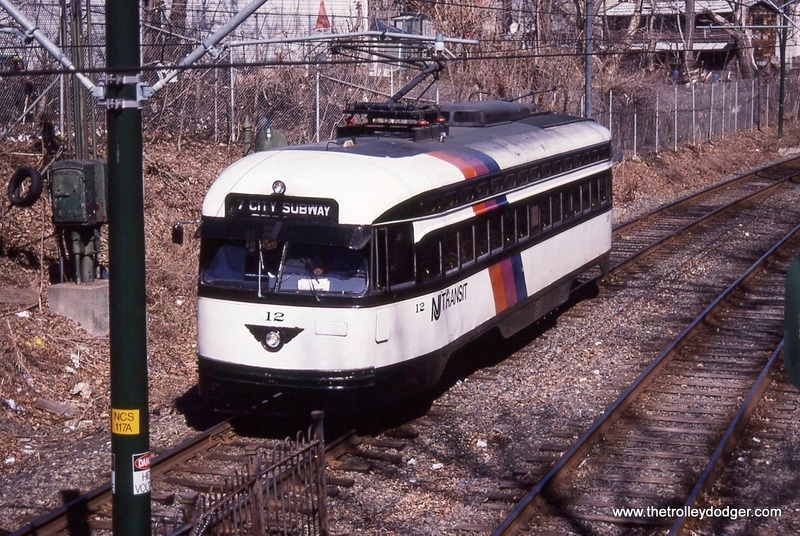 An LVT 1000-series car delivers newspapers (probably dailies from Philadelphia) in Allentown. LVT 1007 making a fantrip photo stop on the Liberty Bell Limited. A fan with a box camera is jumping off. 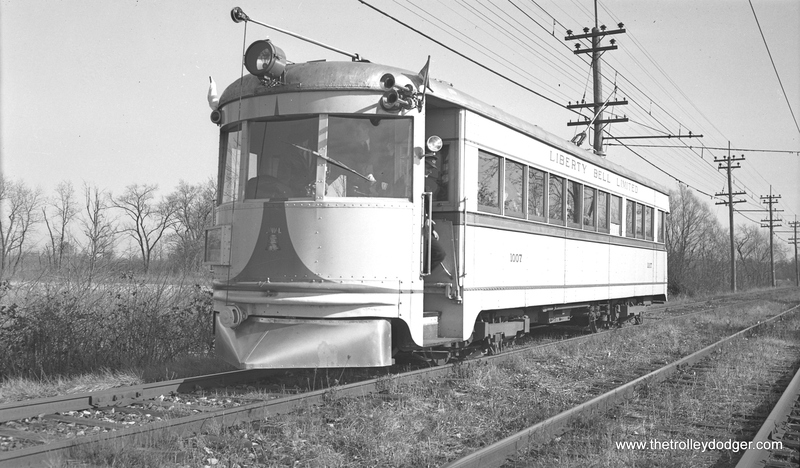 One other Indiana Railroad high-speed car had a second life, in addition to 55. 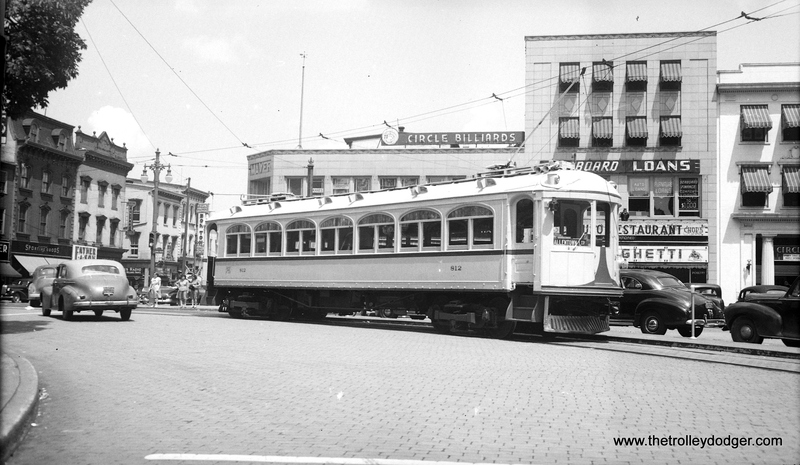 Car 65 became Cedar Rapids and Iowa City 120, shown here on June 10, 1953. From Don’s Rail Photos: “120 was built by Pullman in 1931, #6399, as Indiana Railroad 65. It was sold to the Crandic as 120 in 1941. 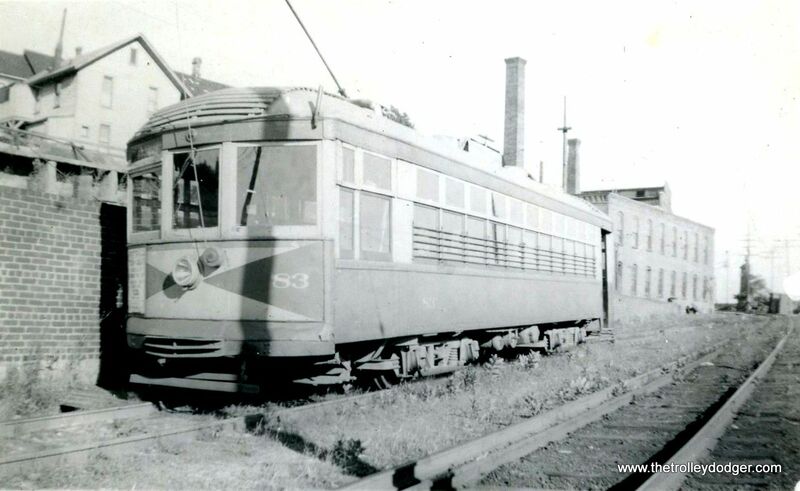 In 1954 it was purchased as the first car of the Illinois Electric Railway Museum and restored as IRR 65.” The last official run of a CRANDIC passenger train occurred on May 30, 1953. 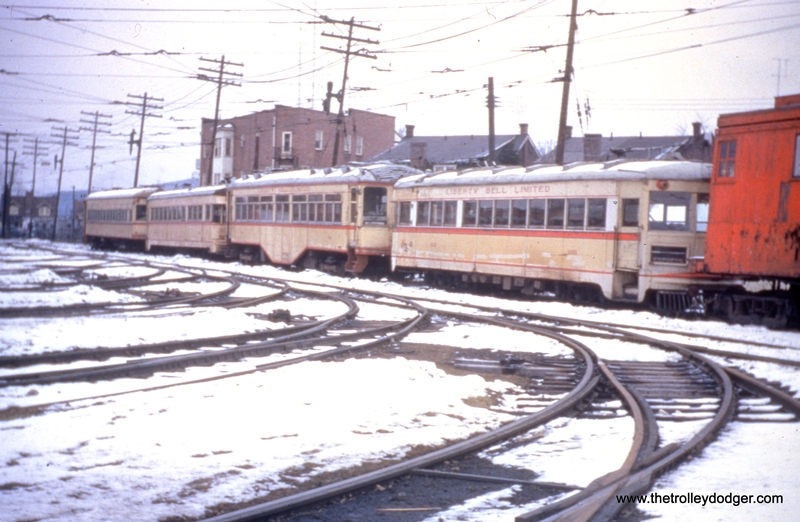 LVT 1001, 701, 1008 and 702 at Fairview car barn in Allentown on January 6, 1952, shortly before being scrapped. LVT 1006 in the scrap line at Bethlehem Steel on January 23, 1952. 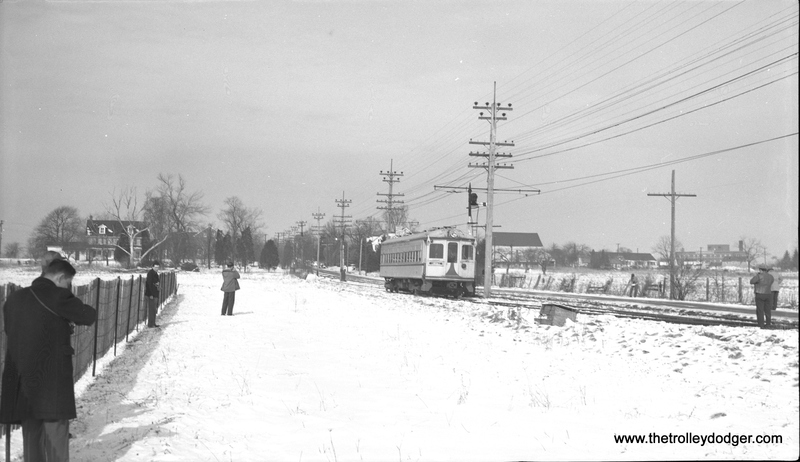 LVT 1030 loaded on a flat car at Riverside Yard on January 30, 1952, headed to Boston, and, eventually, the Seashore Trolley Museum in Maine, where it remains today in operable condition. Machine-generated Liberty Bell Limited tickets.